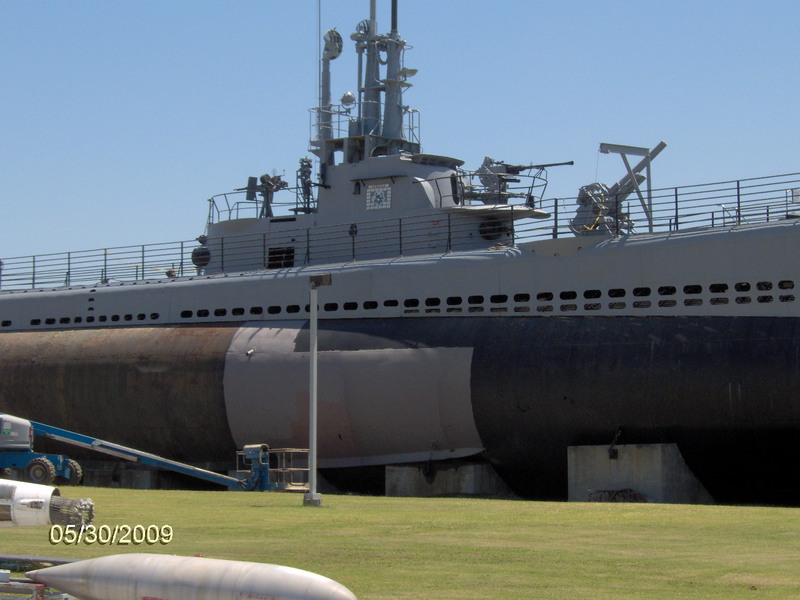 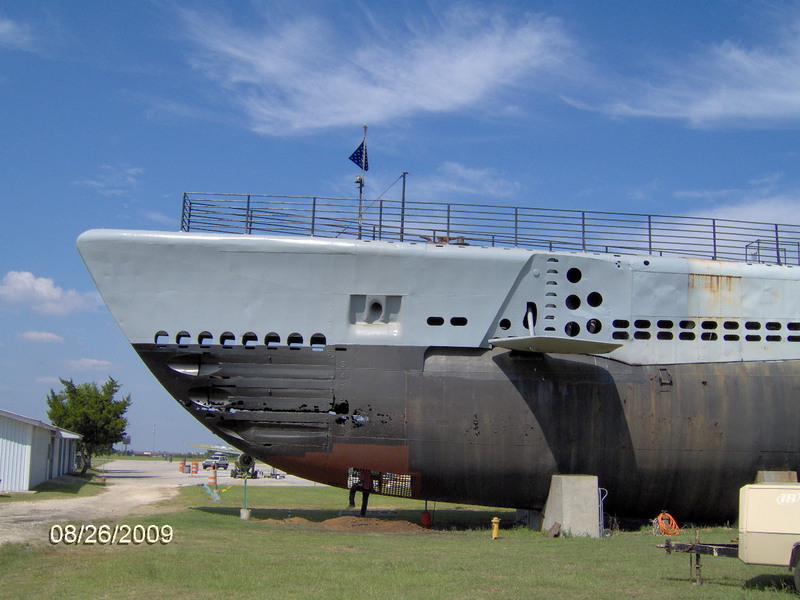 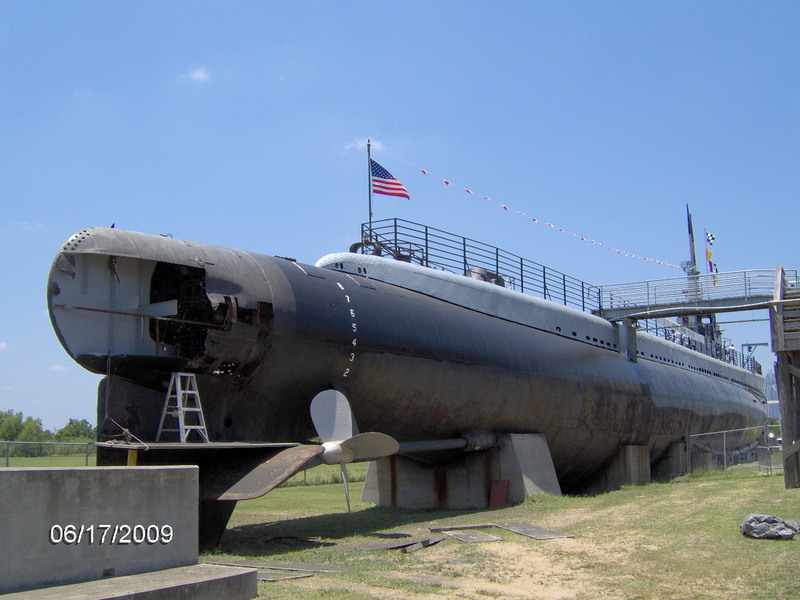 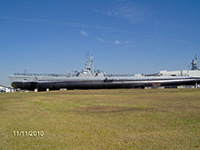 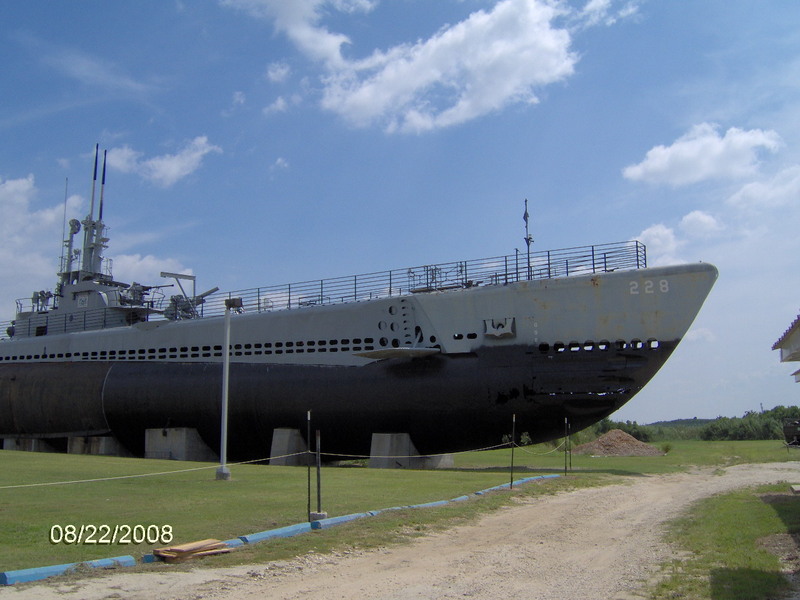 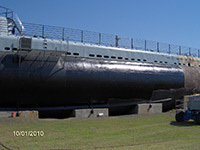 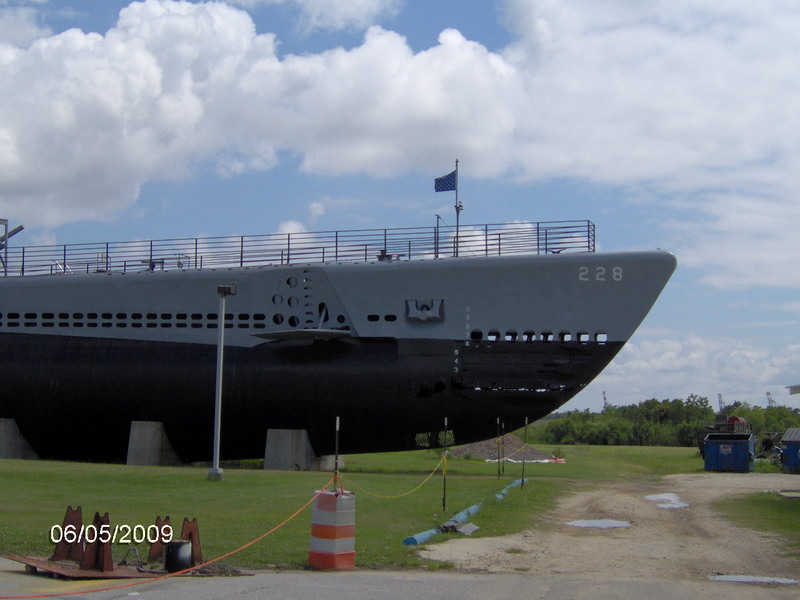 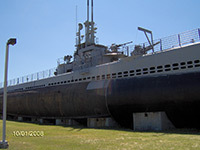 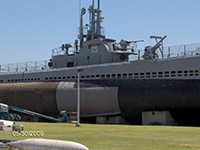 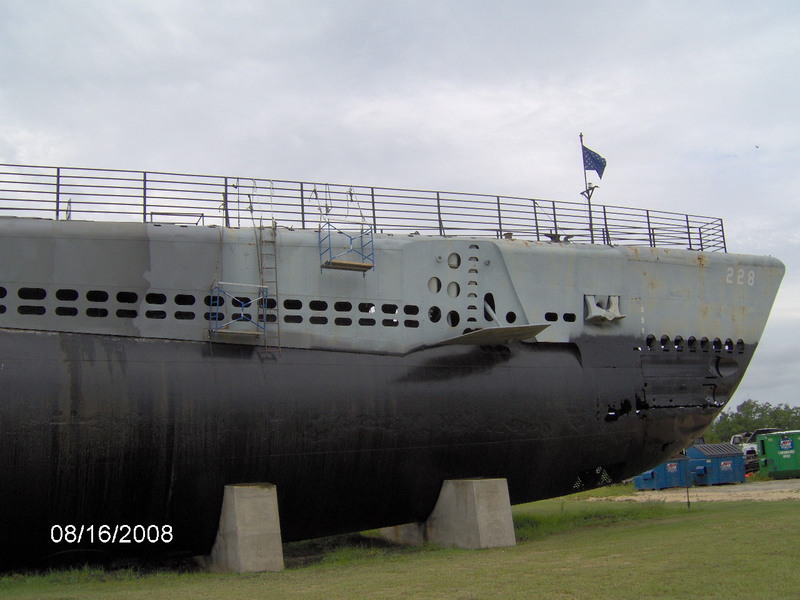 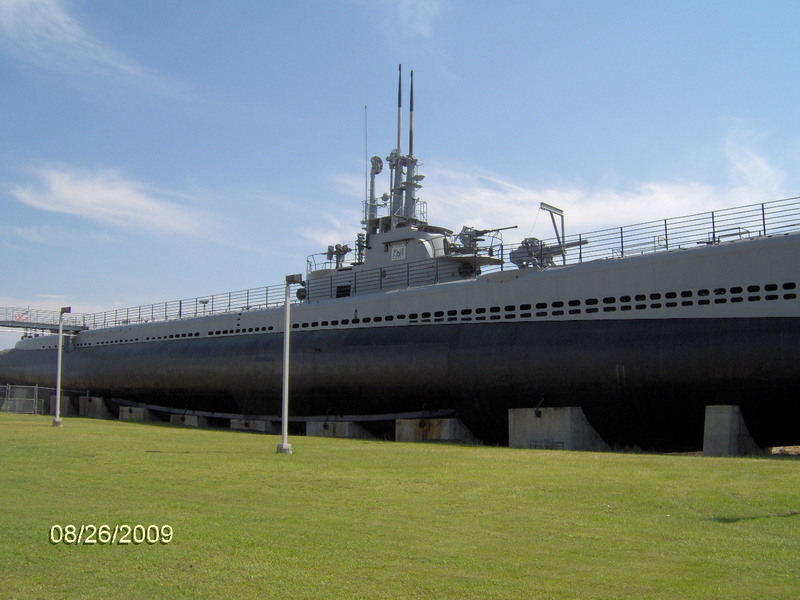 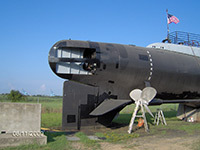 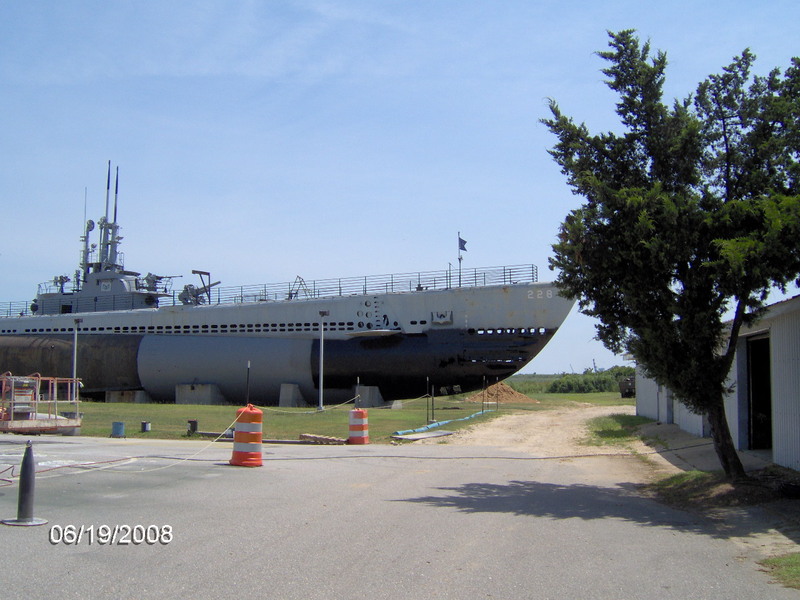 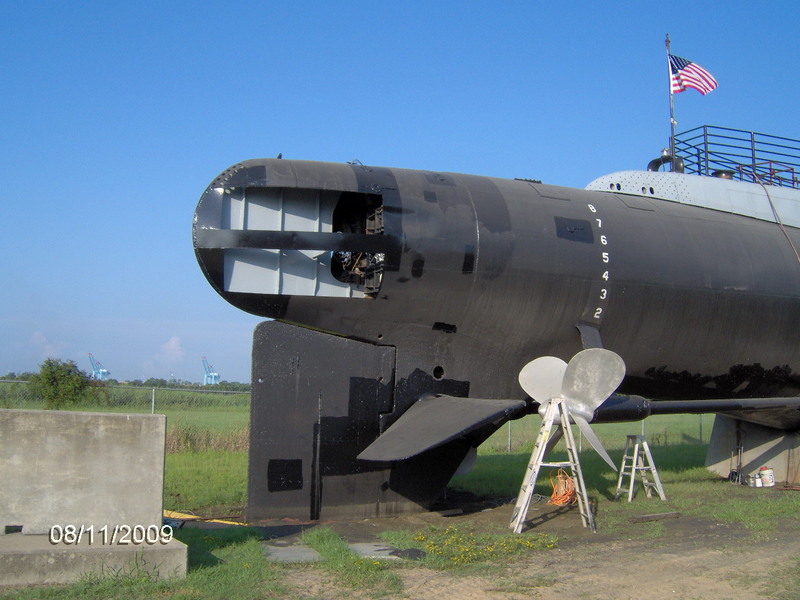 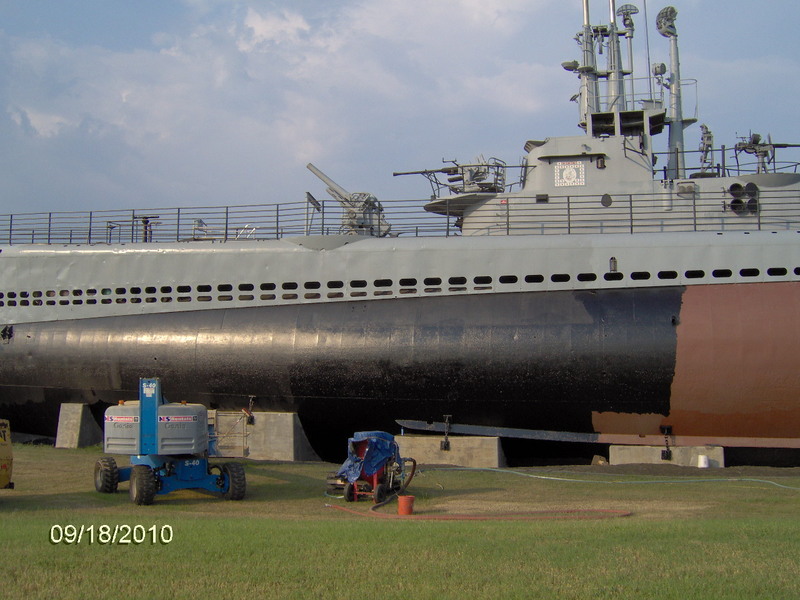 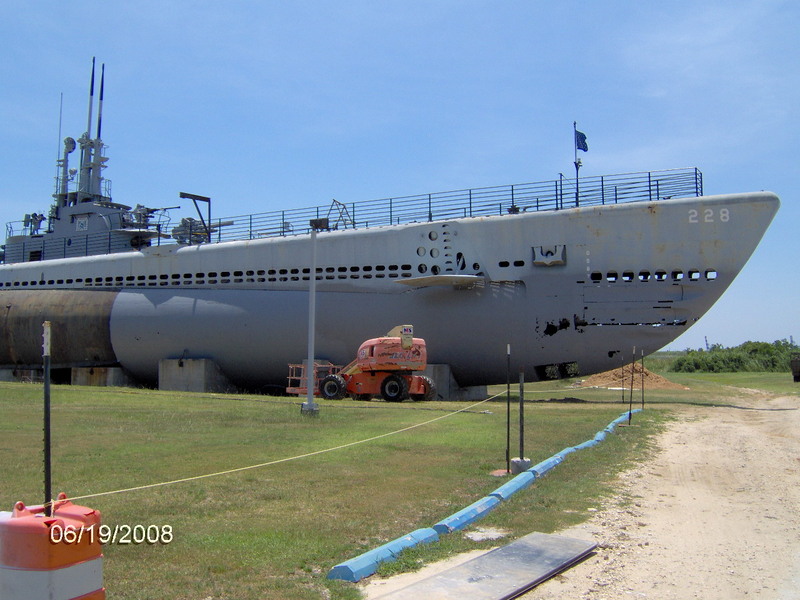 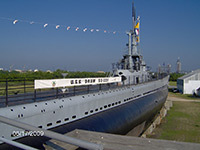 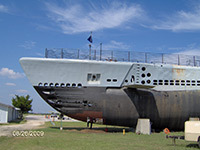 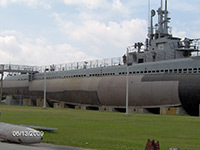 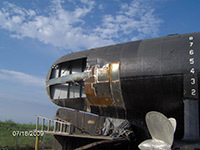 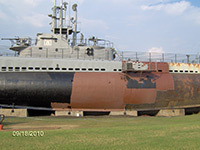 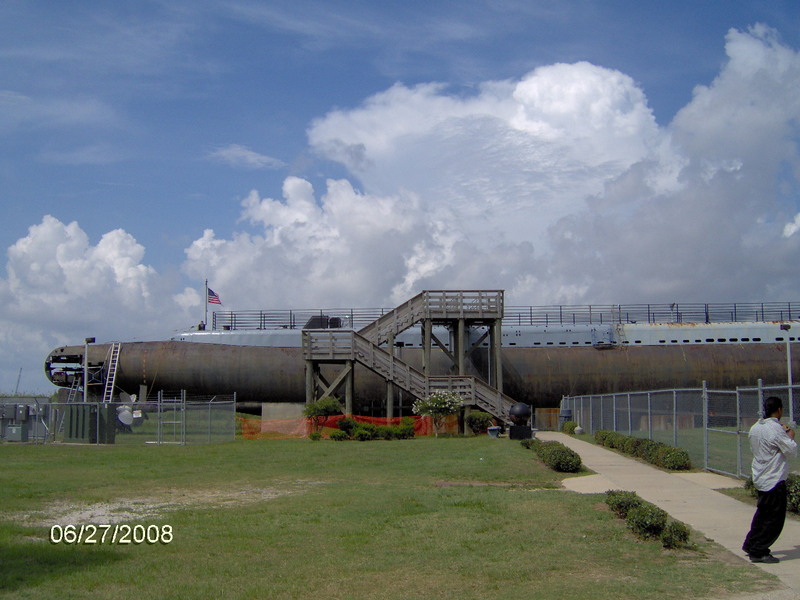 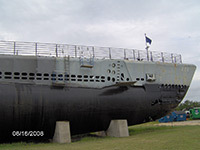 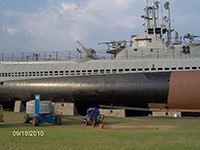 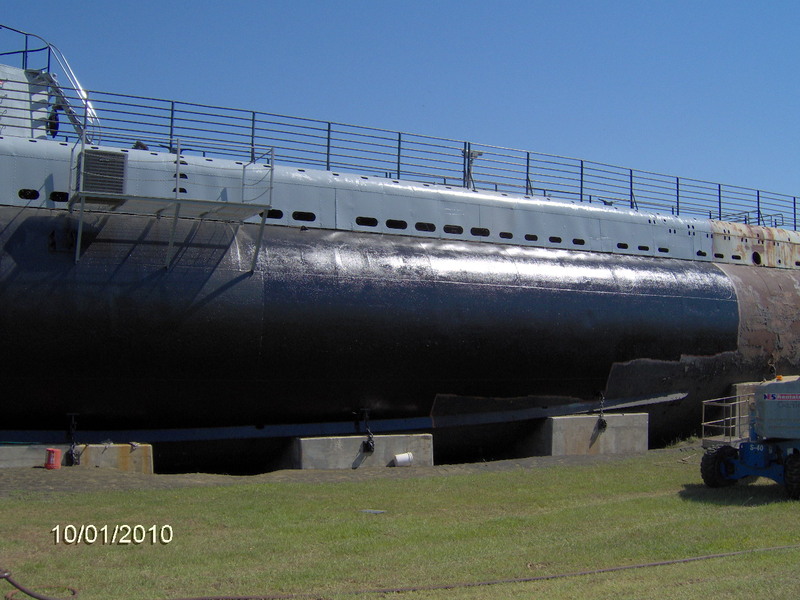 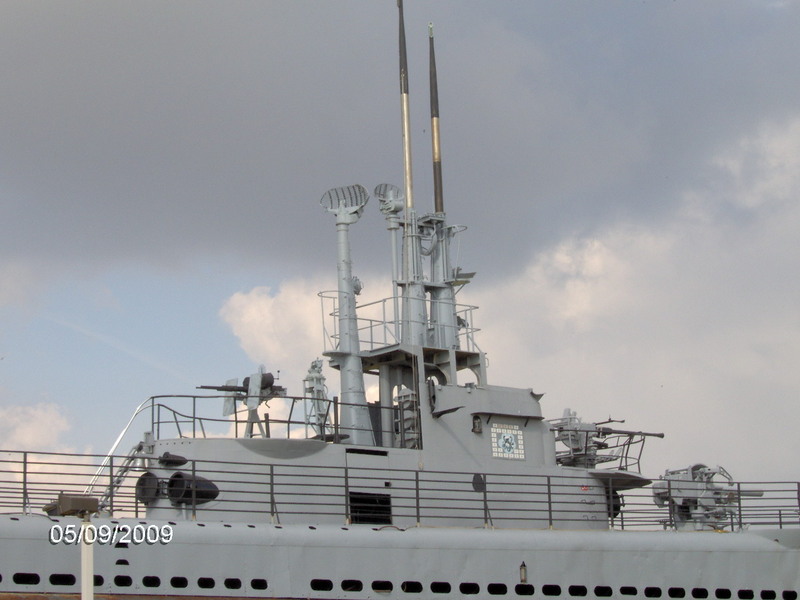 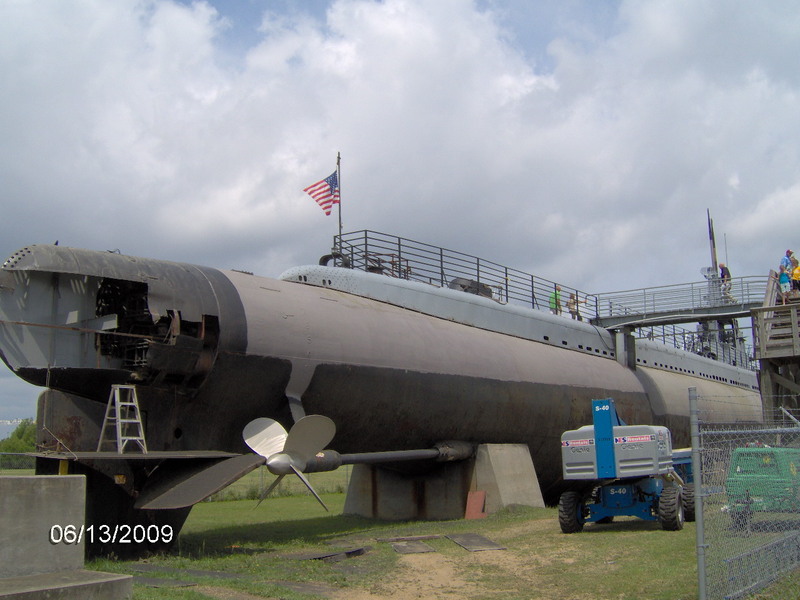 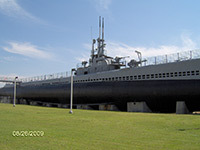 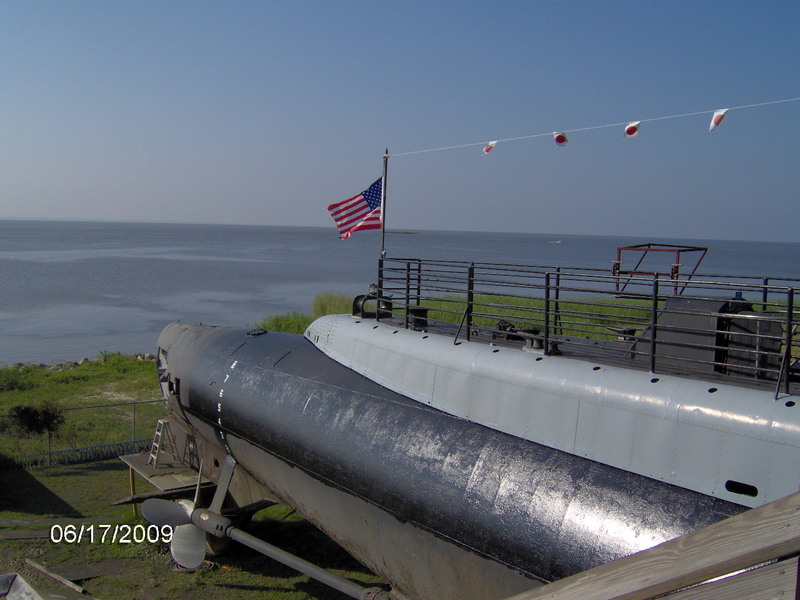 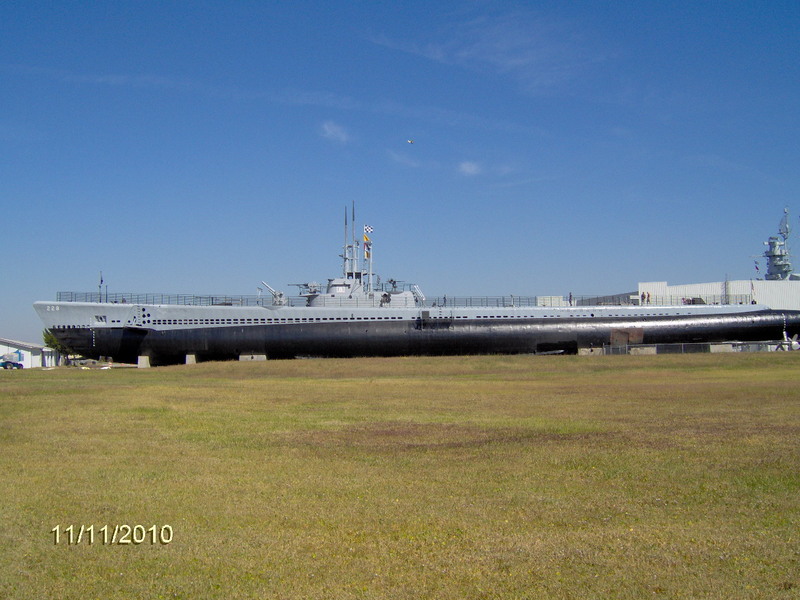 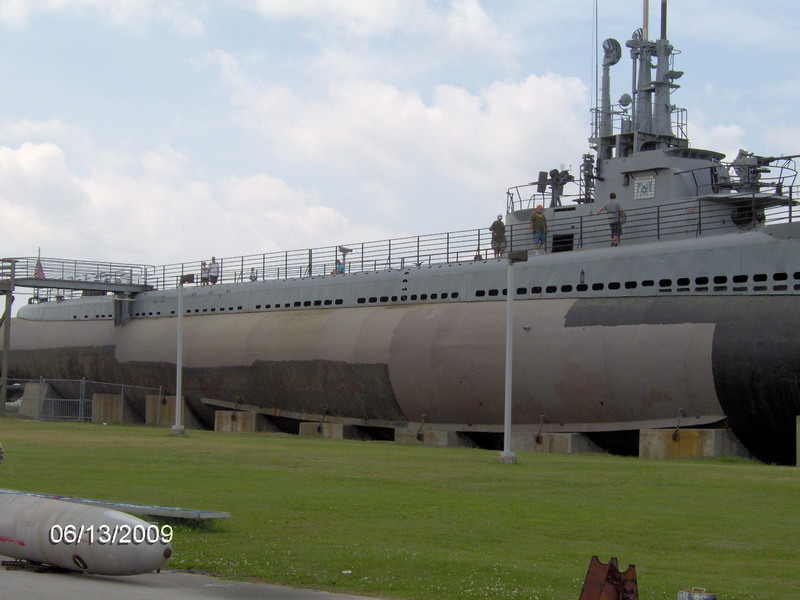 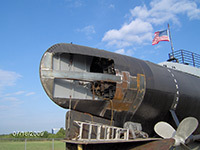 Around the year 2000, Tom Bowser, a MM1 (SS) nuclear submarine veteran, was passing through the Mobile, Alabama area. 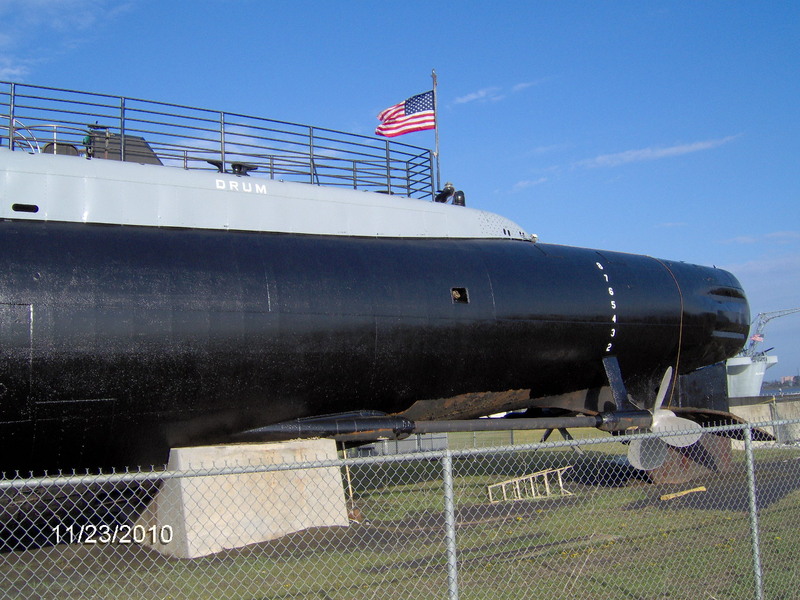 He spotted the USS Drum on a billboard and decided to stop by. He was able to make a few more visits on through 2004 and got to know Lesley Waters, a Battleship Park maintenance employee who was doing her best to take care of the Drum any way she could. 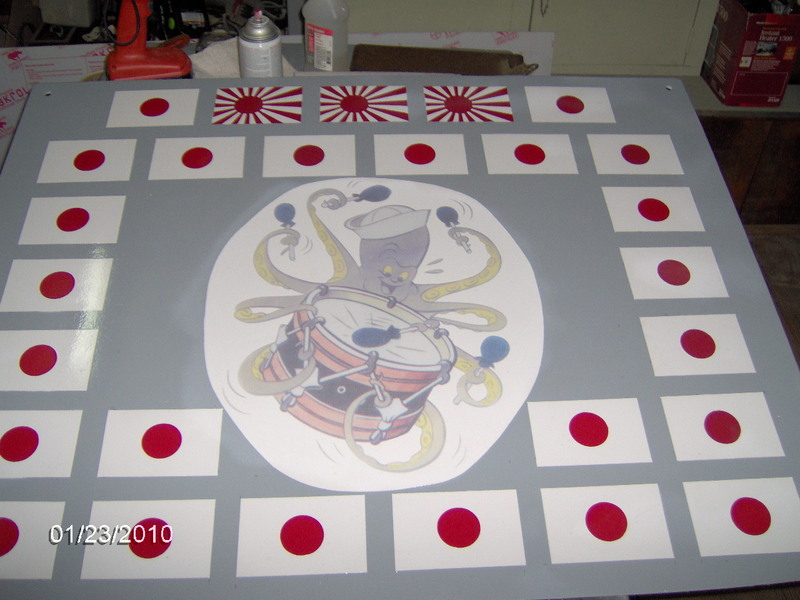 Lesley had already been working on the Drum for several years. In 2004, Tom's job changed to where he was driving through Mobile every other week so he would stop by on Mondays and Fridays to bring Lesley supplies and to help her. After Tom's wife passed away, he moved to the area and started working at Battleship Memorial Park in the gift shop just so he could help restore the Drum (when he wasn't in the gift shop). 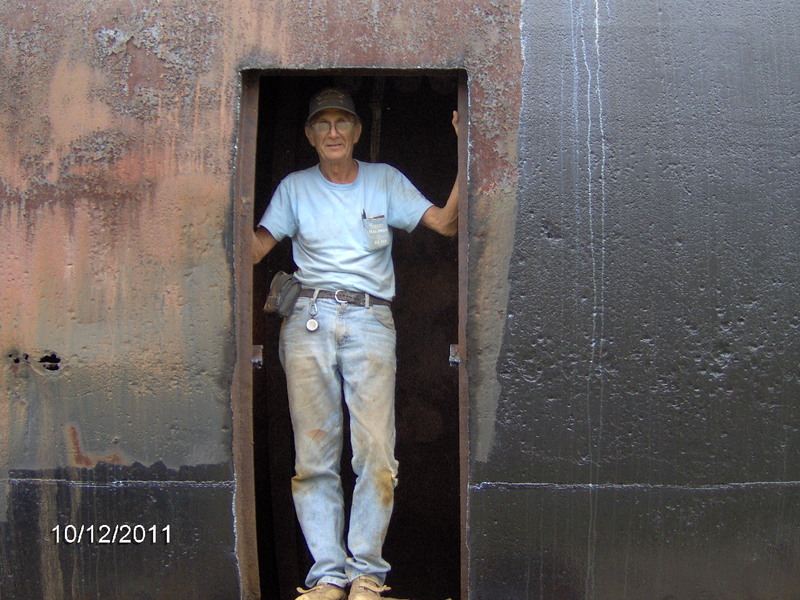 Finally able to retire, Tom spends 60 to 70 hours a week working with Lesley at restoring and maintaining the Drum as well as giving tours. 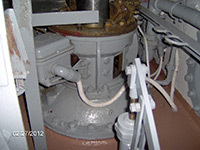 Below you will see photos of what Tom Bowser and Lesley Waters, along with other volunteer workers, have been doing with the USS Drum. 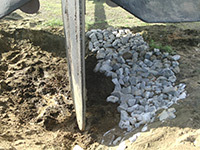 If you want to help them, click on the "How to Help" link up top for more information. 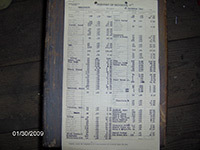 Click on any photo to see the full-size version. 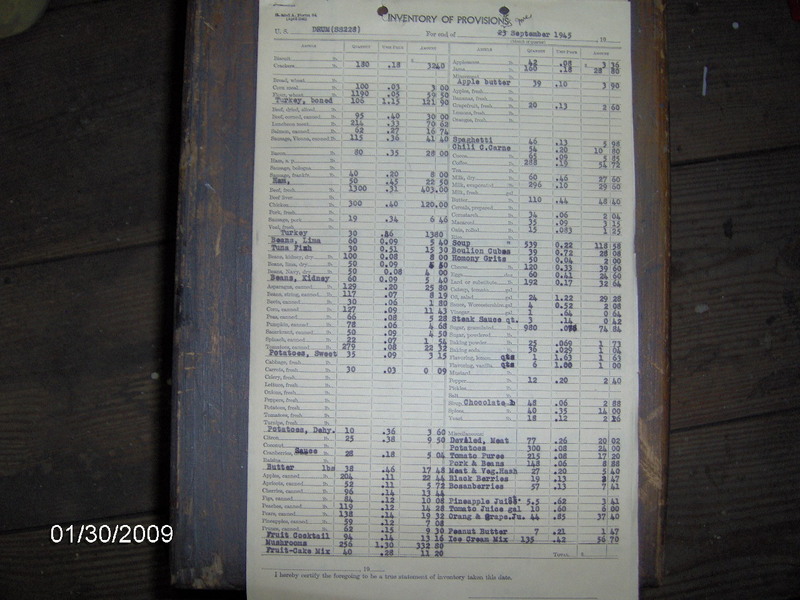 Restoration progress is shown in monthly reverse chronological order (newest monthly updates at the top). 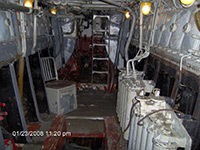 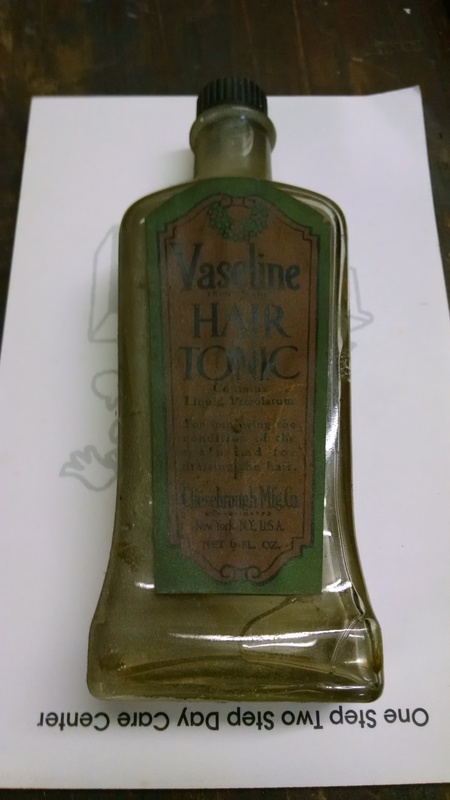 A bottle of Vaseline Hair Tonic was discovered in the aft torpedo room, along with a bottle of Woodbury Shampoo and a tube of Melle Shaving Cream. 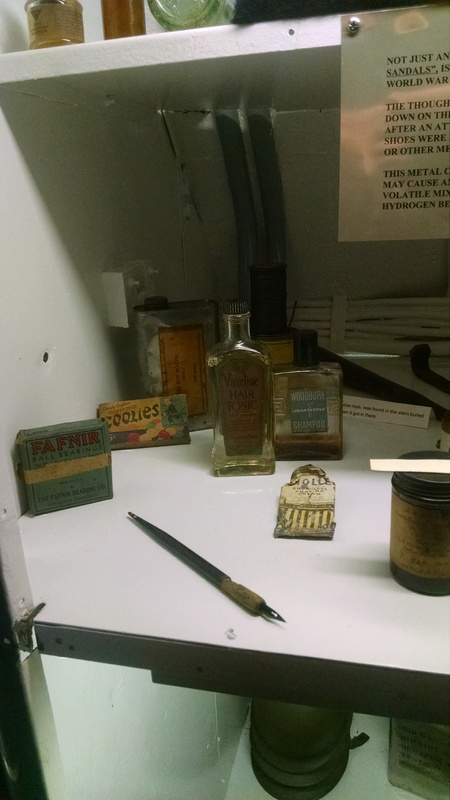 They were added to a display cabinet in the crews berthing. 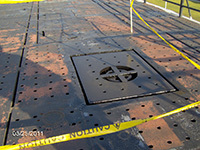 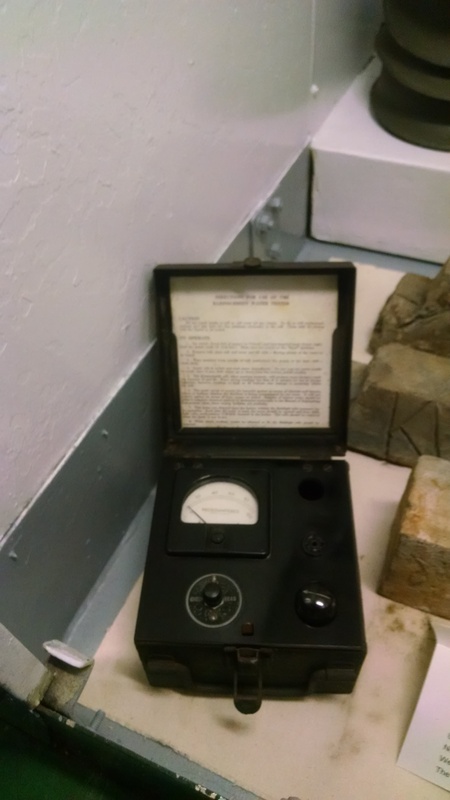 This black box was used to test the water from the distillers for salinity. 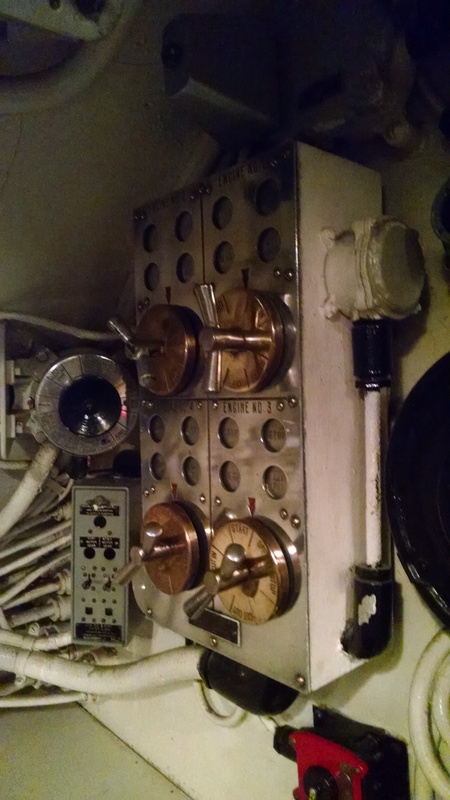 It still works! 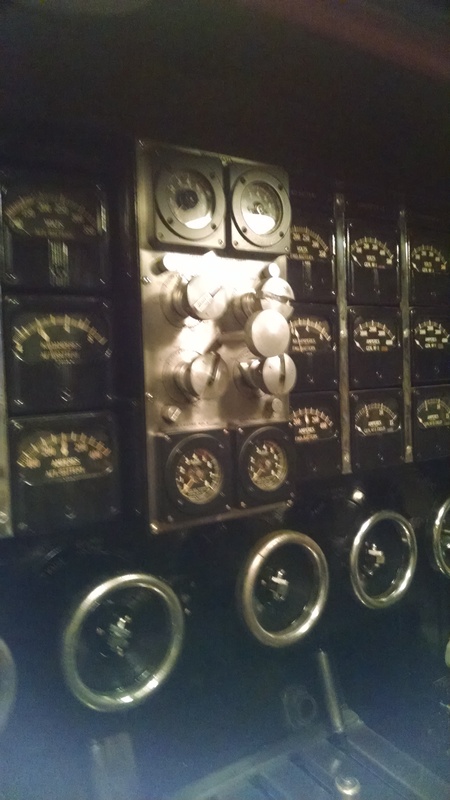 Lesley put the knobs back on the equipment in Manuvering. 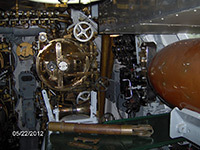 Tom and Lesley made a pusher for the Mk 27 torpedo and rigged it. 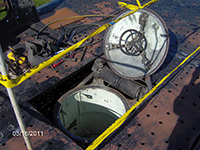 Tom and Lesley replaced the plexiglass on the engine in the aft engine room and moved the light bulbs for easier viewing. 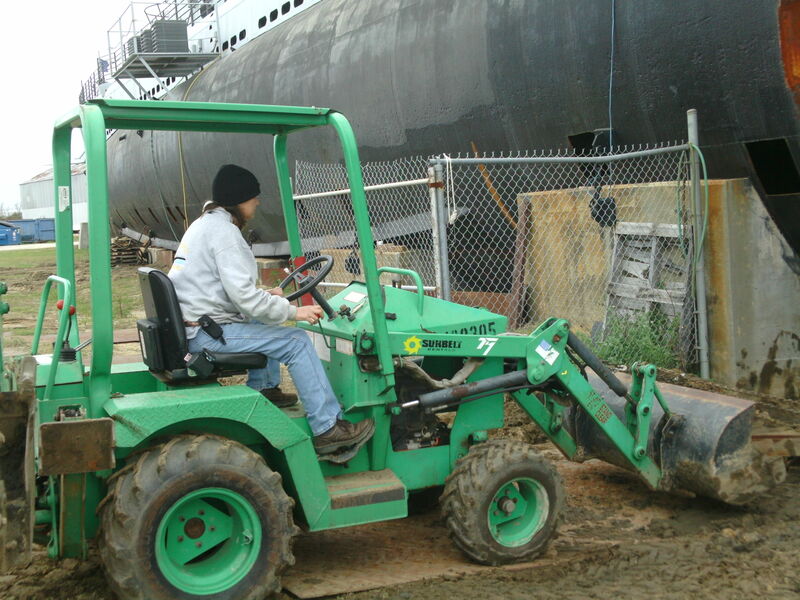 Tom and Lesley had to deal with a lot of rain these months. 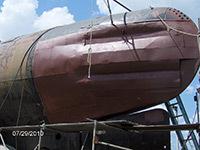 They worked on replacing the frames and skin in MBT #4a. 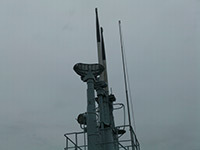 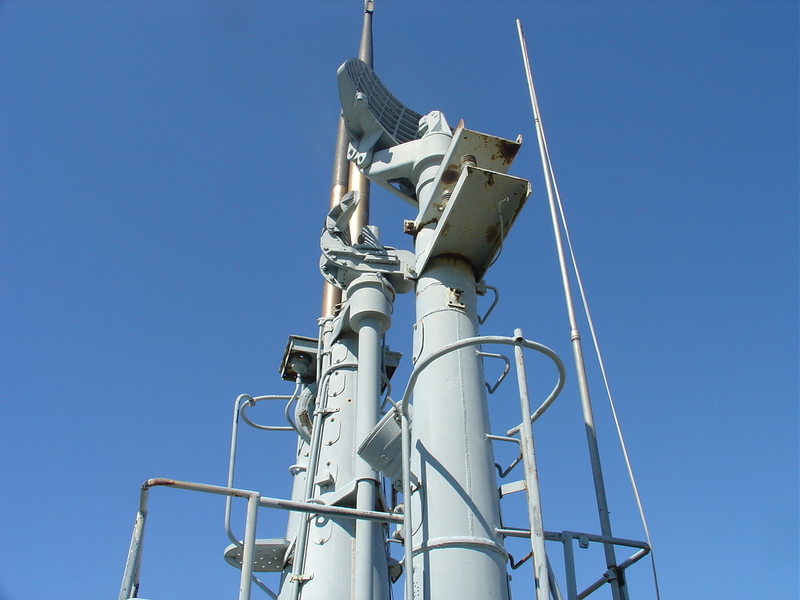 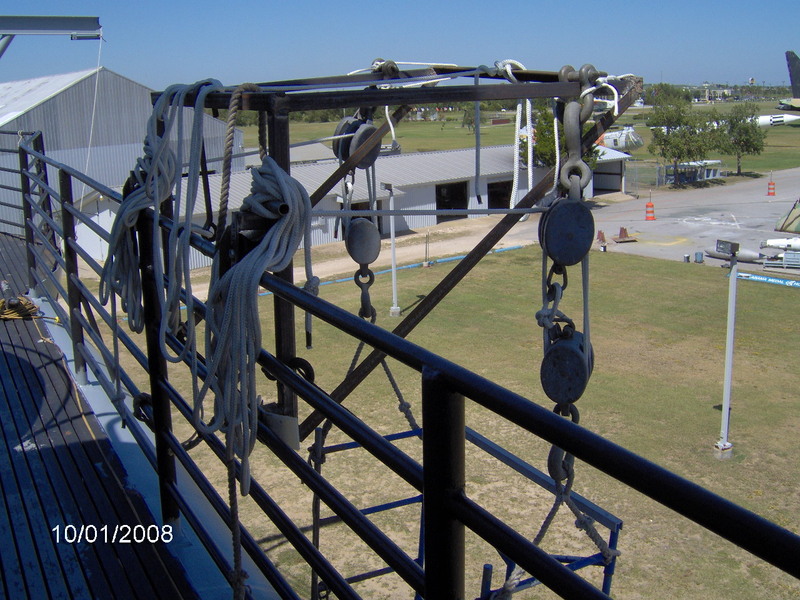 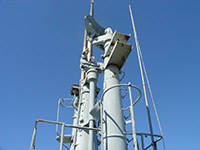 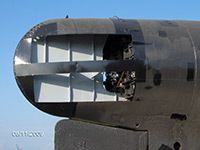 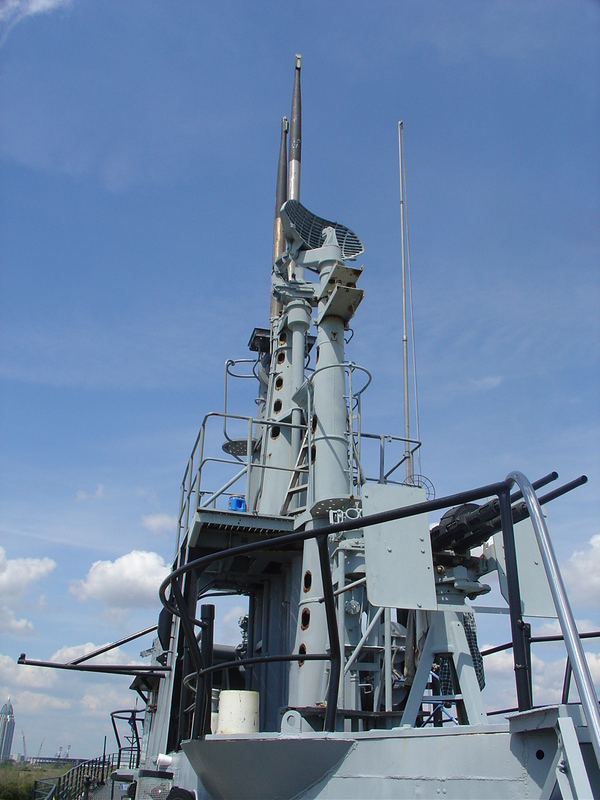 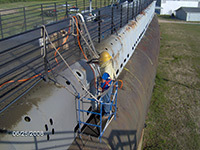 They also got the use of a man lift to sand down the periscopes and paint them black with clearcoat. Digging out around and under the boat continued into early March. 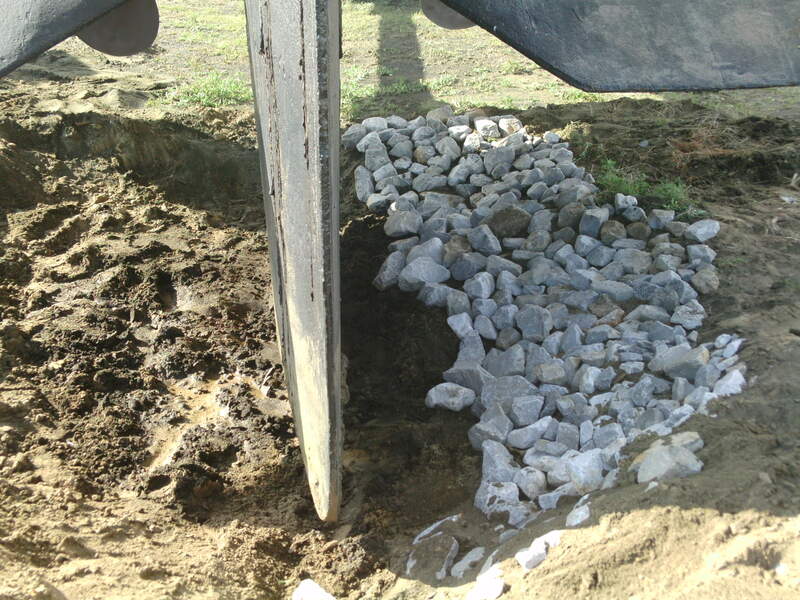 Tom and Lesley dug out around the rudder, put in a drain line, and lined the hole with stone. 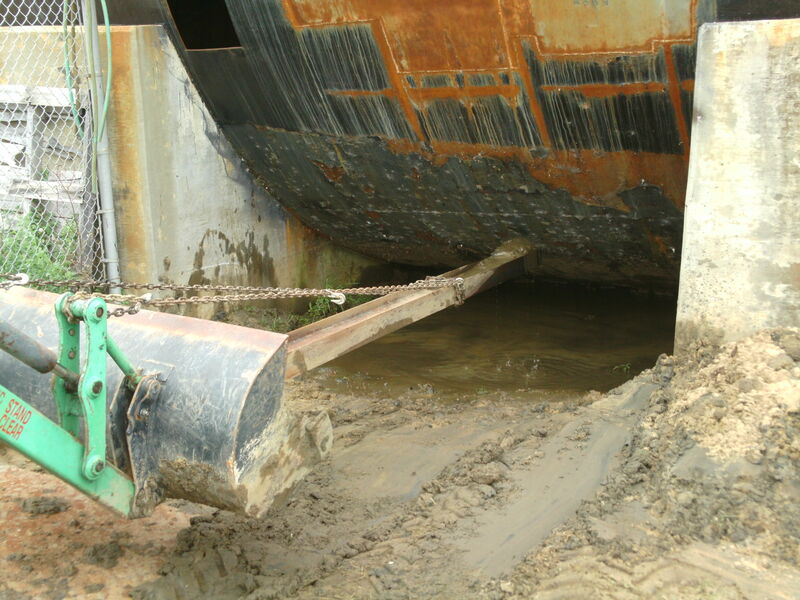 In February, Tom and Lesley were able to use a small backhoe to begin digging out under the hull so that area could be sandblasted and painted. 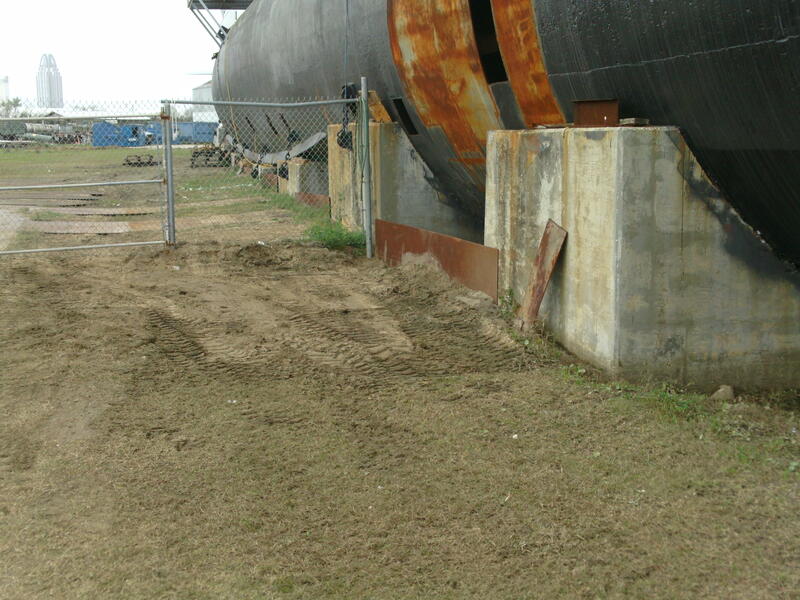 They also resloped the ground around the boat so that water would drain away from it. On through the fall and into winter, Tom and Lesley continued cleaning out the remaining tanks and removing the lead. 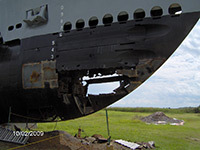 First they had to go in and air chisel the melted plastic off the straps and lead. Then they had to cut the straps that held the lead down. 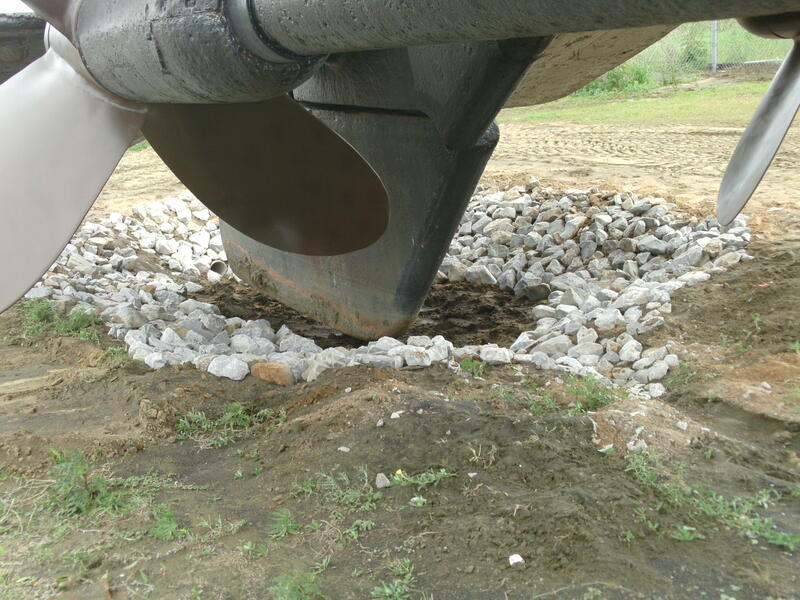 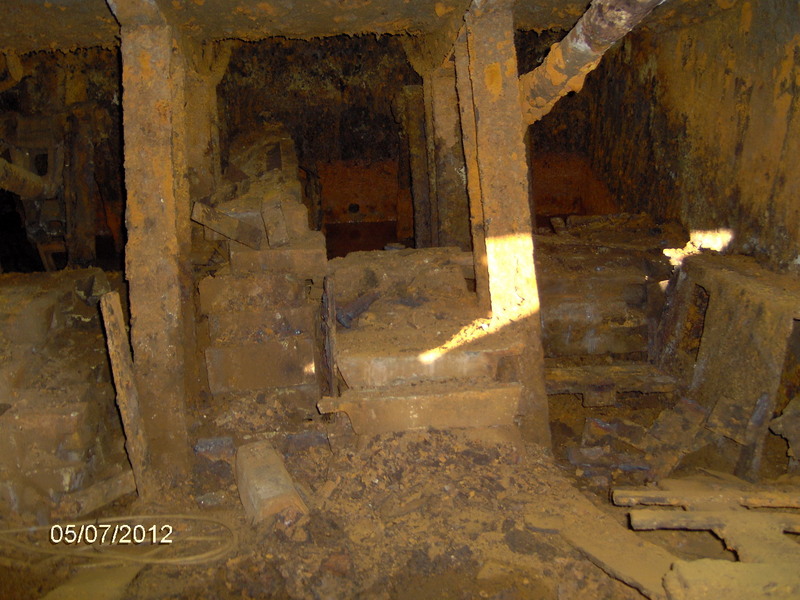 They ended up with a total of 116 tons of lead ballast removed. 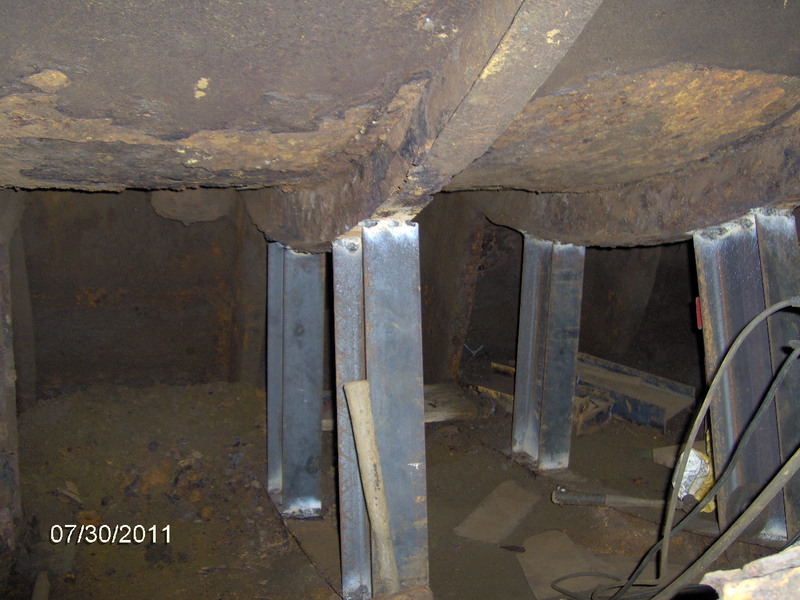 Lastly, they went back in and removed the remaining structure that supported the lead. 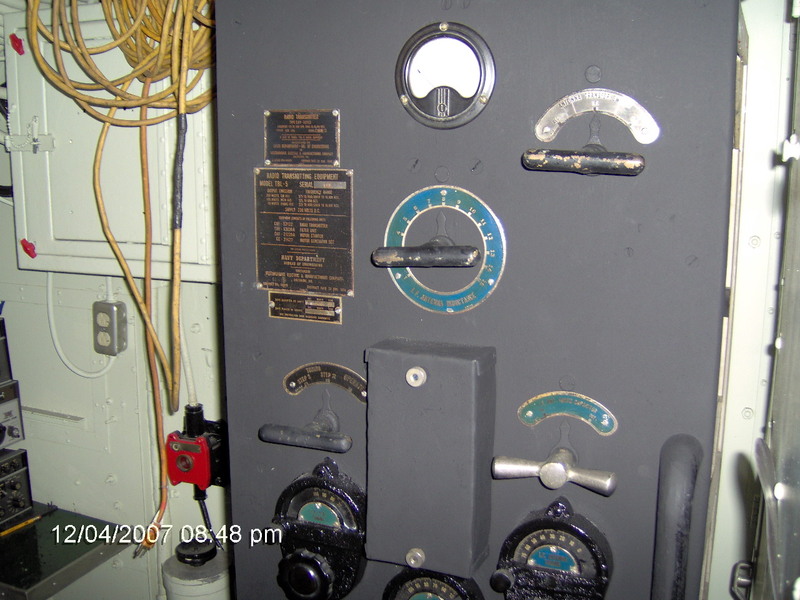 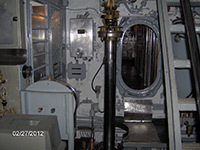 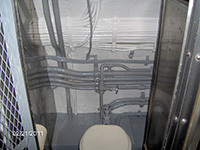 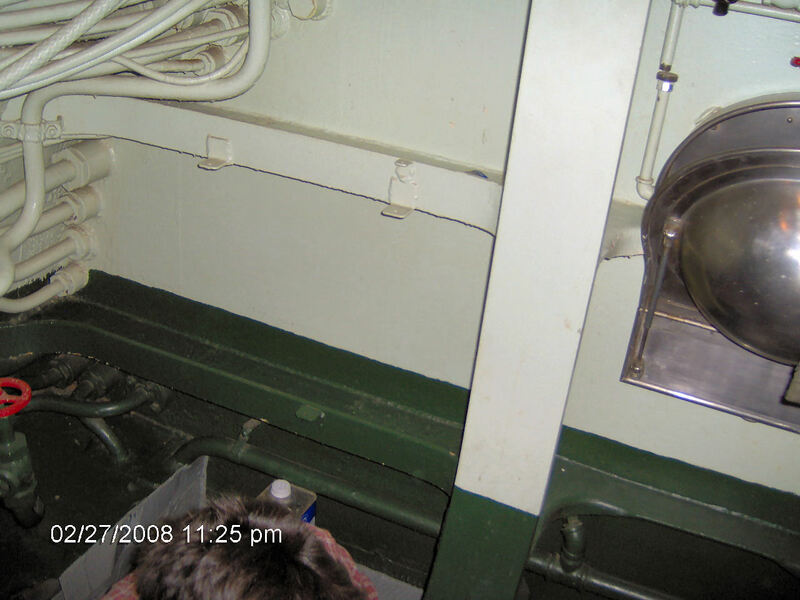 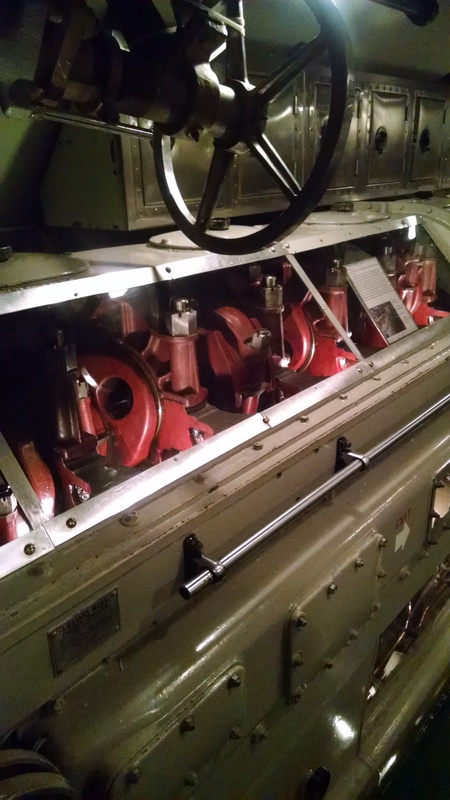 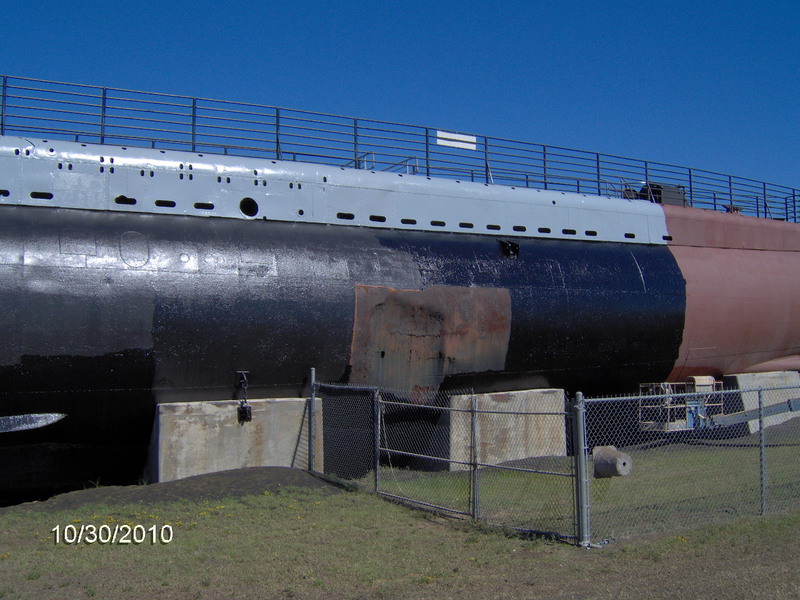 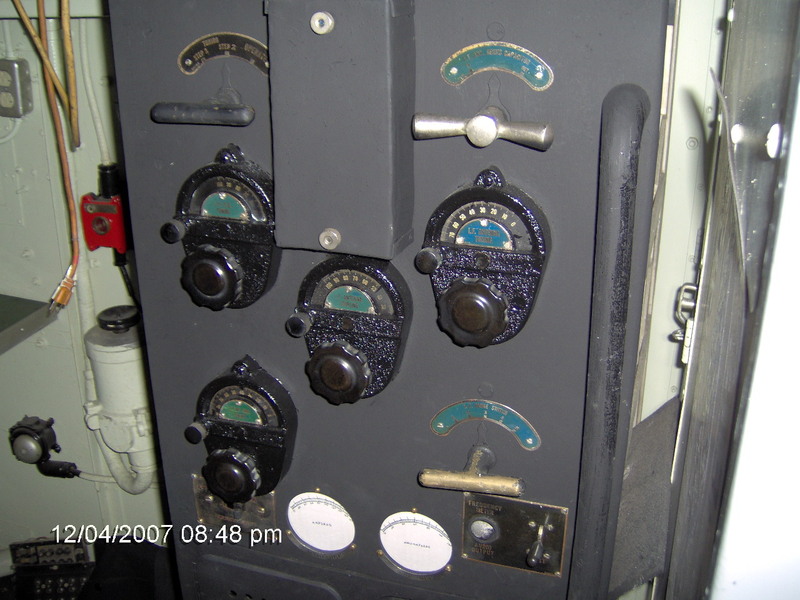 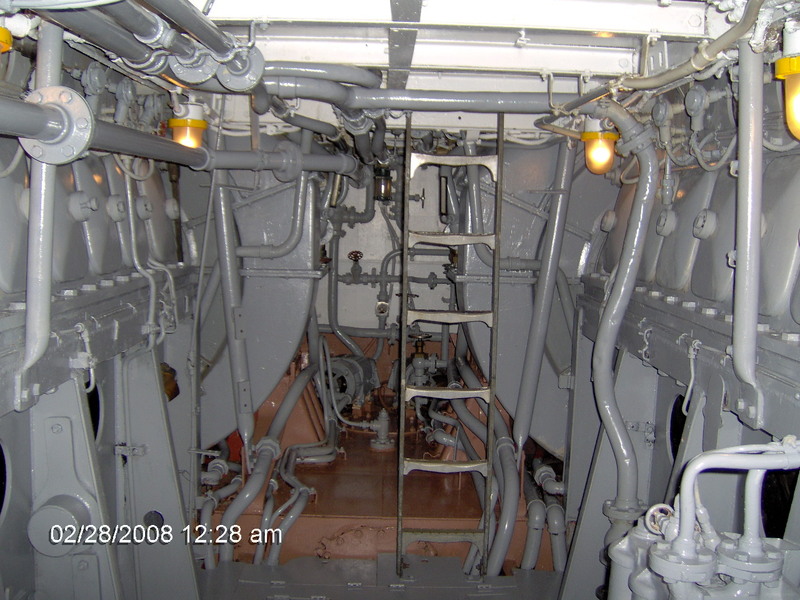 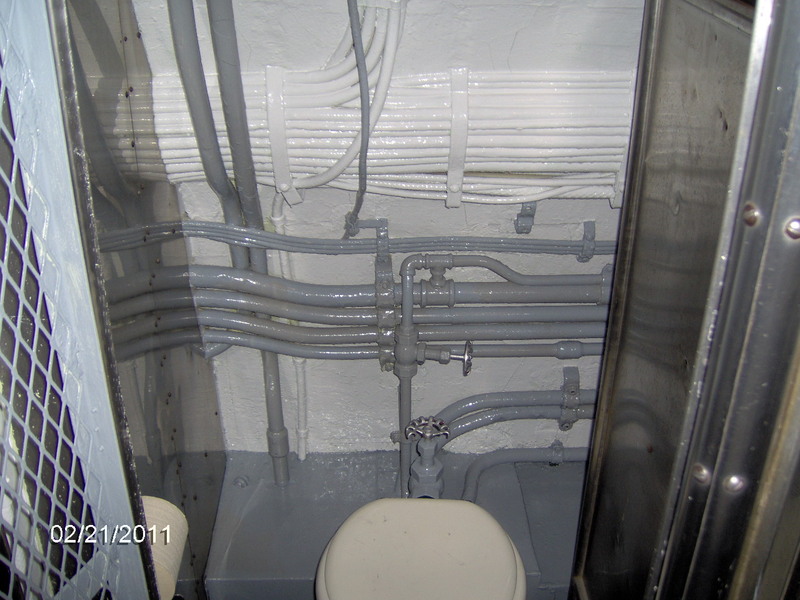 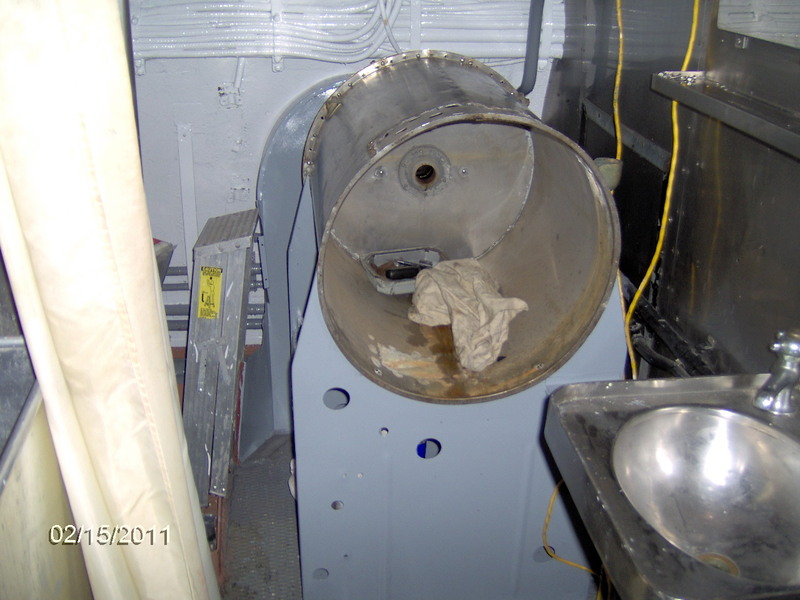 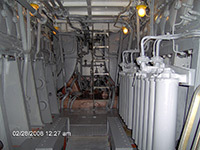 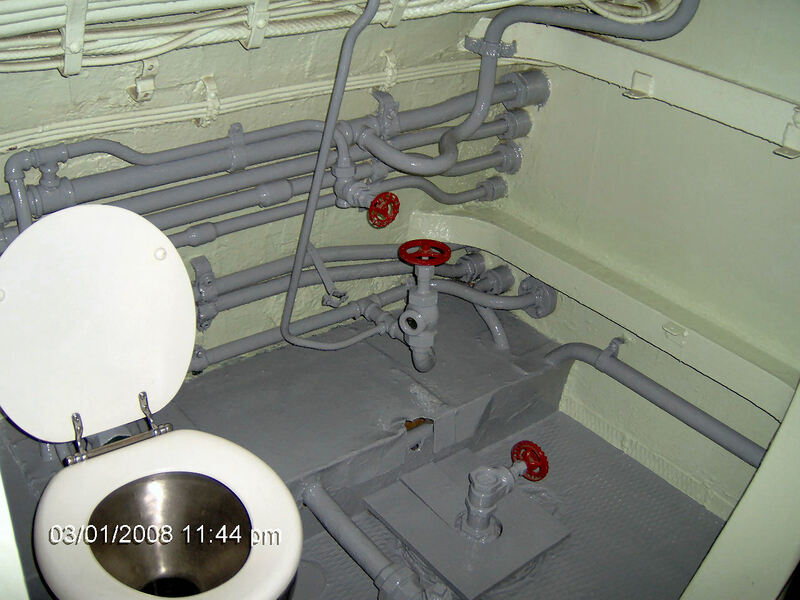 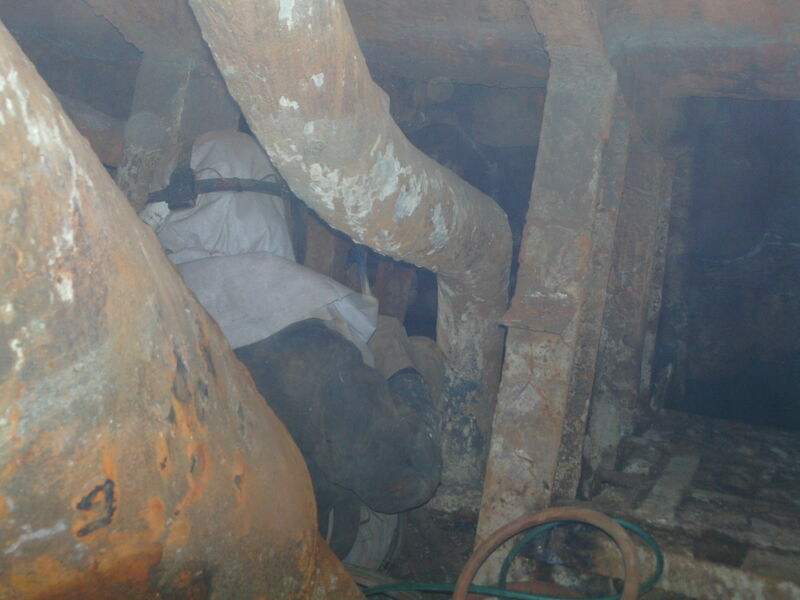 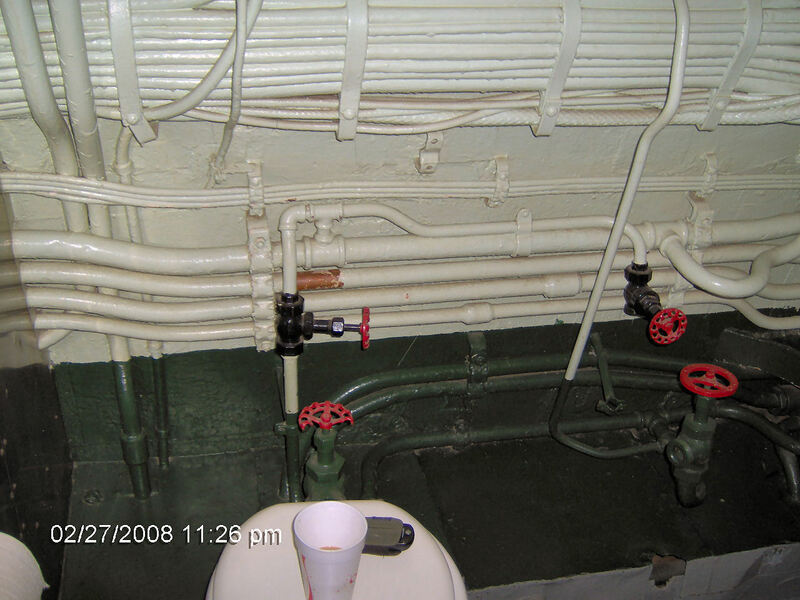 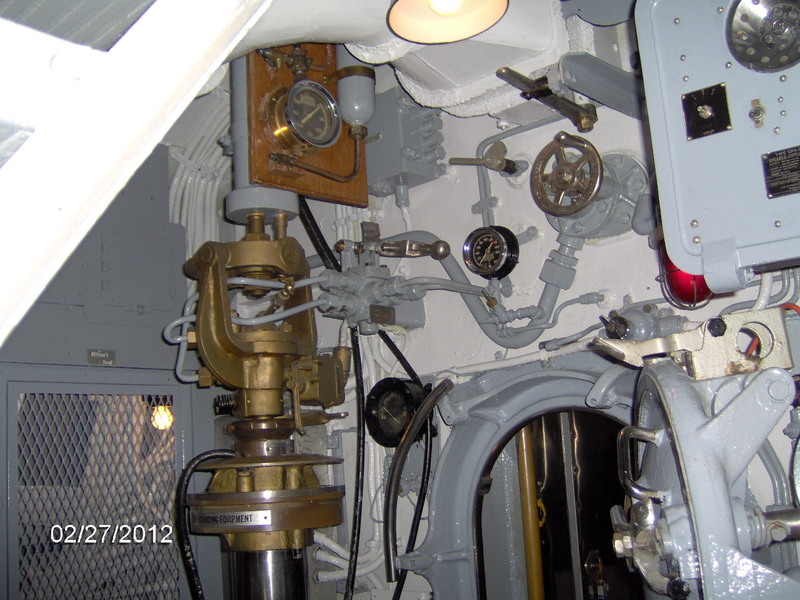 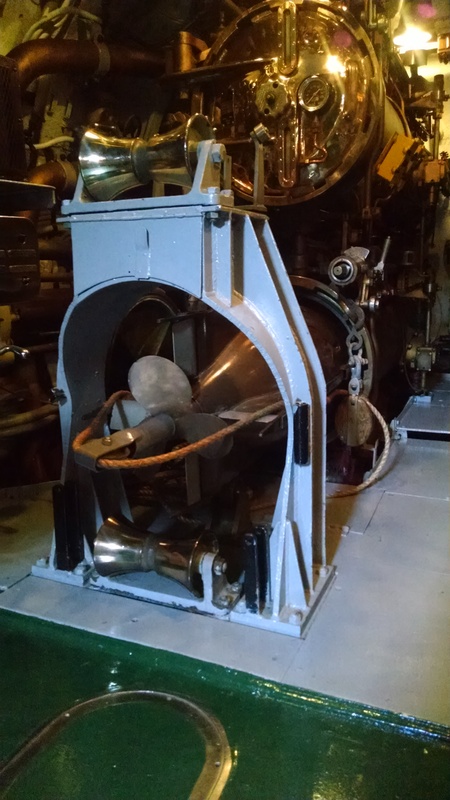 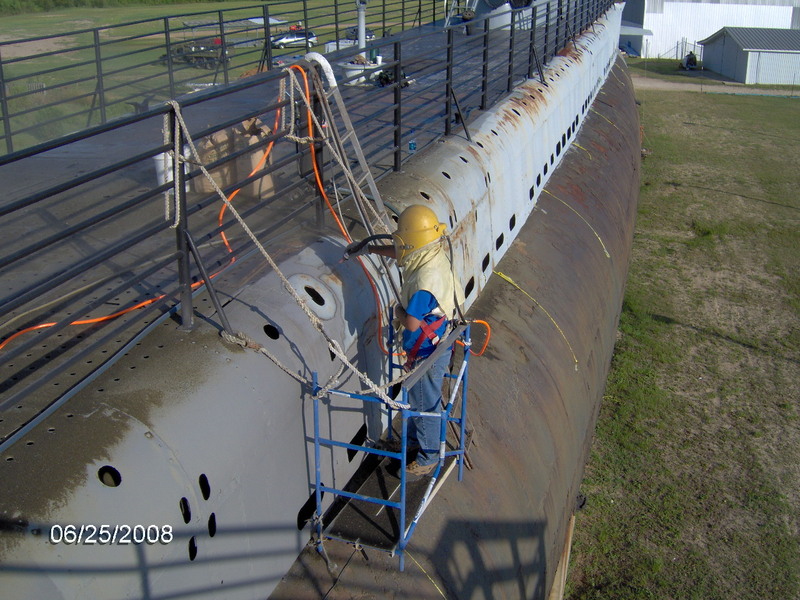 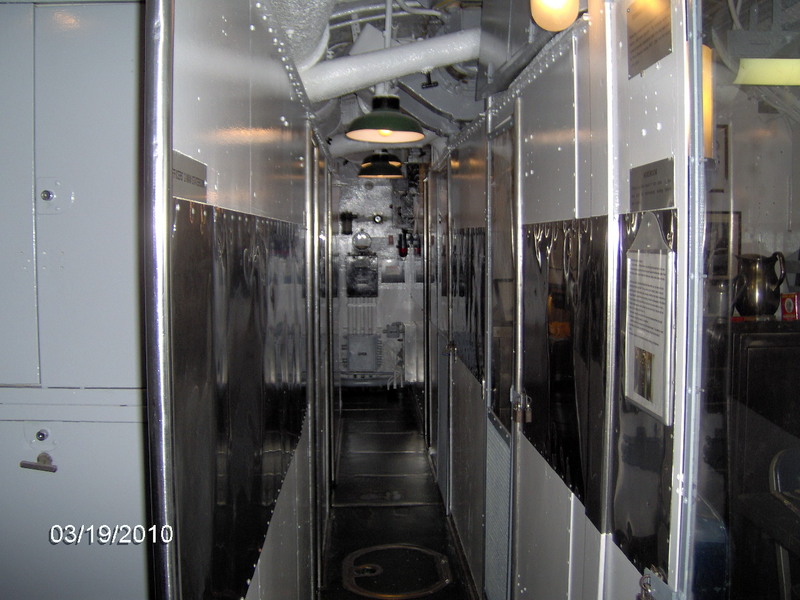 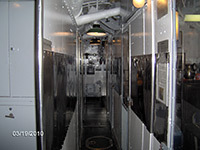 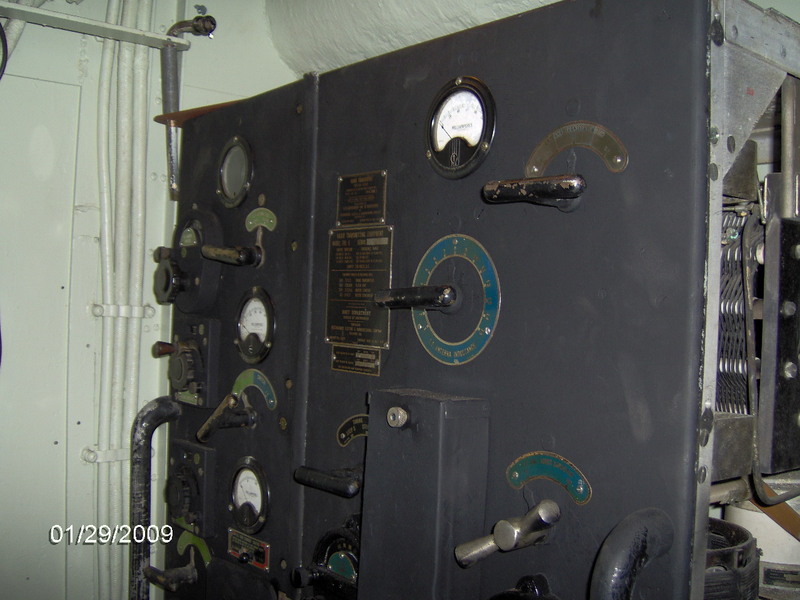 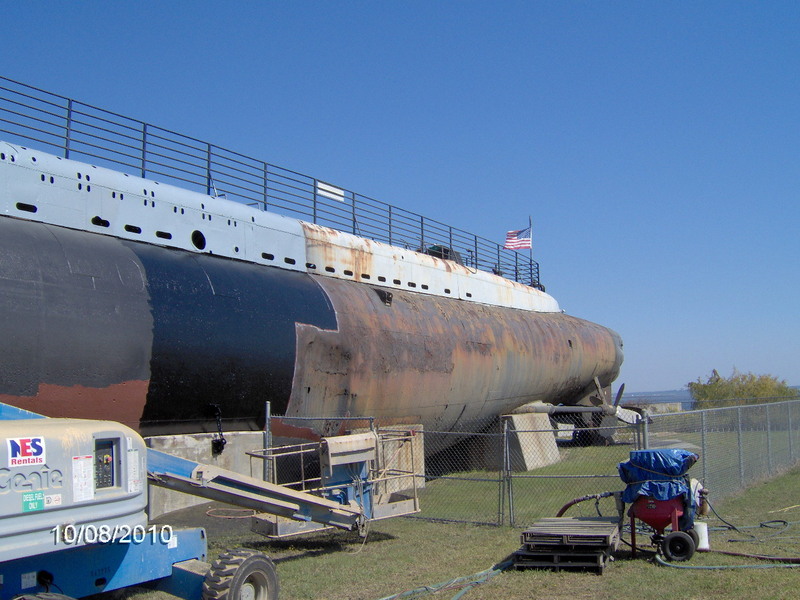 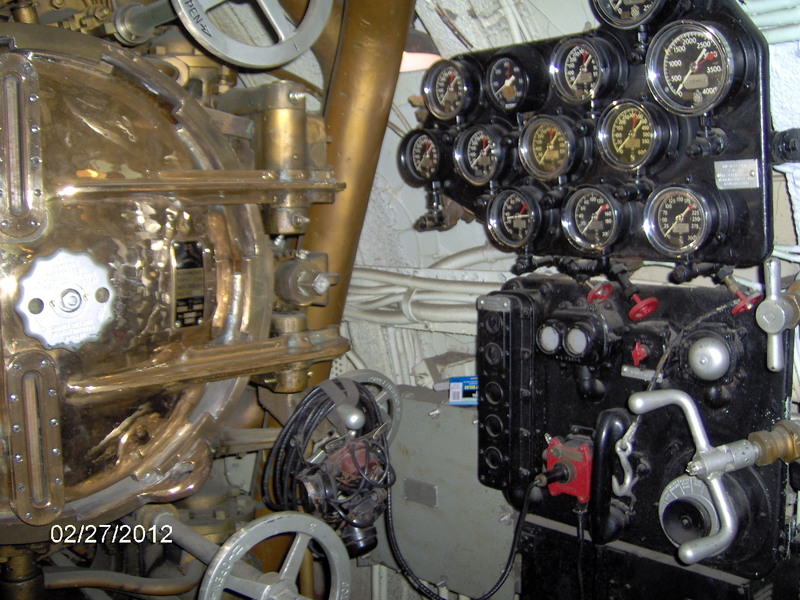 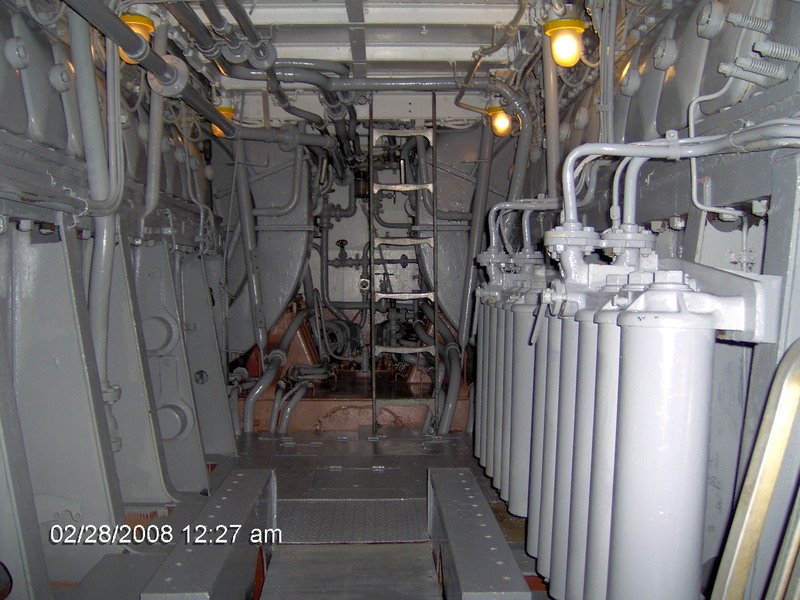 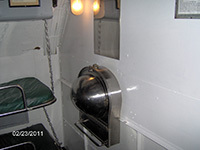 "In April or May I emailed the Director of the museum ship program and told him we were about to start sandblasting the tanks and I asked him if we had to put the lead ballast back in when we were done. 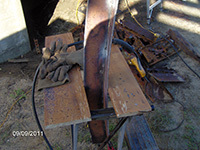 He replied back that no, we did not need to and we could sell the lead for restoration money. 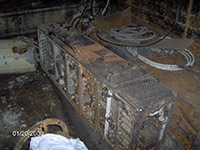 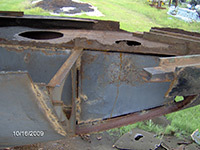 I contacted several scrap dealers and got a good quote from one that would even send out two men to help get it out. That's what we've done for the last three months. 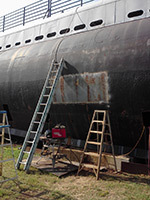 First I had to go in and cut the straps holding the lead in place, which meant I had to first pump and vacuum out the water, air chisel the rust away, and then cut with a torch or grinder. 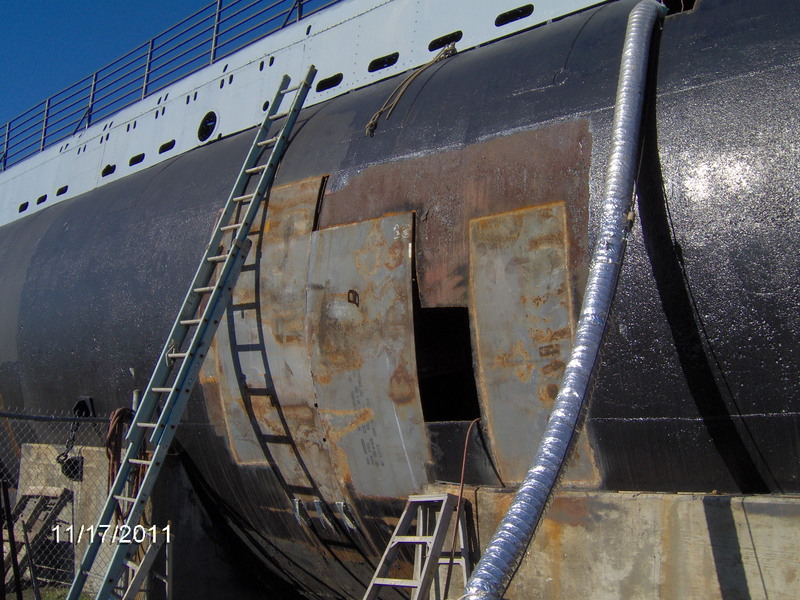 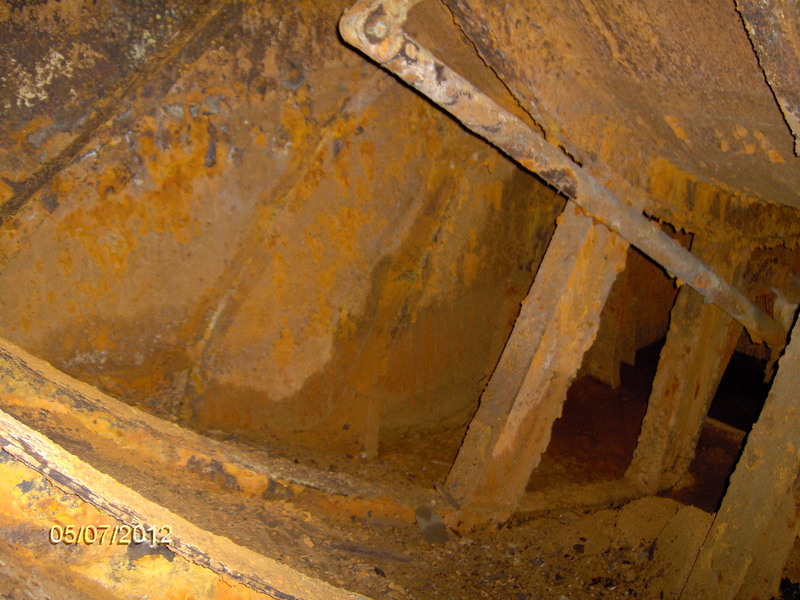 After we got the first 42 tons out I called in a company to vacuum out the mud and oil from two tanks and dig out from under the hull in three places so I could cut holes in the bottom of the tanks to drop the lead out with the air flasks in them. We ended up with 83.5 tons of lead, in 50 and 100 pound bricks." 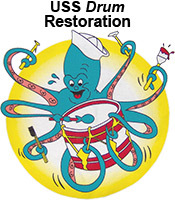 "We were paid $100,288 which all goes to the Drum restoration fund. 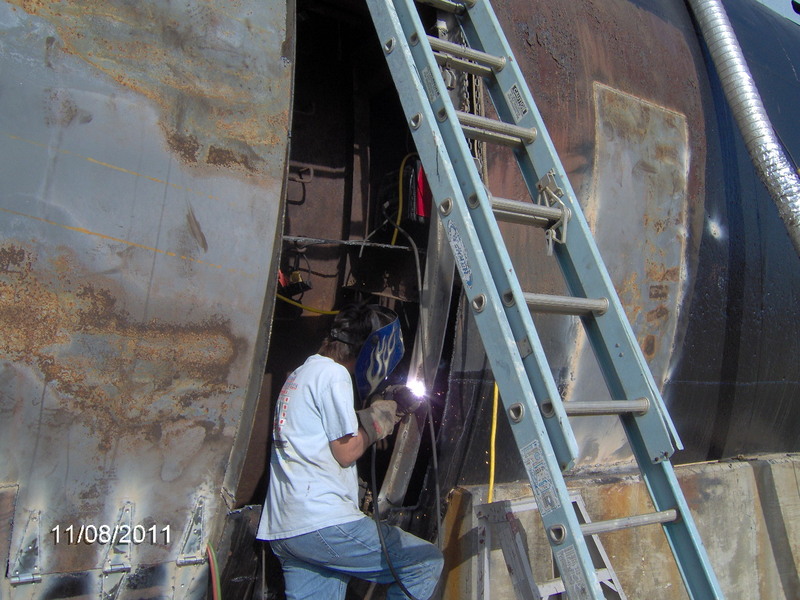 We will now hire someone to sandblast and paint inside the tanks. 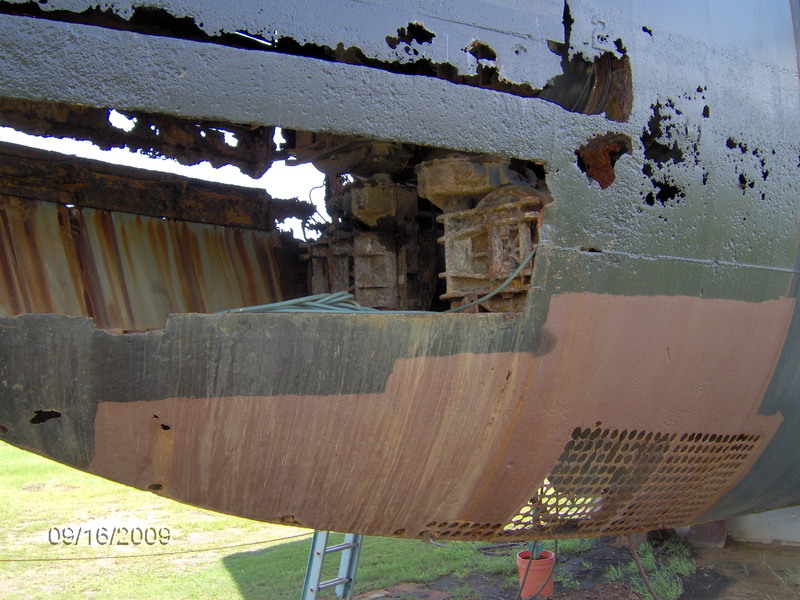 Lesely and I will continue to do the metal repair." 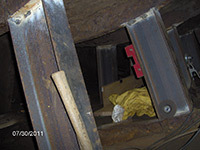 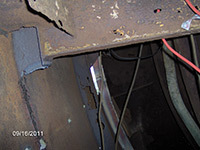 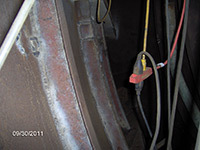 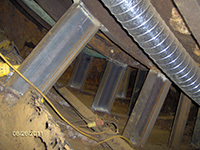 In the photos below, you can see the lead ballast bricks in place. 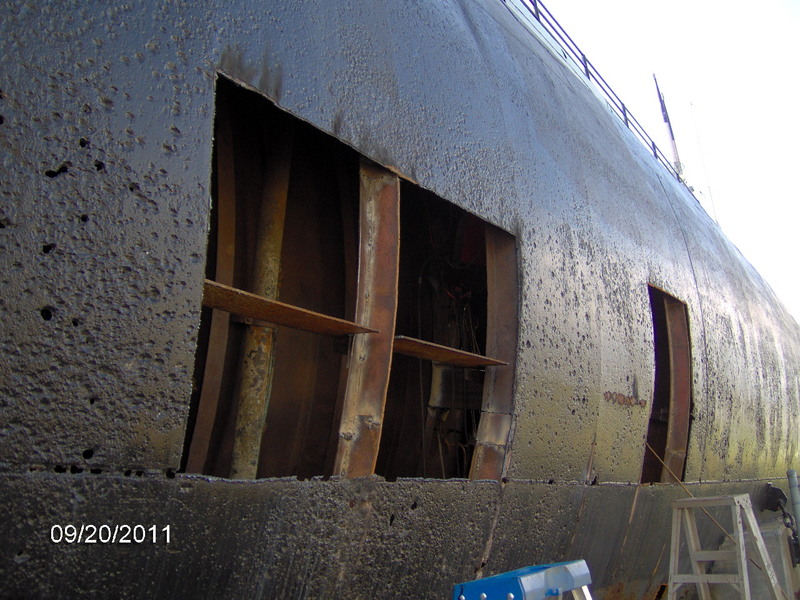 Tom and Lesley have made much progress on the big dent repair on the port side. 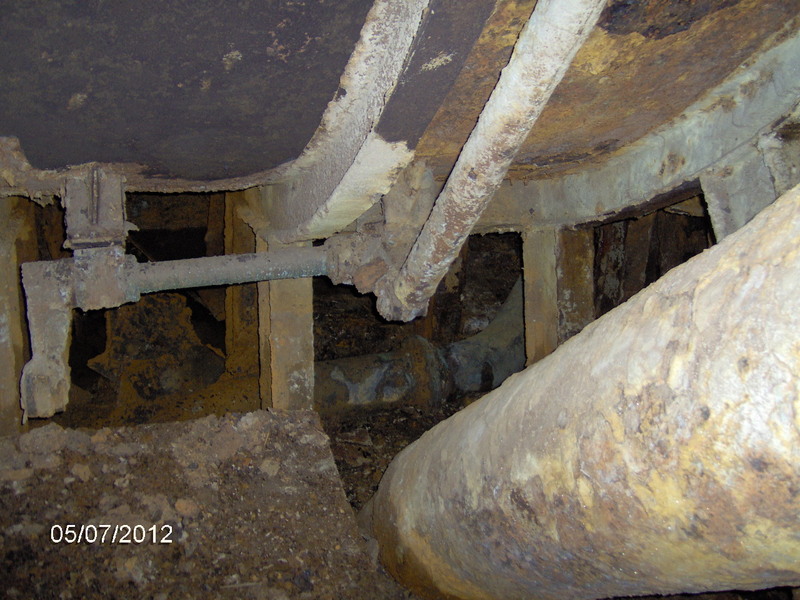 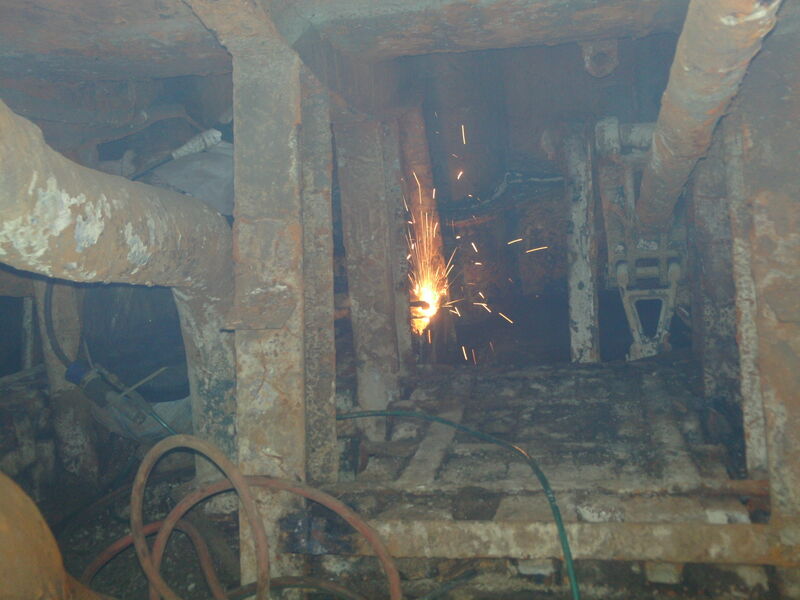 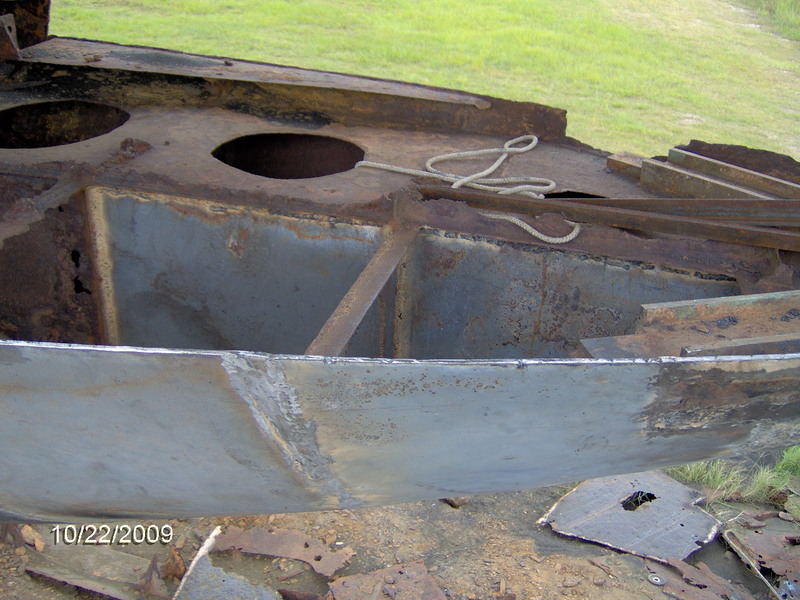 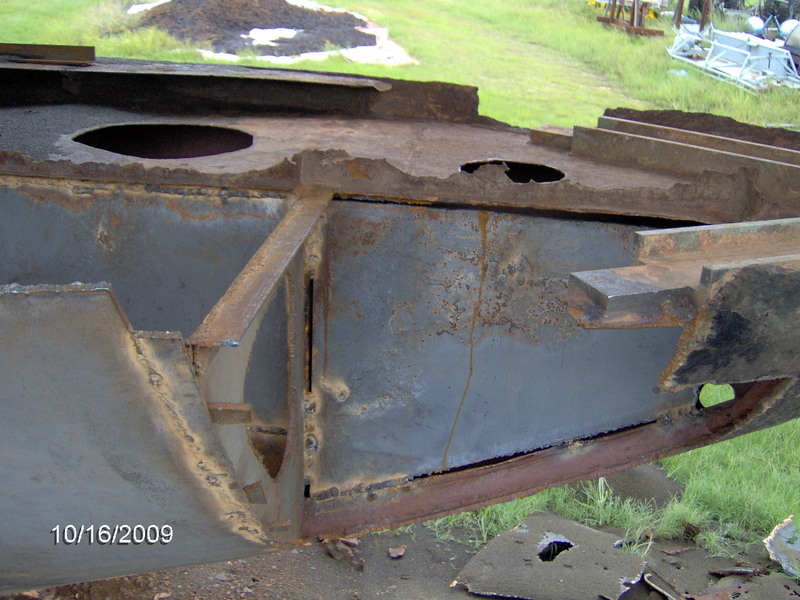 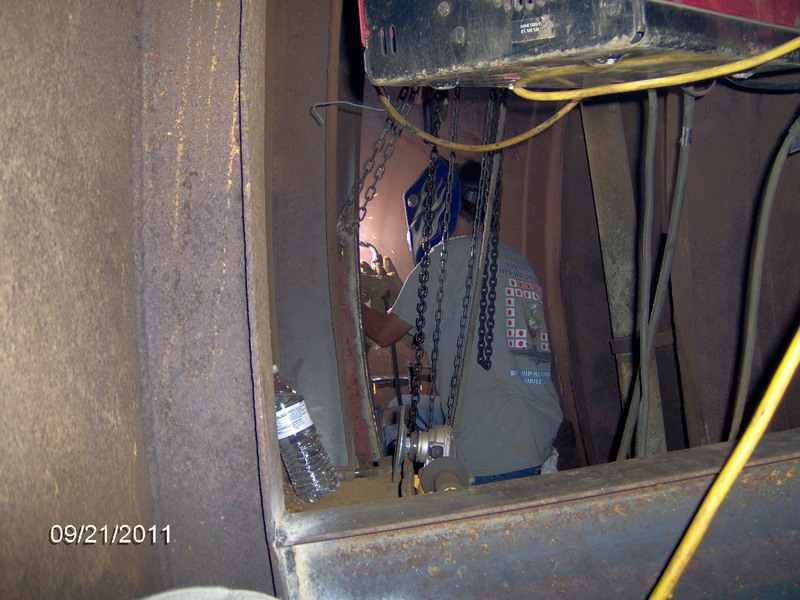 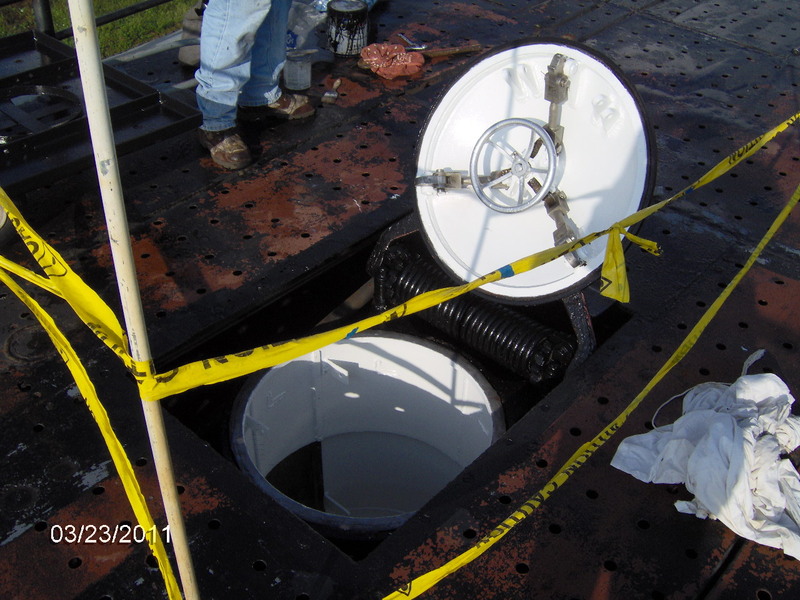 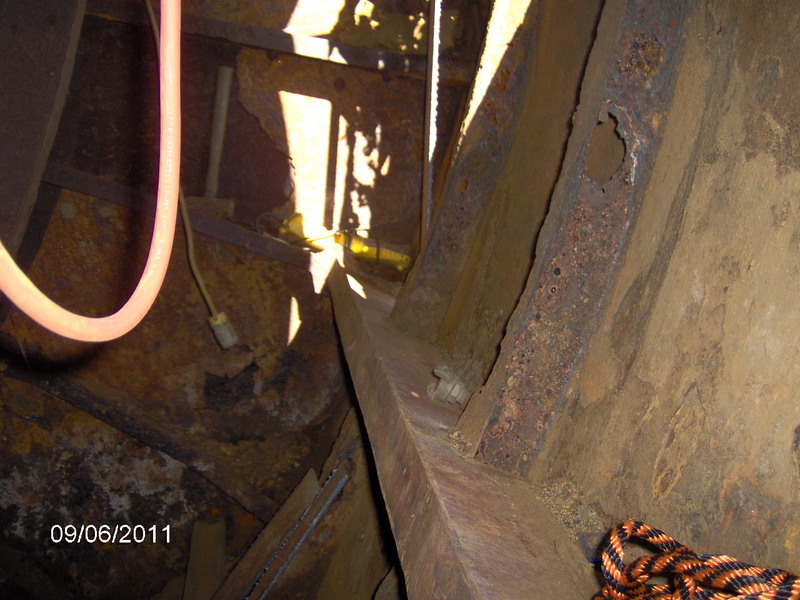 Also, more progress with the I-beam repair inside the fuel collecting tank and the new skin. 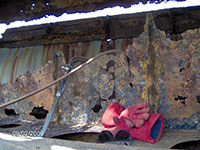 Tom and Lesley have moved back outside to work on the #6 normal fuel tank port side. The last of the big dent is now gone! 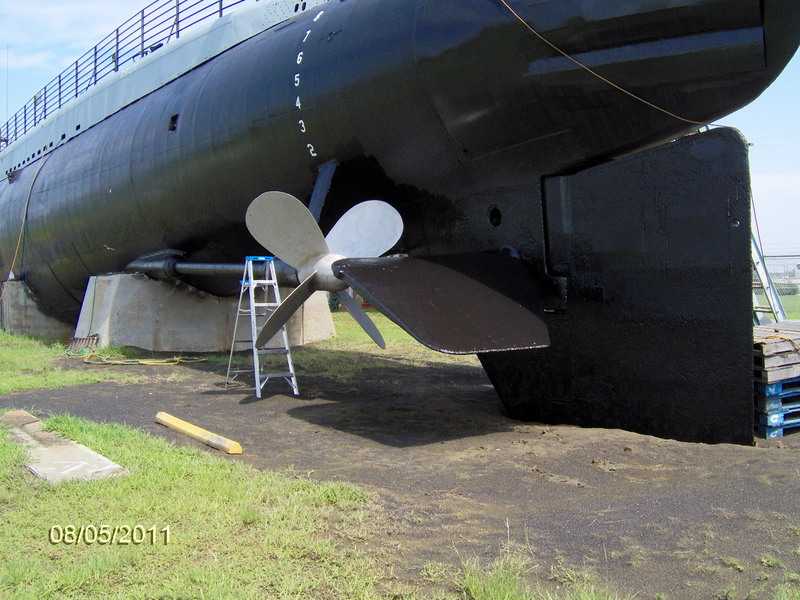 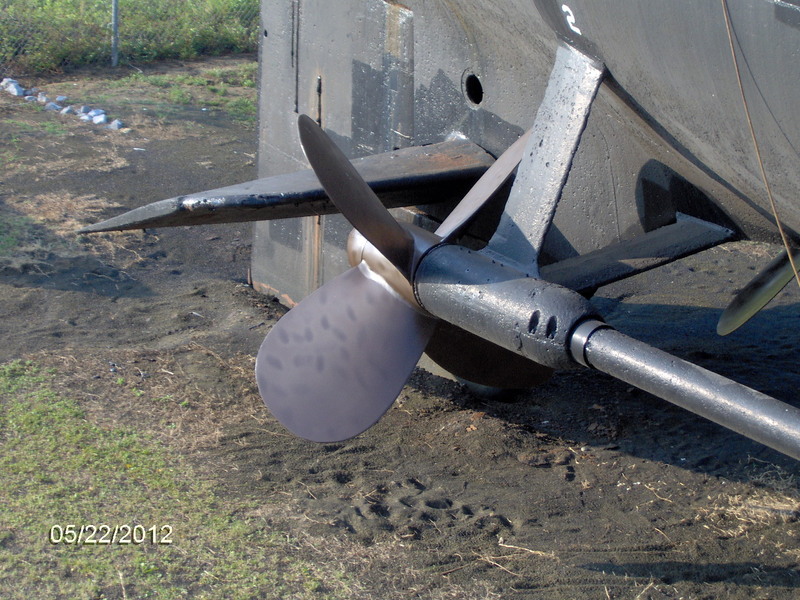 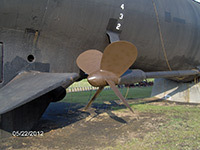 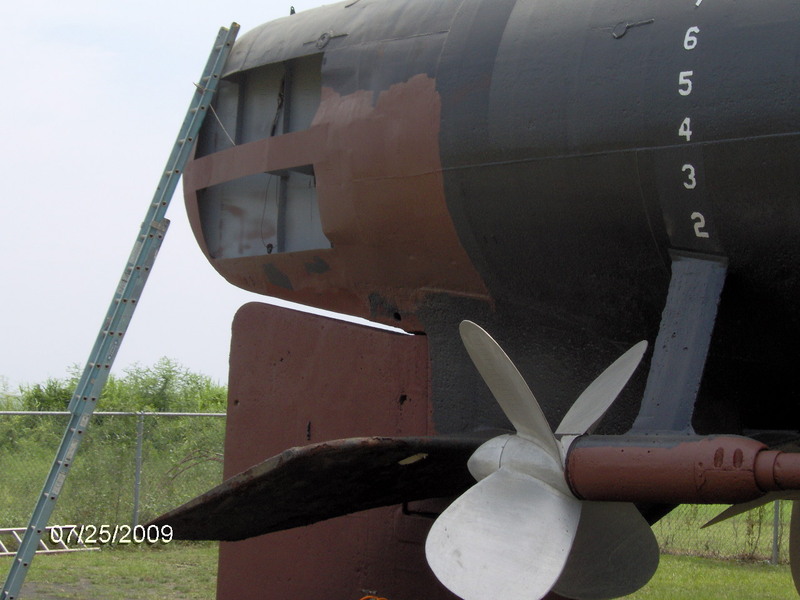 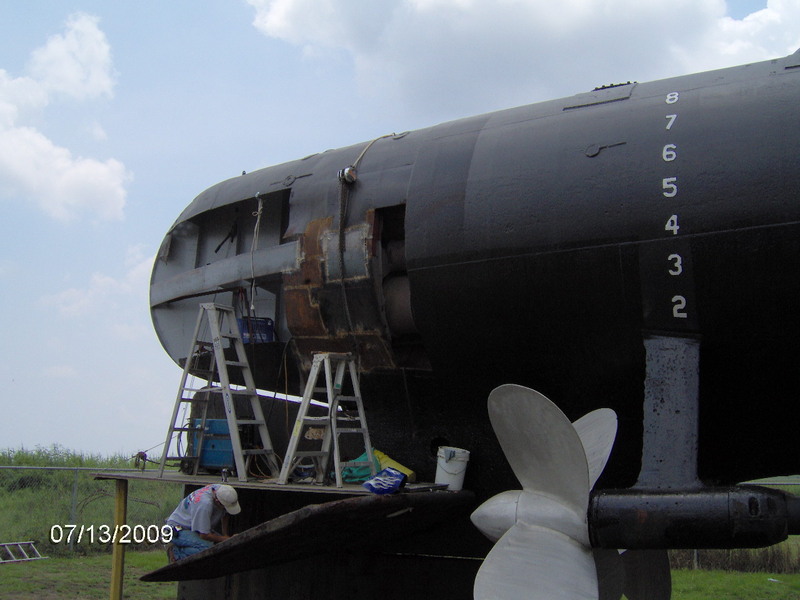 Four subvets from the USS Corporal came out for 5 days to sand and prime the propellers. 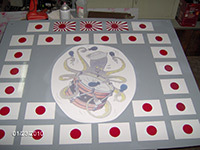 Tom and Lesley then finished them off with paint. 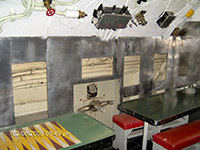 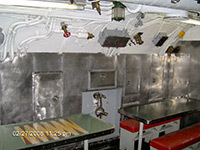 The forward torpedo room has been painted. Looks nice! 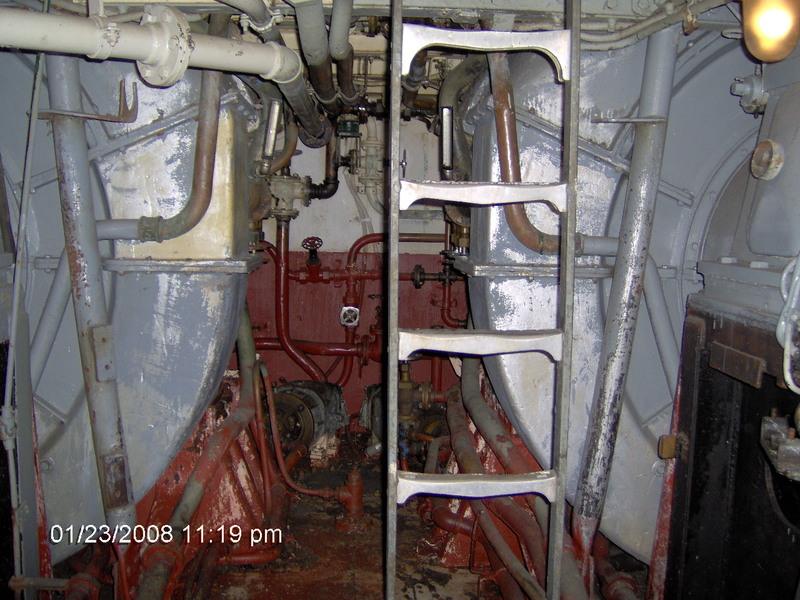 Tom and Lesley continue with painting in the forward torpedo room through the cold winter. 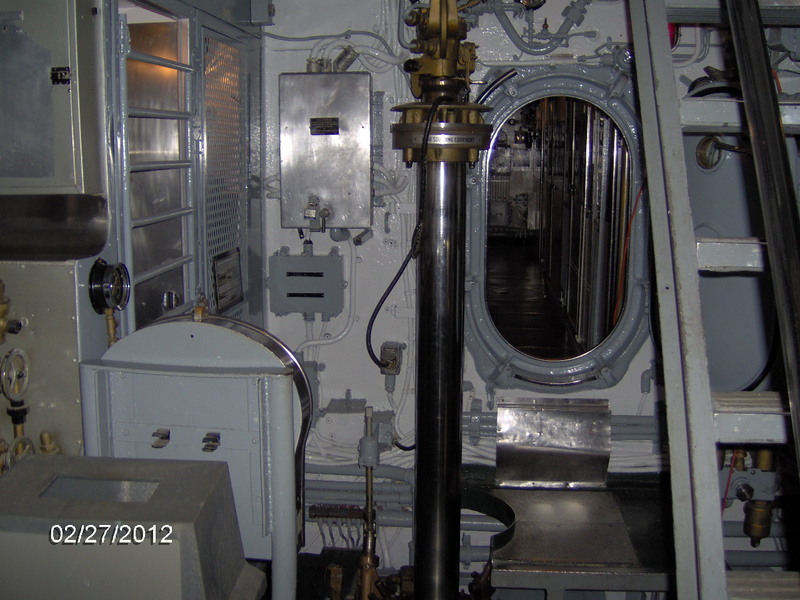 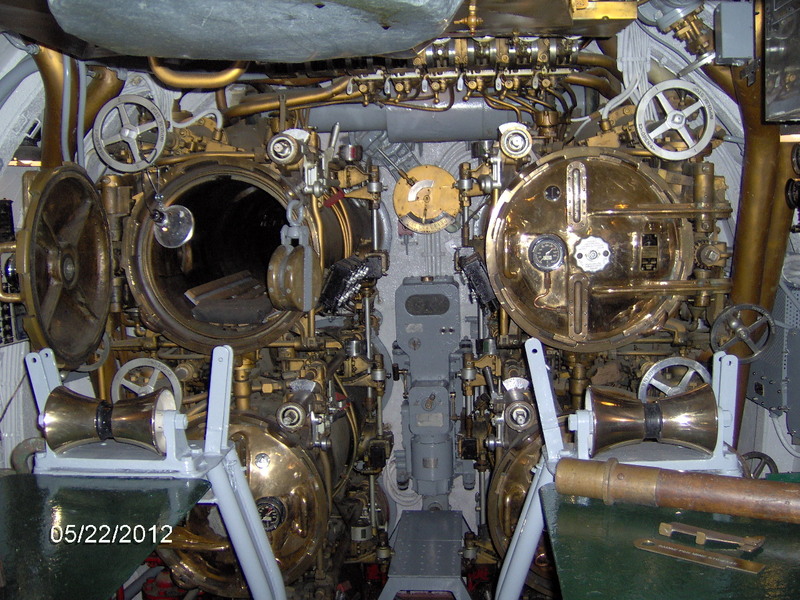 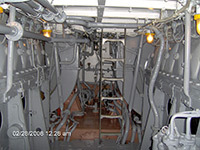 More cleaning and prepping for painting in the forward torpedo room. With winter on its way, Tom and Lesley move inside to clean and prep to paint in the forward torpedo room. Tom and Lesley still working hard on the tank. Tom and Lesley continue with the restoration of the tank. 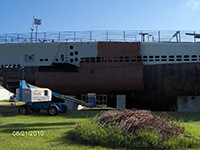 Update for the end of September. 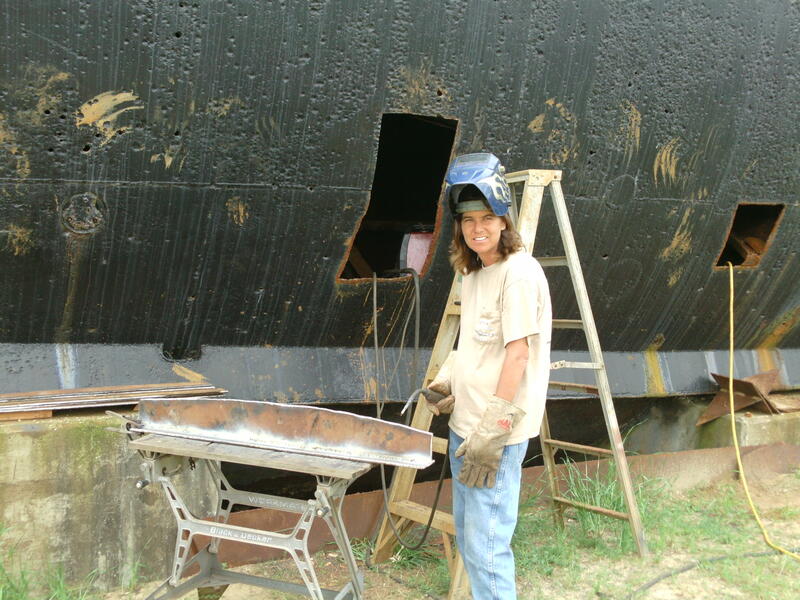 Lesley finished up painting on the stern and then joined up with Tom in working on #6A tank. They replaced 6' of five curved frames and the bottom two longitudinal frames. 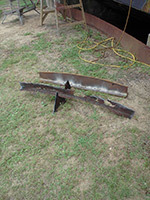 They now have two new pieces of the tank to skin in. 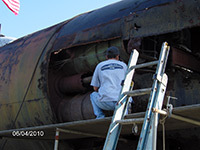 Tom and Lesley are busy working on replacing the I-beams in the #6A tank. The second photo below shows the Drum Shipyard Frame Shop. 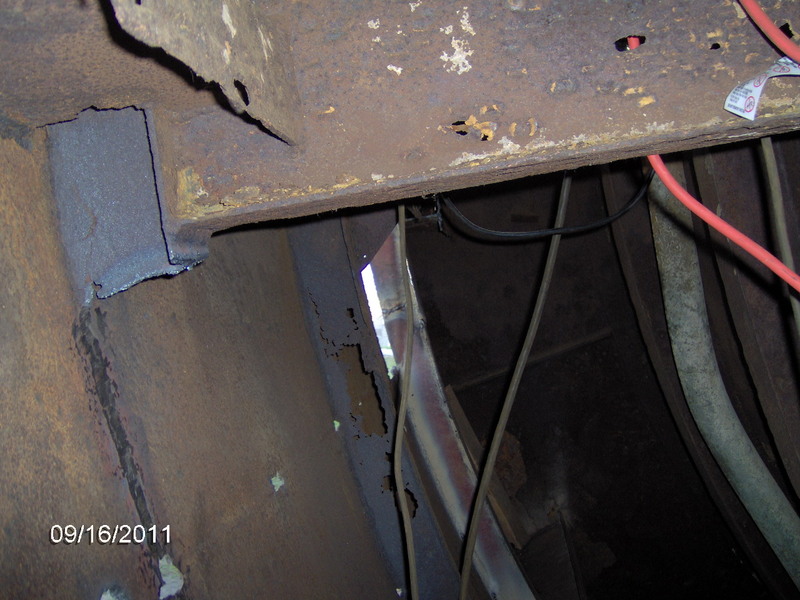 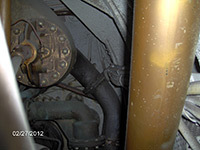 Quick update for the end of August 2011 with more I-beam replacement. 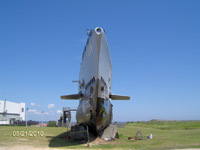 It has been a very hot summer. Even Tom admits that it's hot. 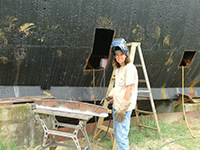 Lesley has been working on sandblasting, priming, and painting the bottom of the port stern. 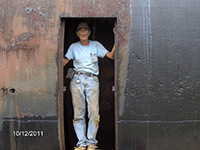 Tom has started work inside of #6A tank. 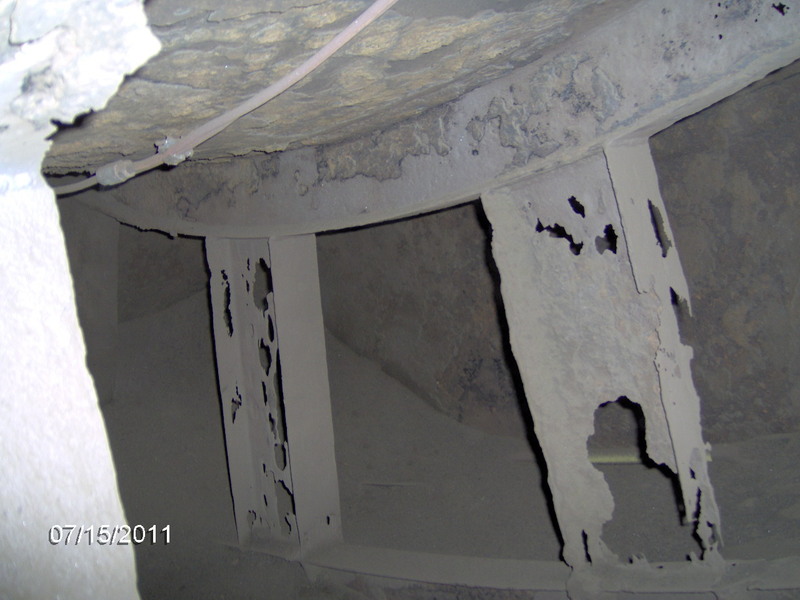 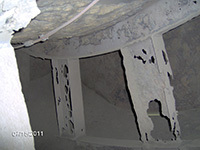 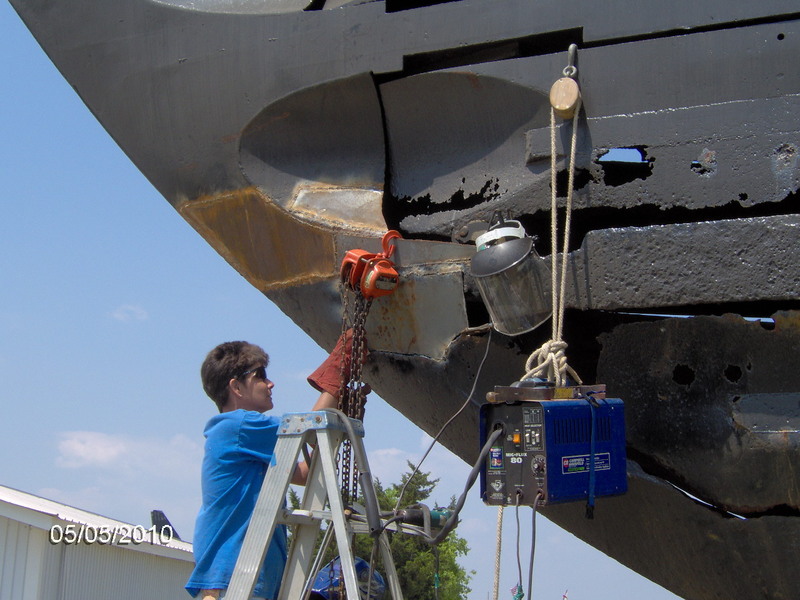 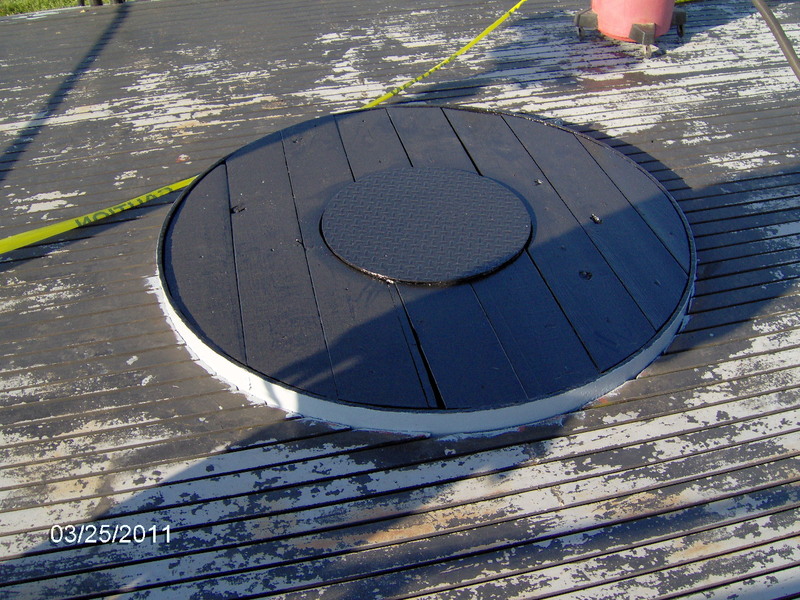 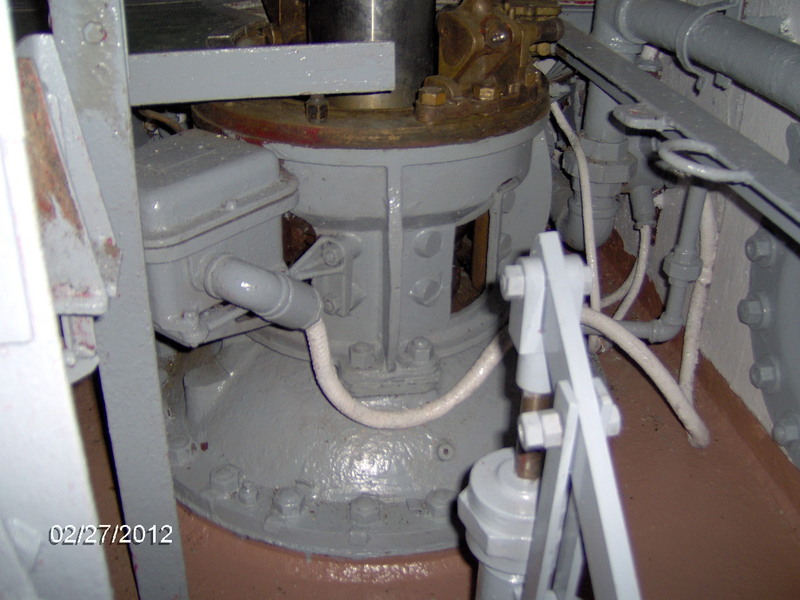 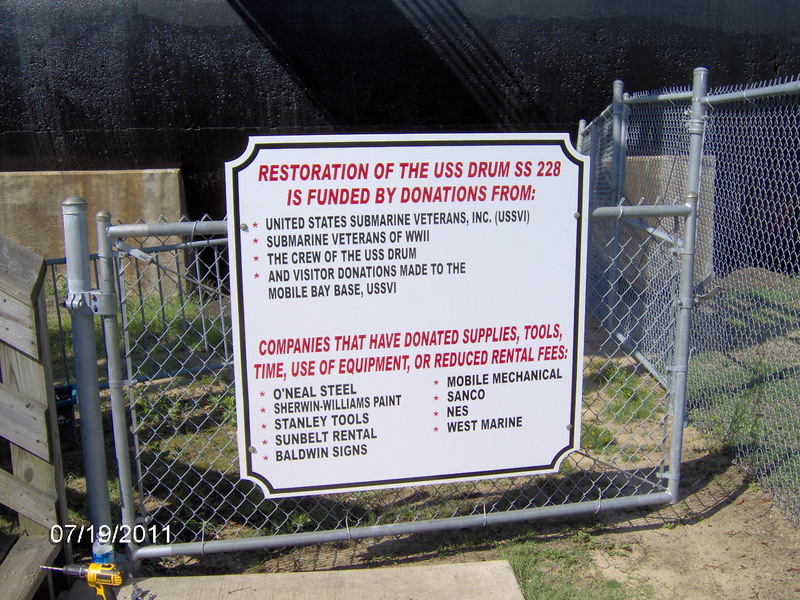 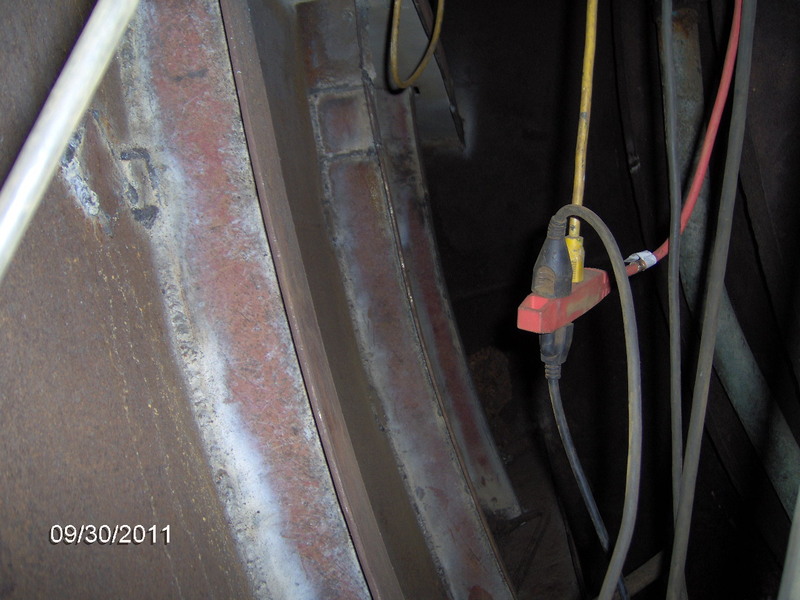 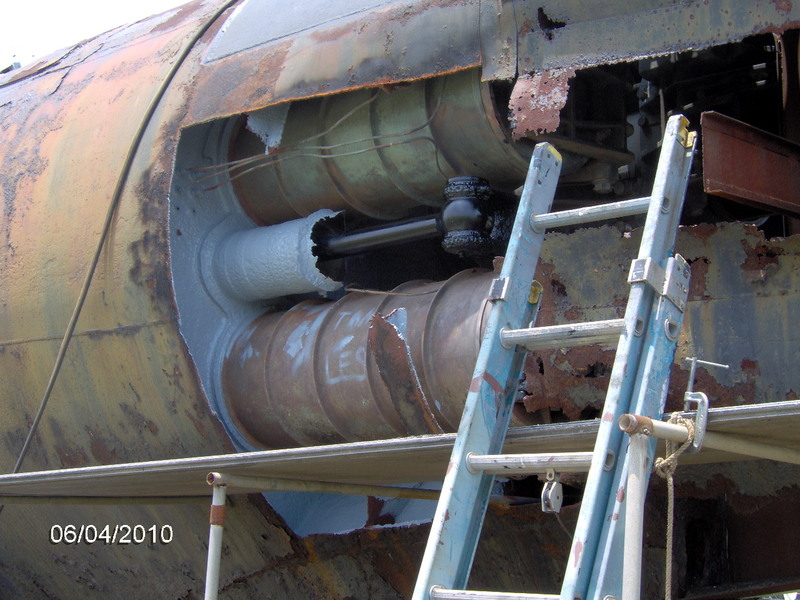 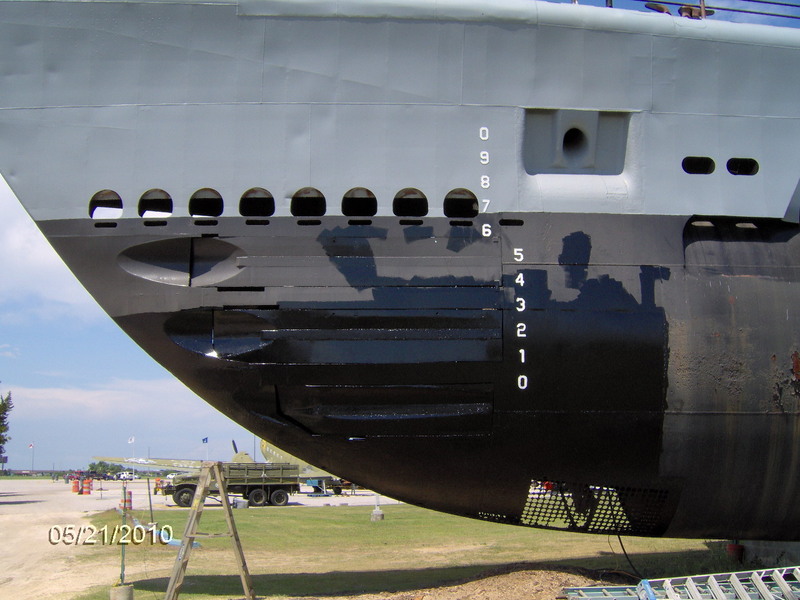 June was a very busy month for the USS Drum Restoration Crew. 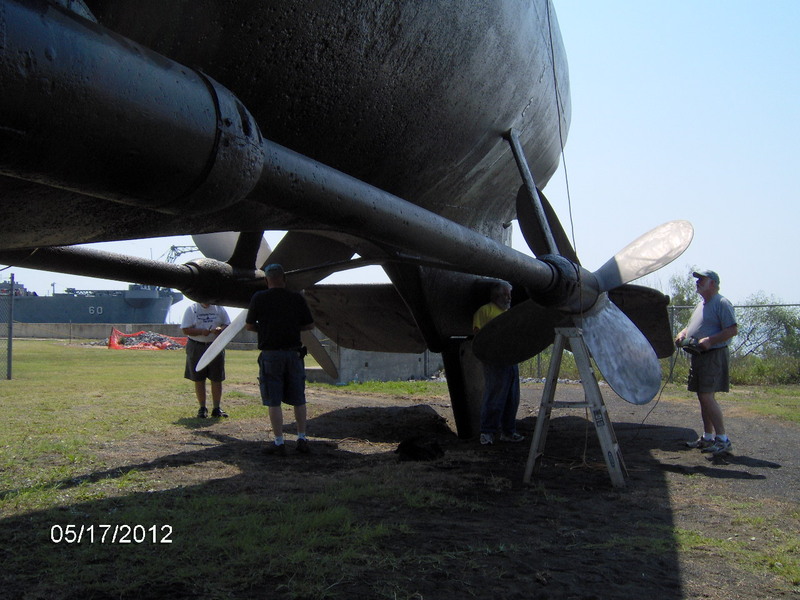 It's July and they are hard at work again. Tom and Lesley are sandblasting and replacing the I-beams in the #6B tank. 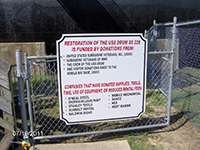 A donator board that lists major contributors to the restoration of the Drum was donated and placed so that everyone can see. 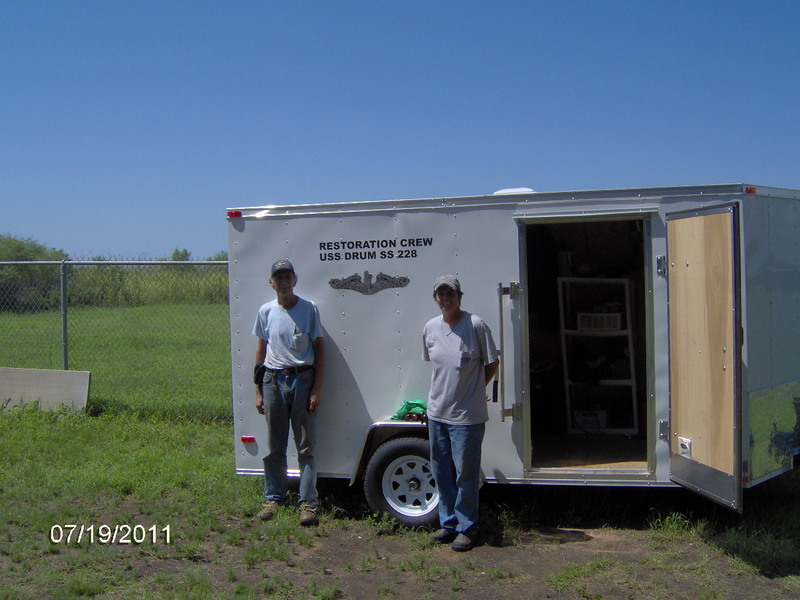 Tom purchased with his own money (not donated money) a portable shop trailer to make their job easier. 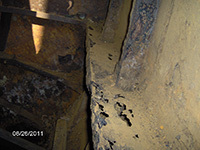 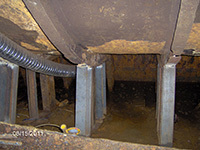 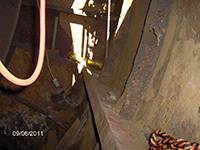 These photos show the new I-beams in the #6B tank. 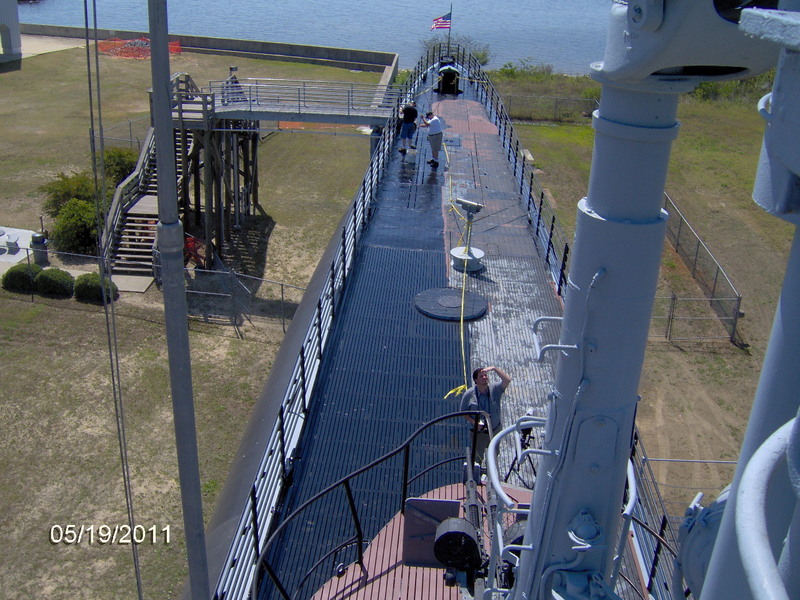 Tom and Lesley worked on getting the deck primed and painted this month. Tom and Lesley are working on the #6B fuel/ballast tank. 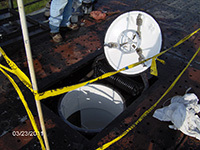 They found that the I-beams at the bottom of the tank needed to be replaced. 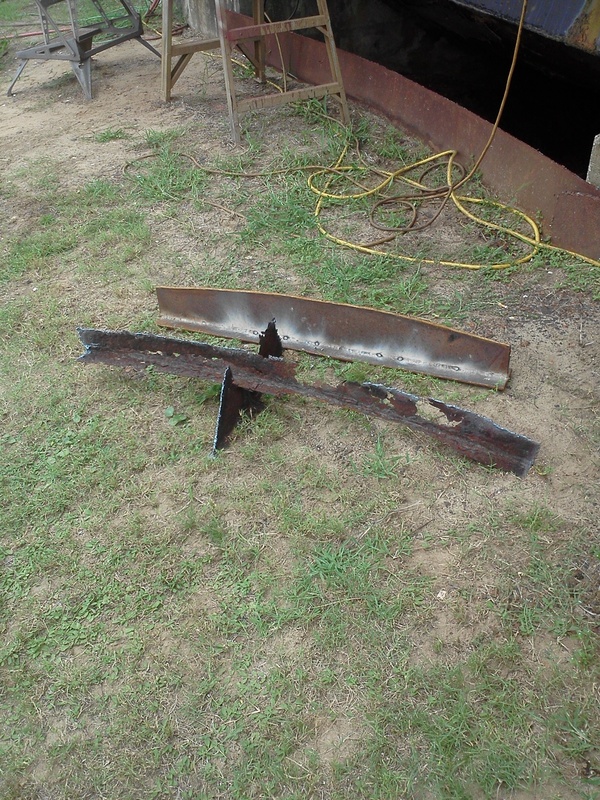 Thankfully, O'Neal Steel is coming through with new I-beams. 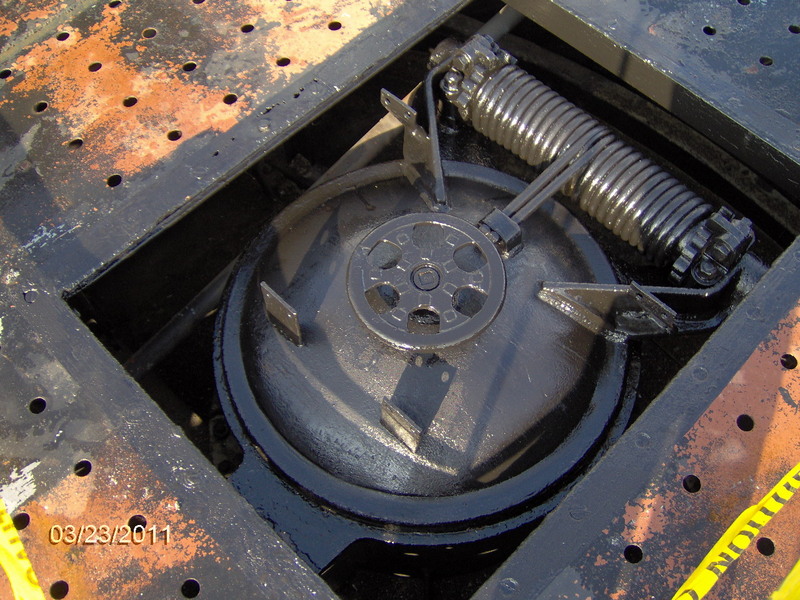 Tom and Lesley repaired the engine room hatch mechanism. 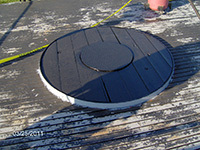 Lesley cleaned and painted the hatch. 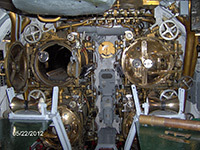 Tom replaced the boards in the aft gun mount. 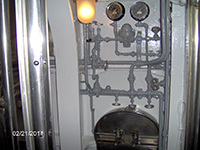 The crew's head and shower room have been cleaned and painted. 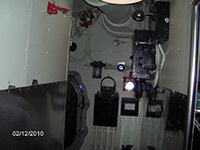 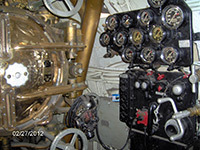 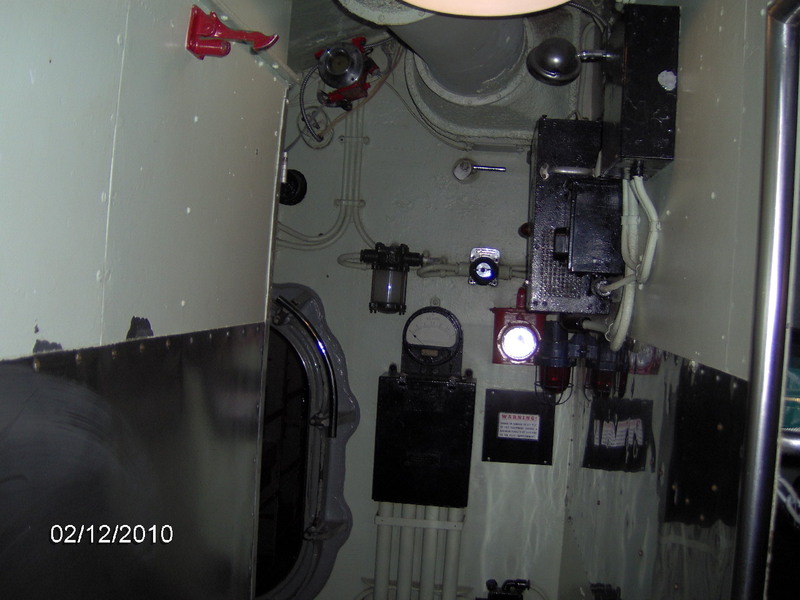 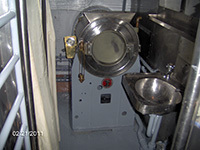 A washing machine received from another museum submarine has been installed. Tom said the machine had to be disassembled and then reassembled in place. 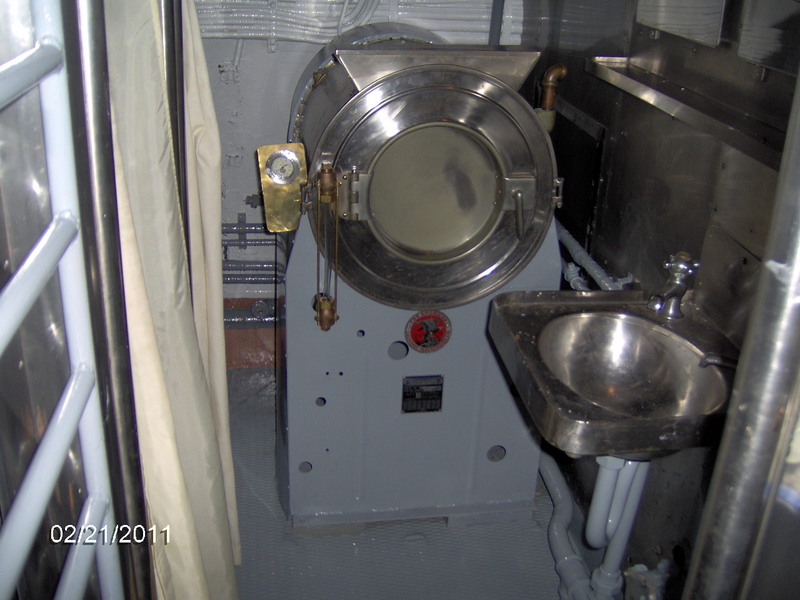 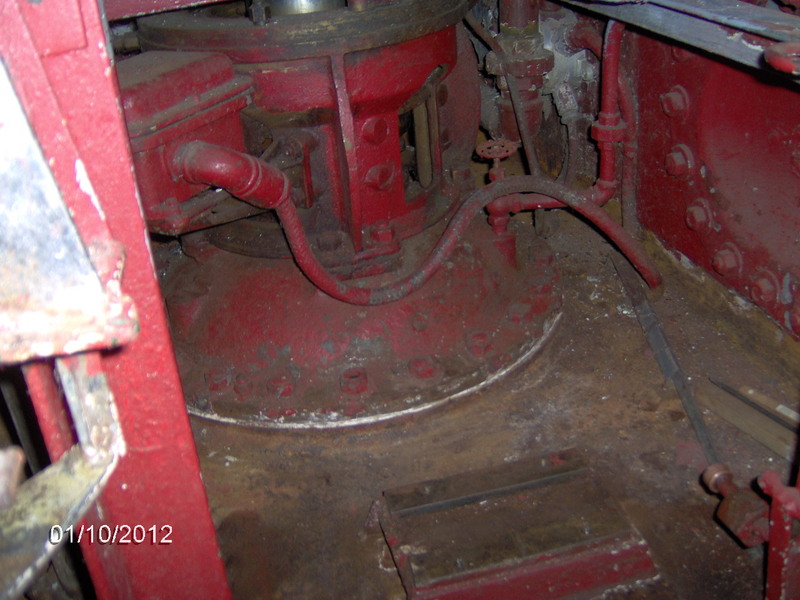 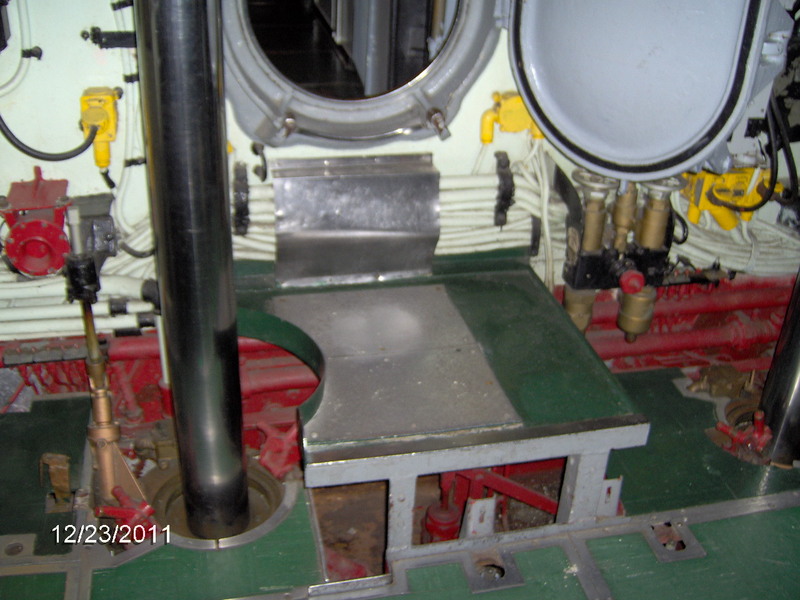 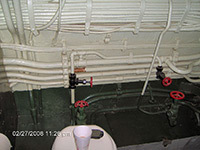 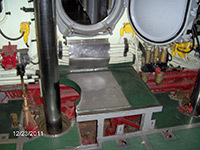 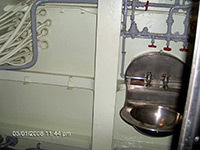 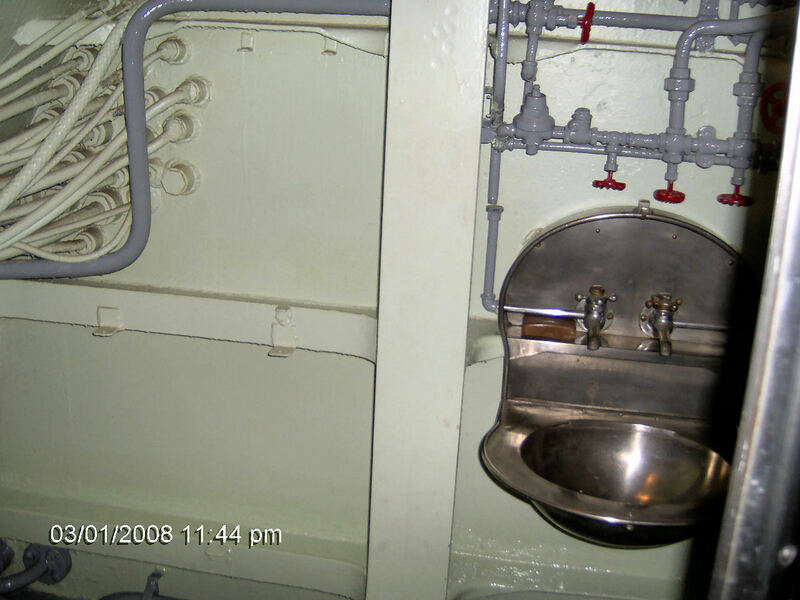 Also new to the boat is the original chief's sink which was removed from the boat in 1964. 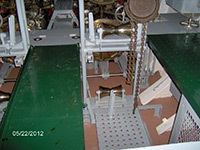 The port side is now finished. 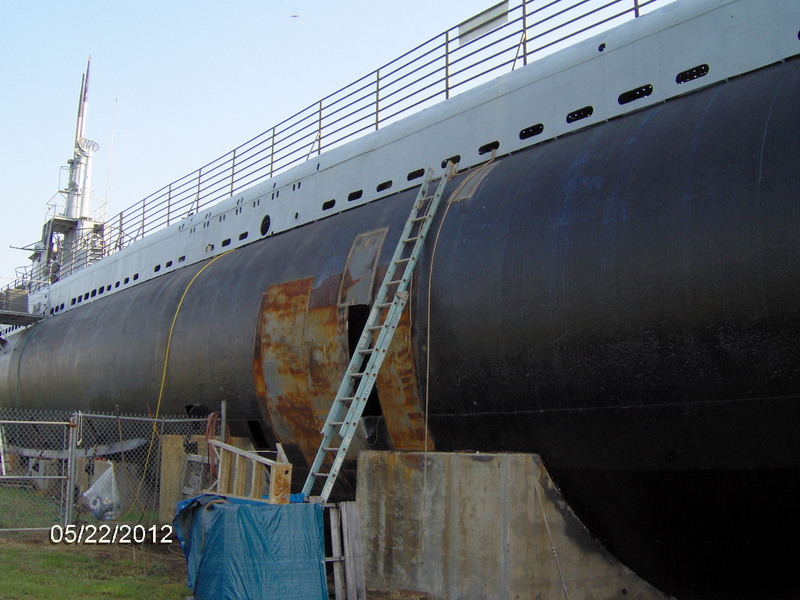 Now only the very bottom needs sandblasting, priming, and painting. 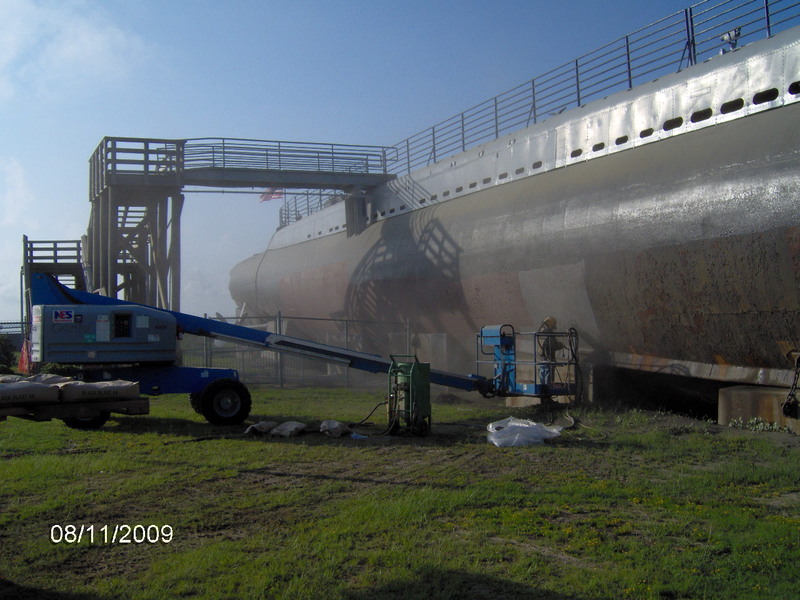 Sandblasting, priming, and painting continues this month. They are nearing the port stern. Update for 9/26, progress continues. 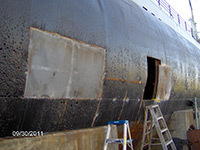 Sandblasting, priming, and painting of the port side continues this month. 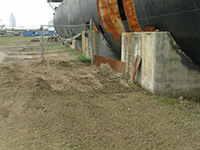 Tom said they are a little over halfway and have used about 33 tons of sand thus far. 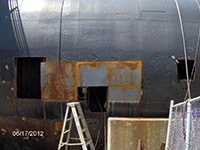 Tom and Lesley were busy the month of August with sandblasting, priming, and painting the port side. 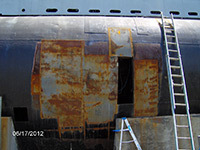 It's a slow process with the weather and lots of old rust to deal with. 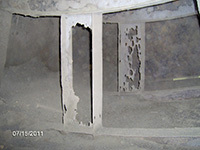 Tom said they have used about 20 tons of sand in the first three weeks of sandblasting and they are only about 30 feet from being halfway. Just before the end of July, the port stern restoration has been completed! 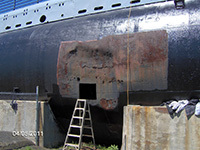 Work continues on the port stern. 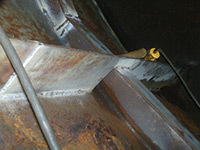 Update for 6/12 - Tom says the heat index is 105°F+ which helps the metal bend easier. At the edge of Mobile Bay in the heat of June, progress begins with the port stern. 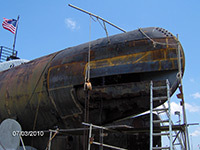 Now that the bow has been completed, work begins on the port stern. 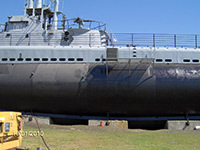 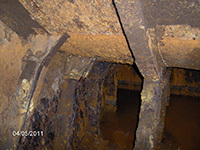 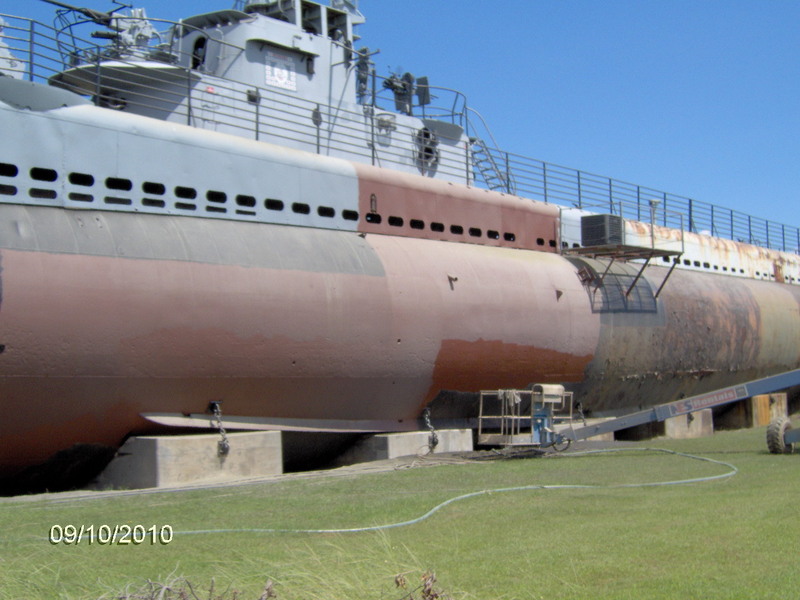 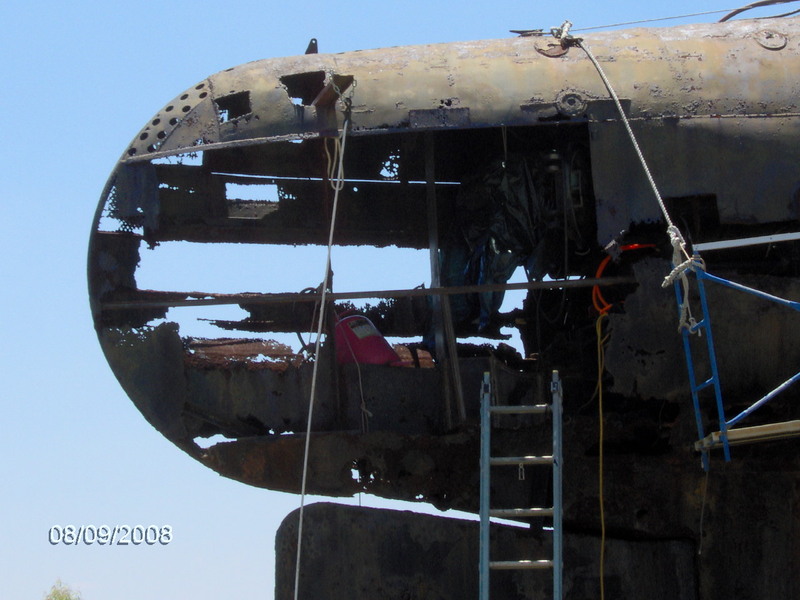 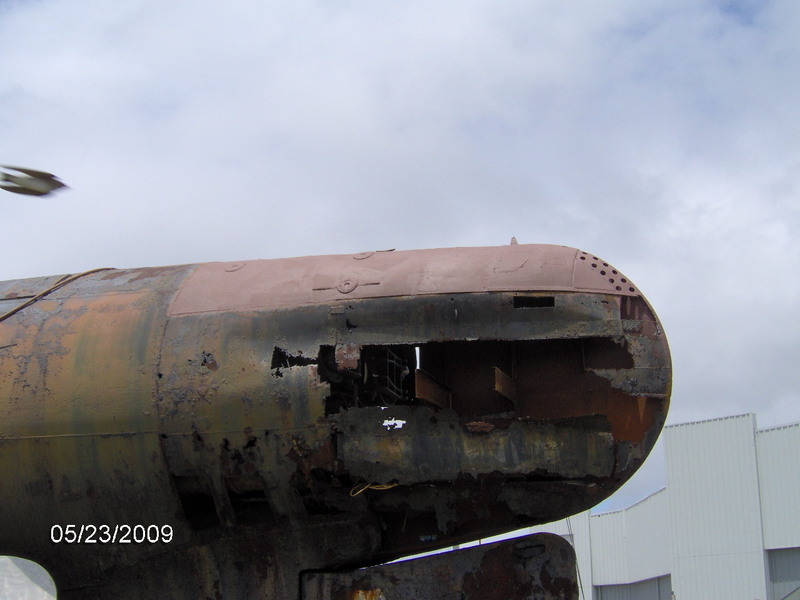 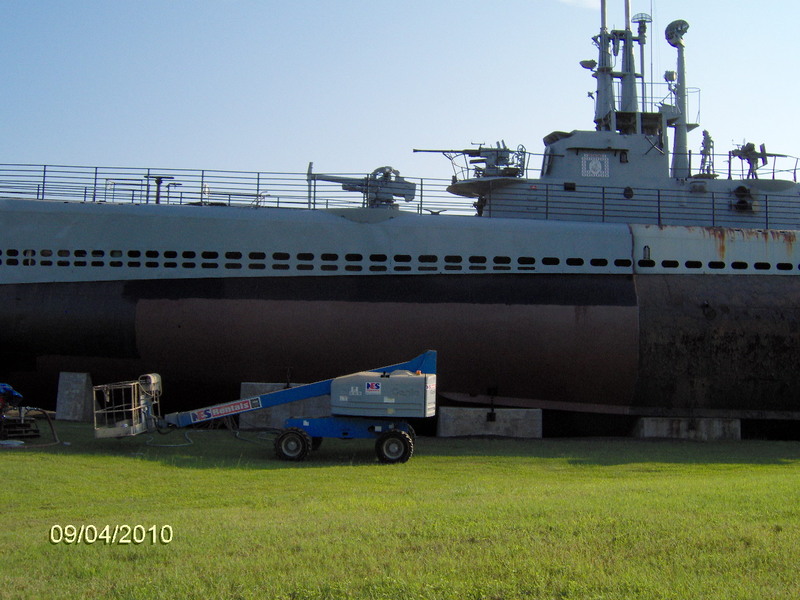 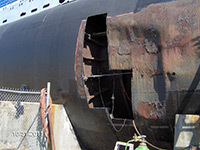 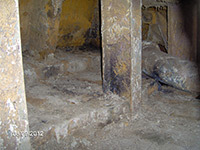 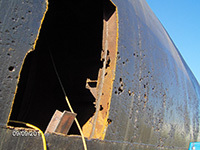 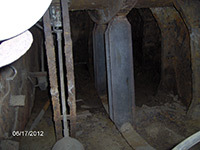 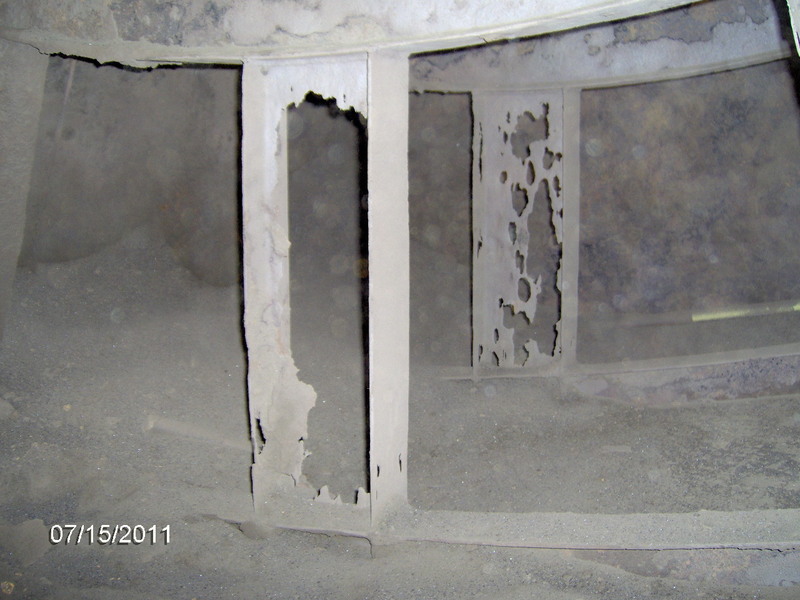 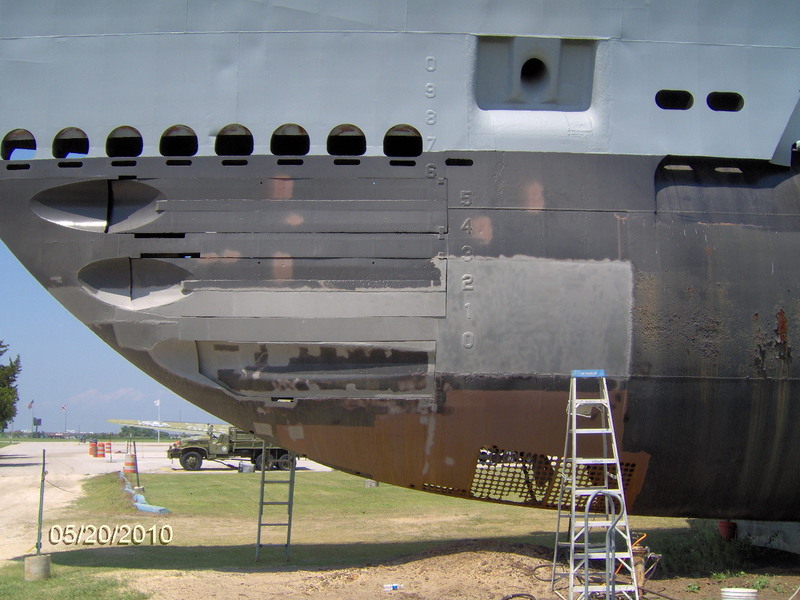 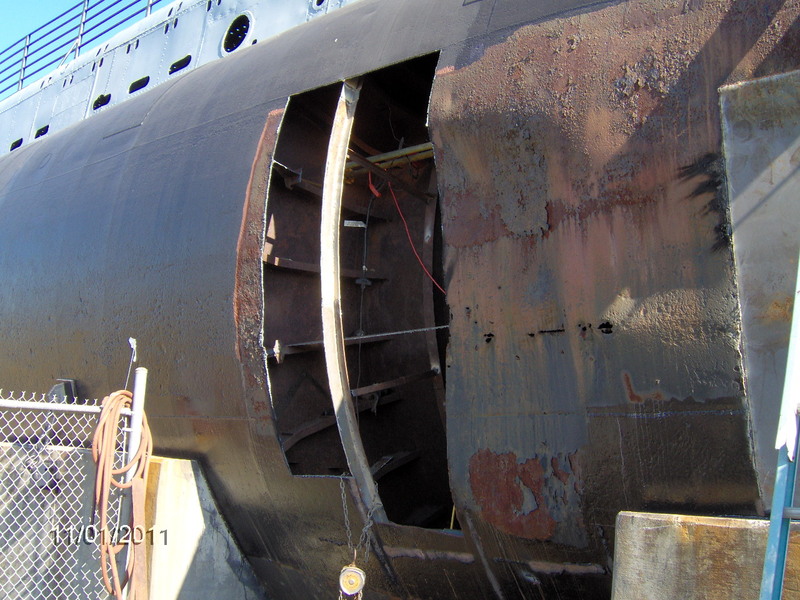 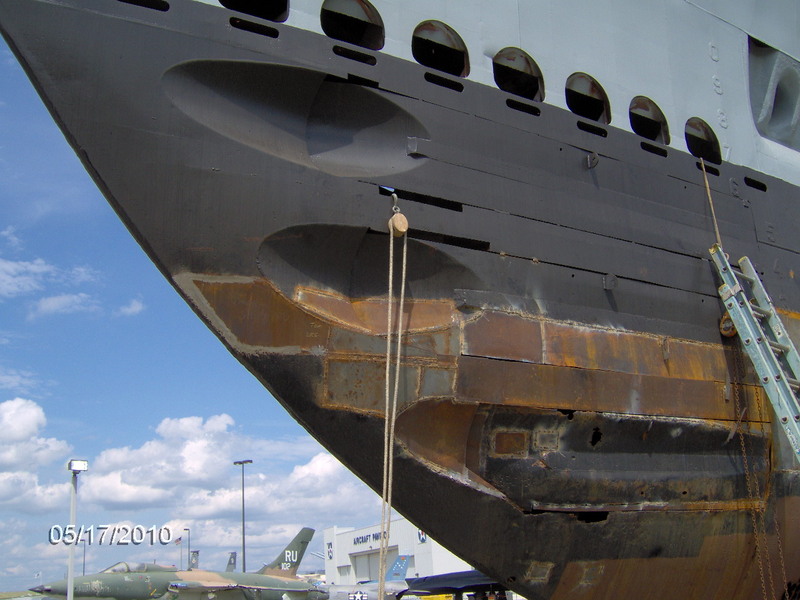 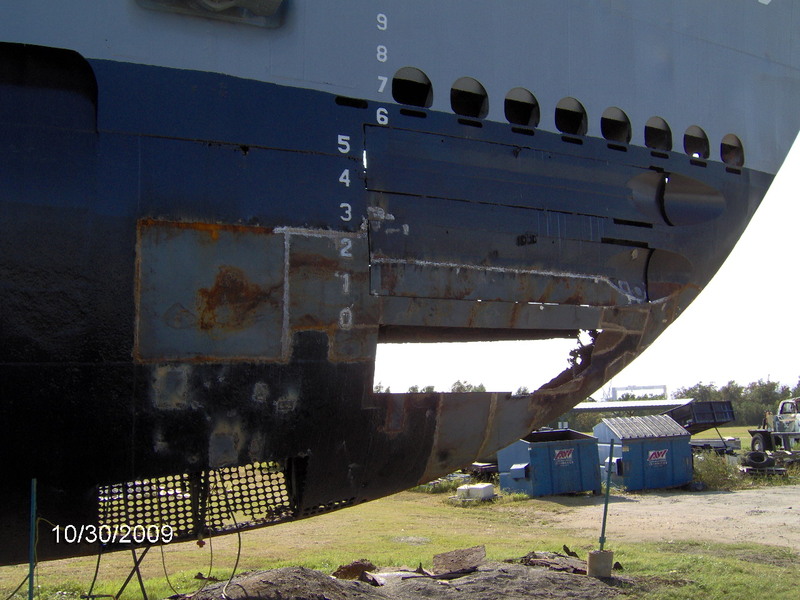 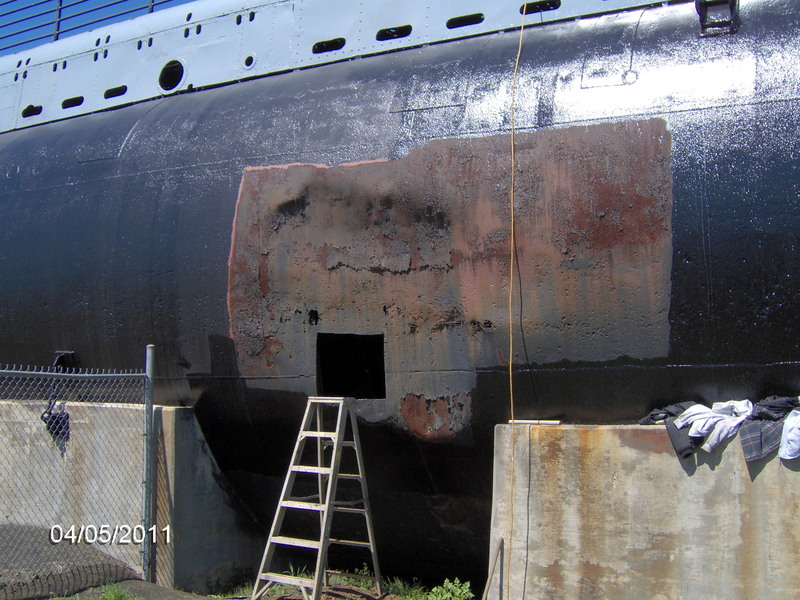 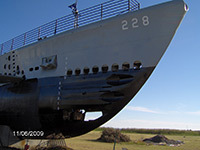 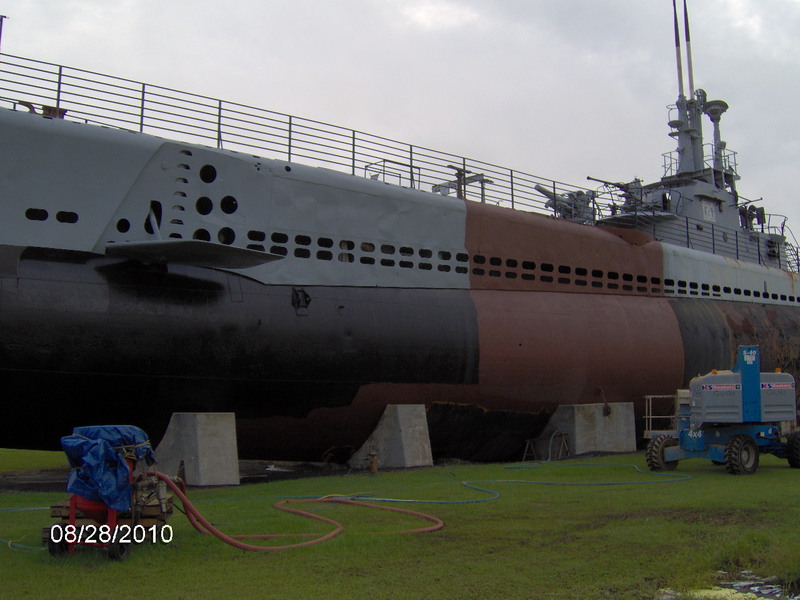 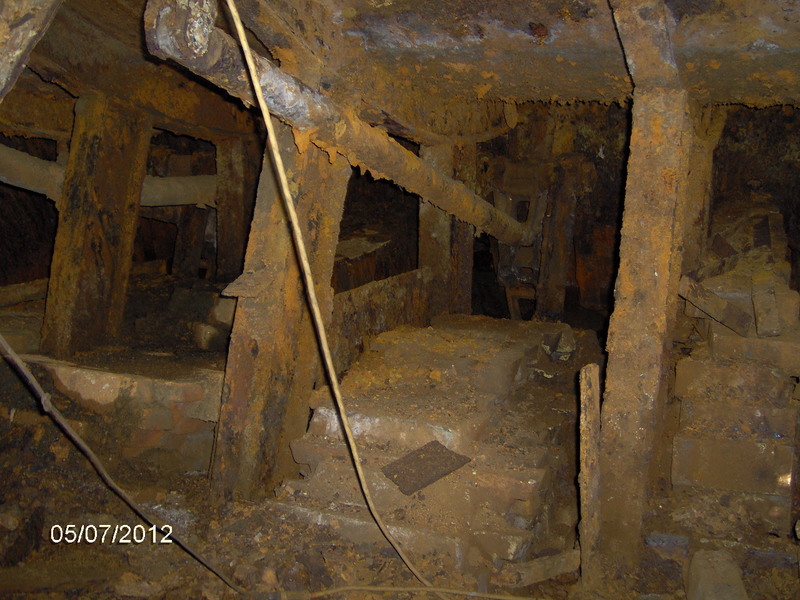 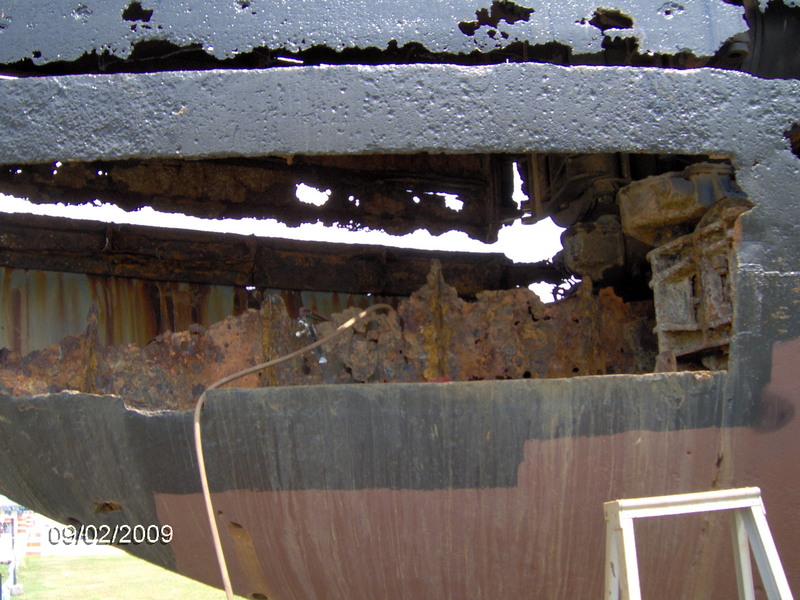 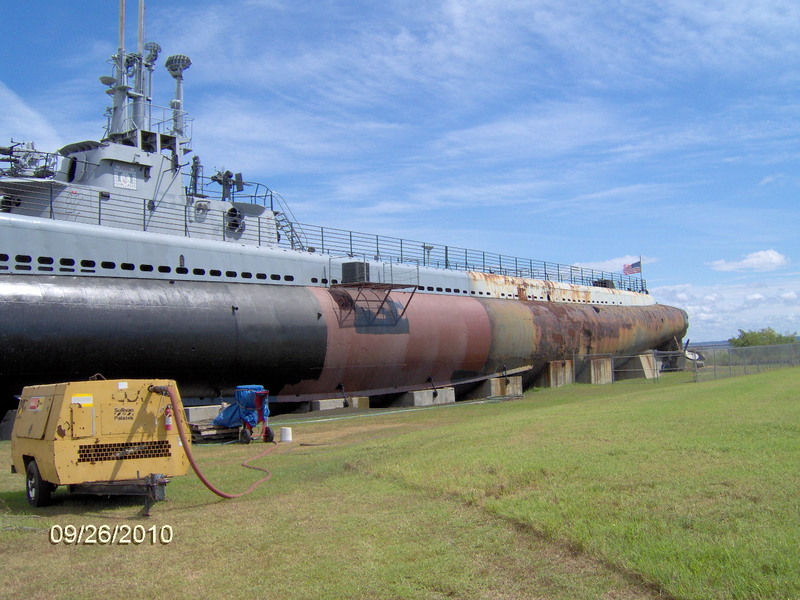 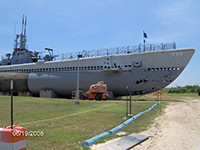 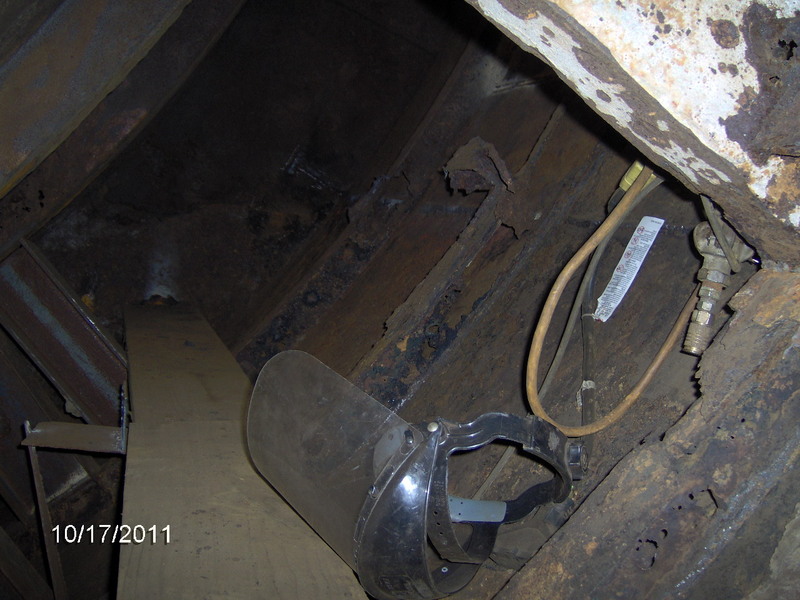 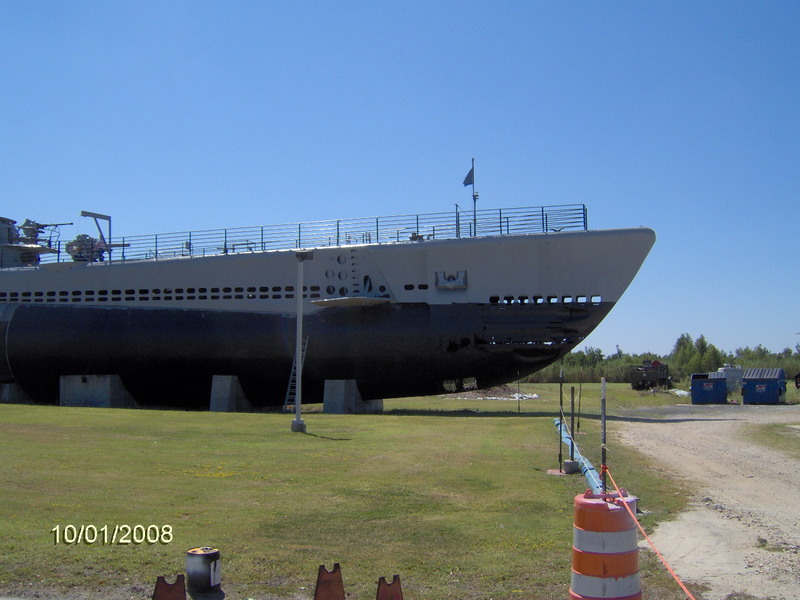 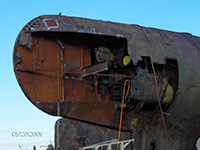 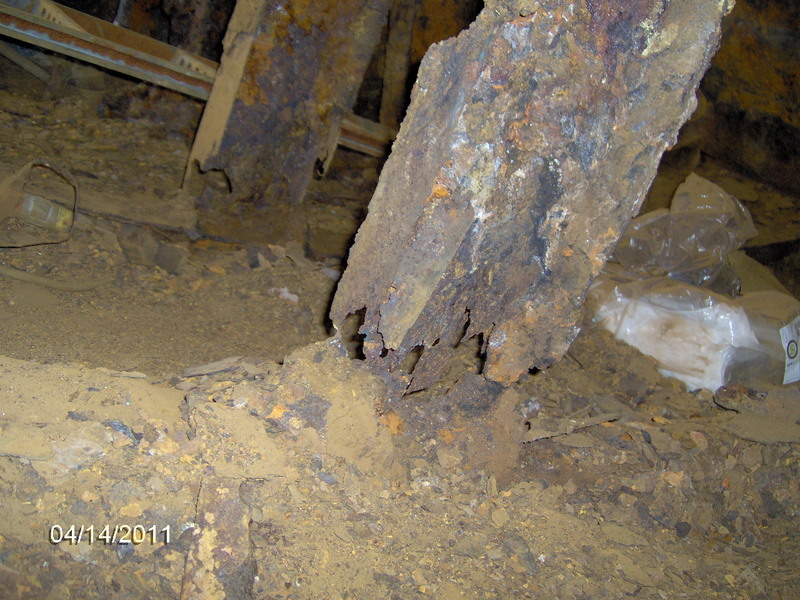 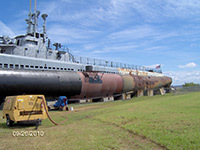 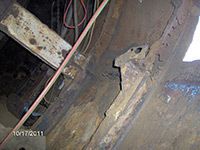 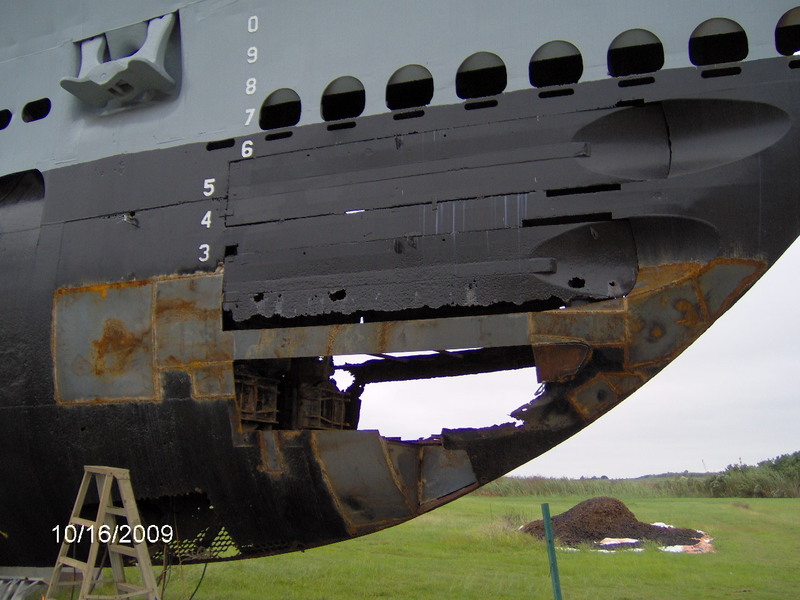 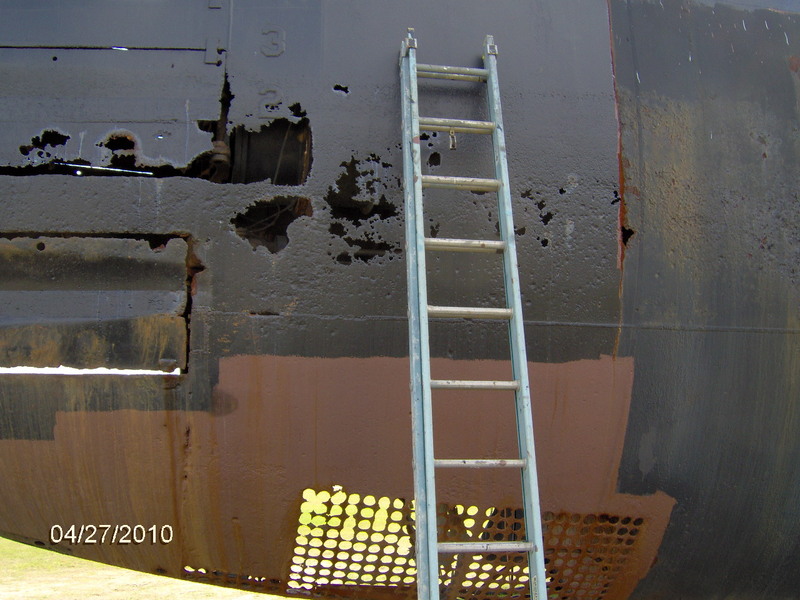 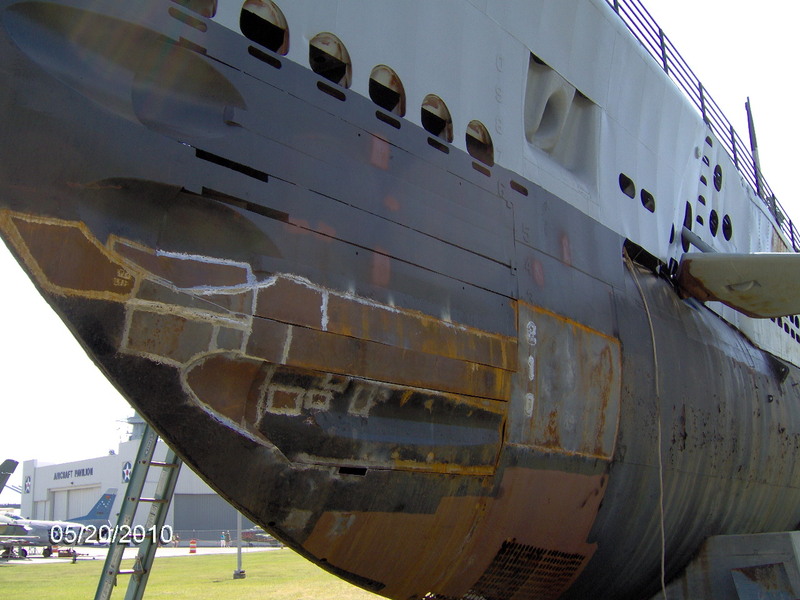 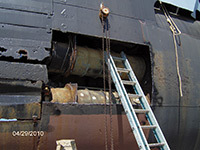 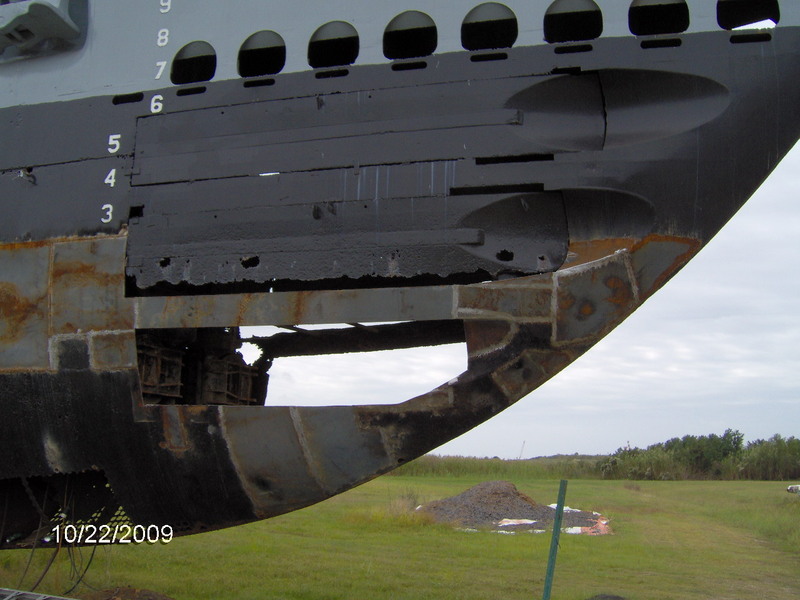 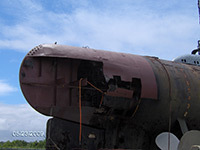 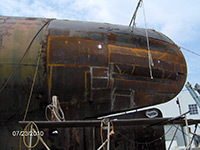 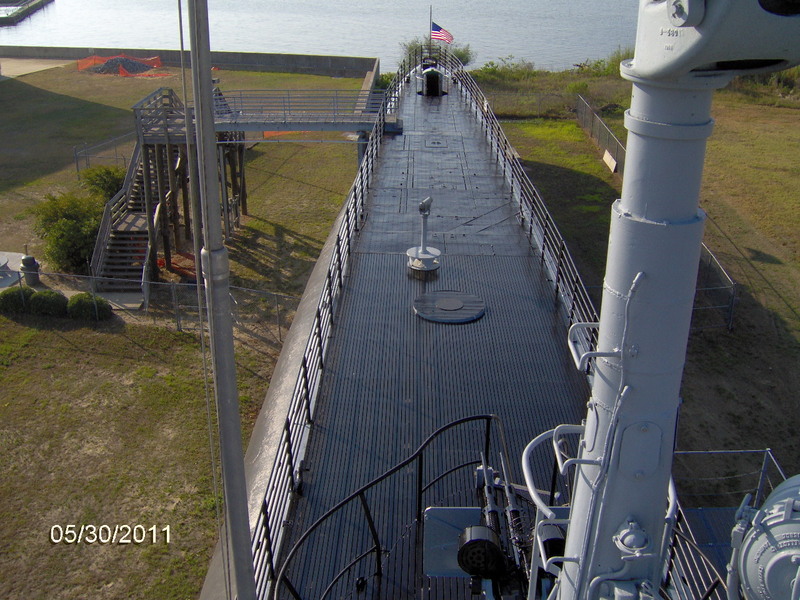 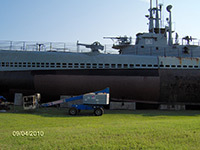 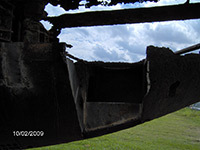 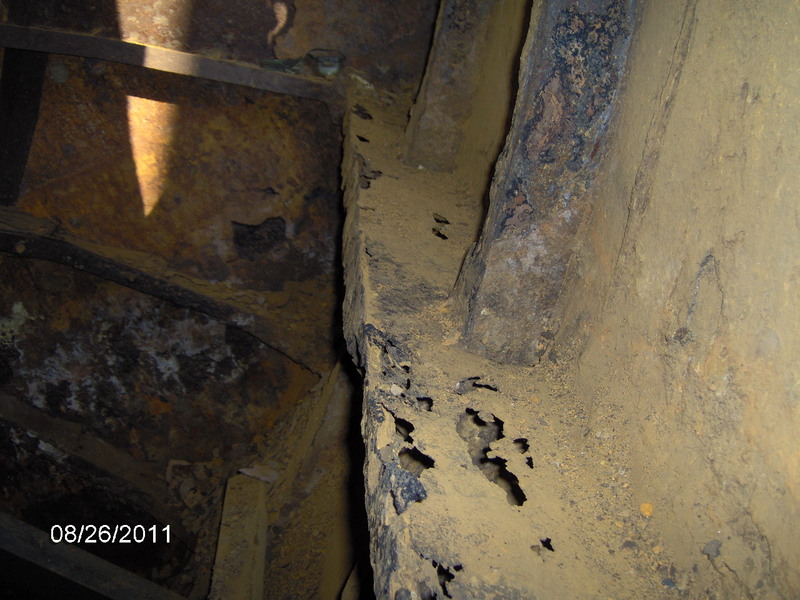 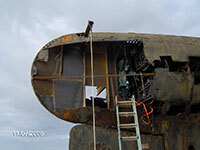 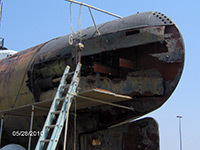 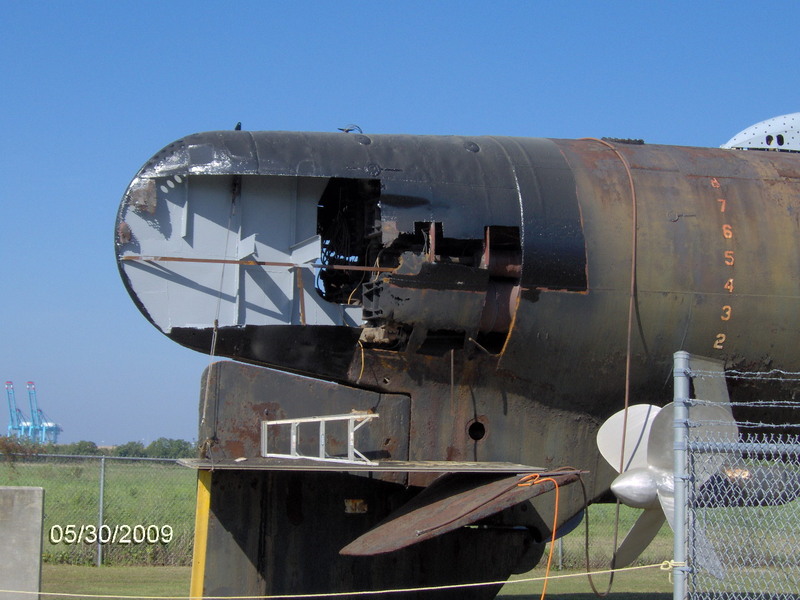 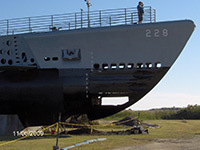 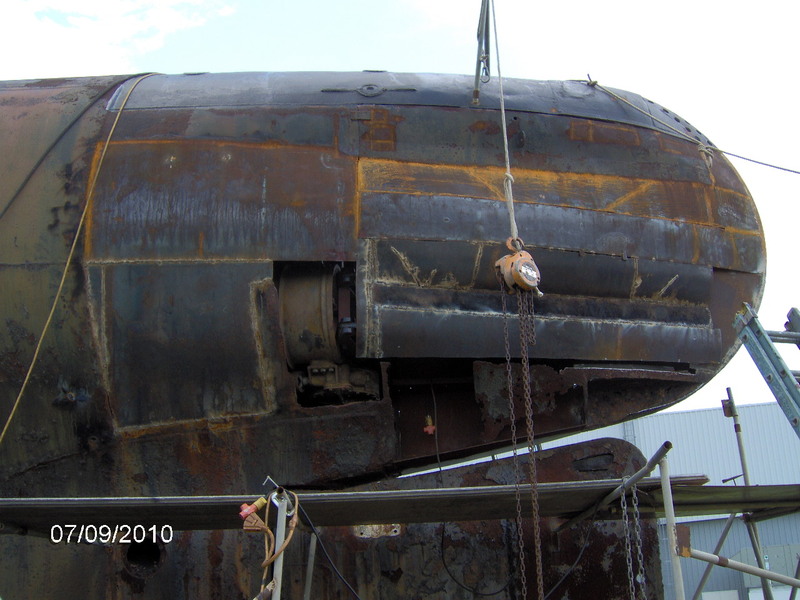 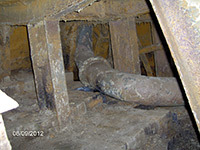 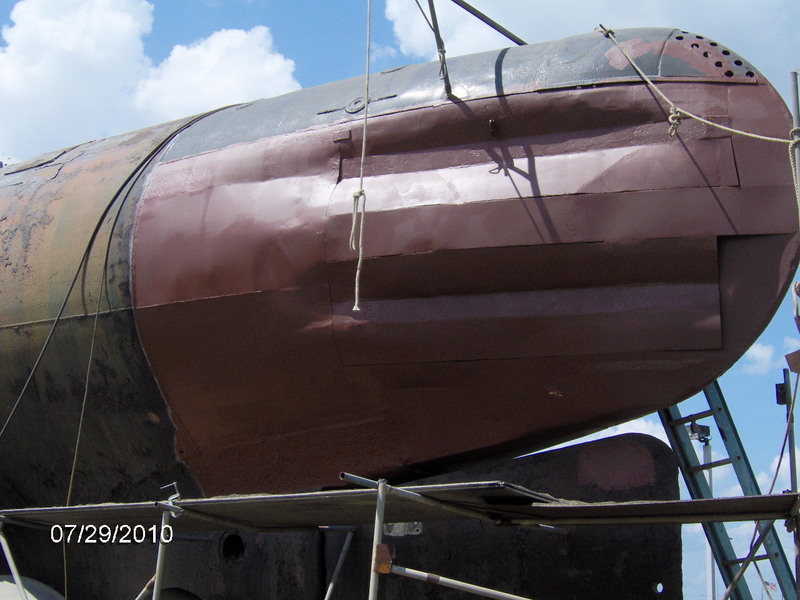 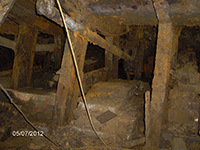 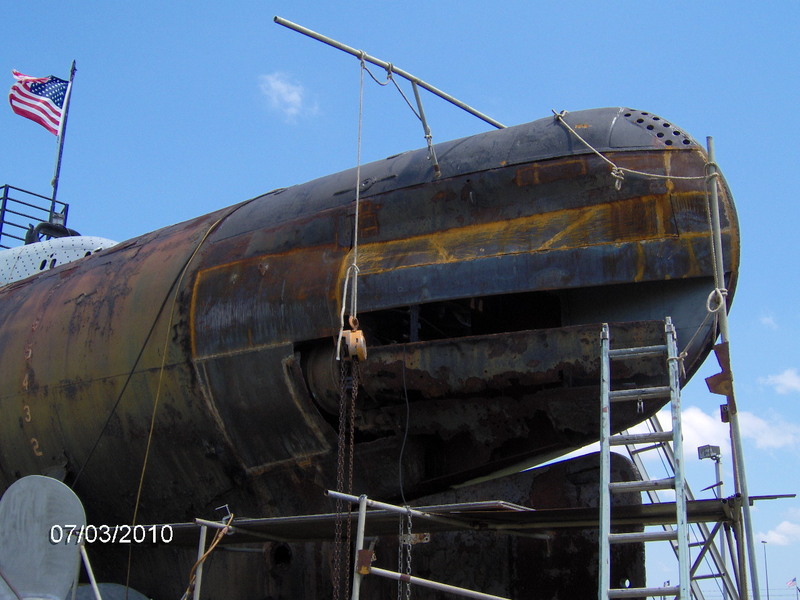 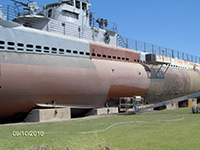 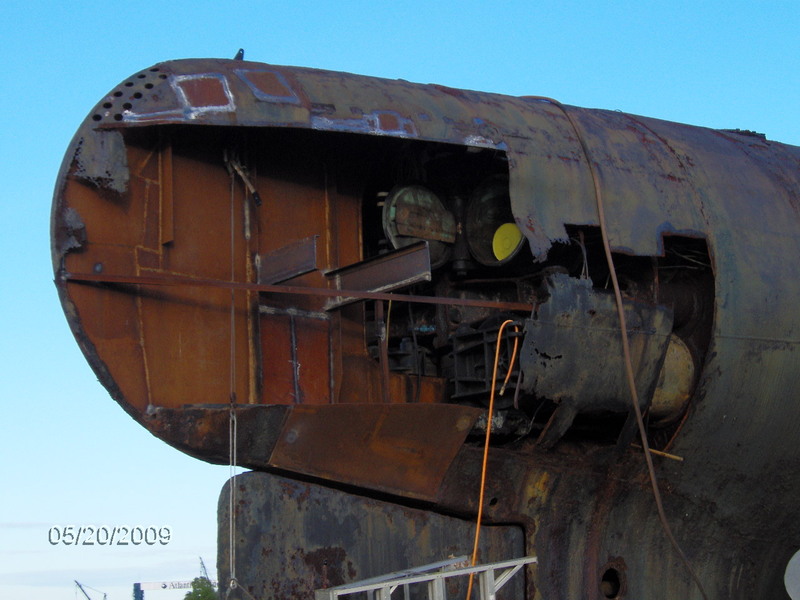 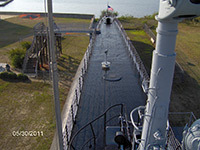 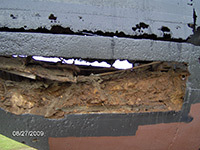 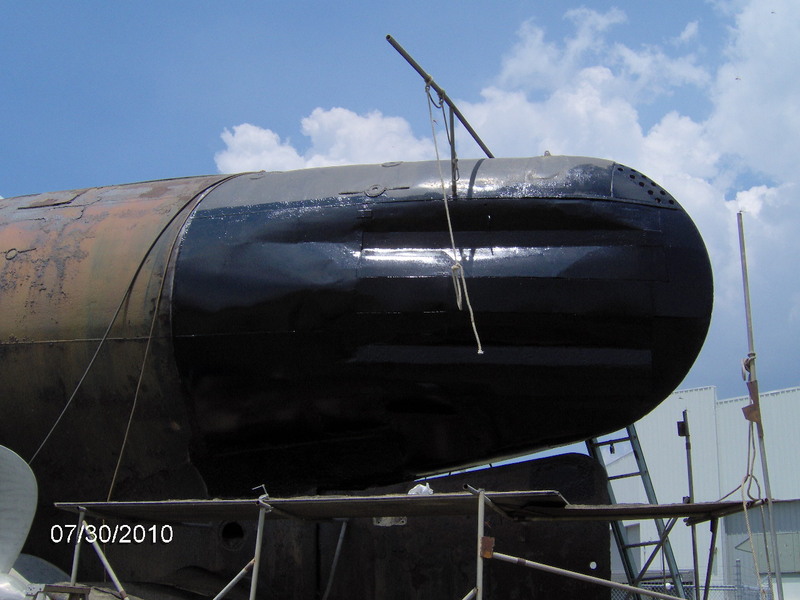 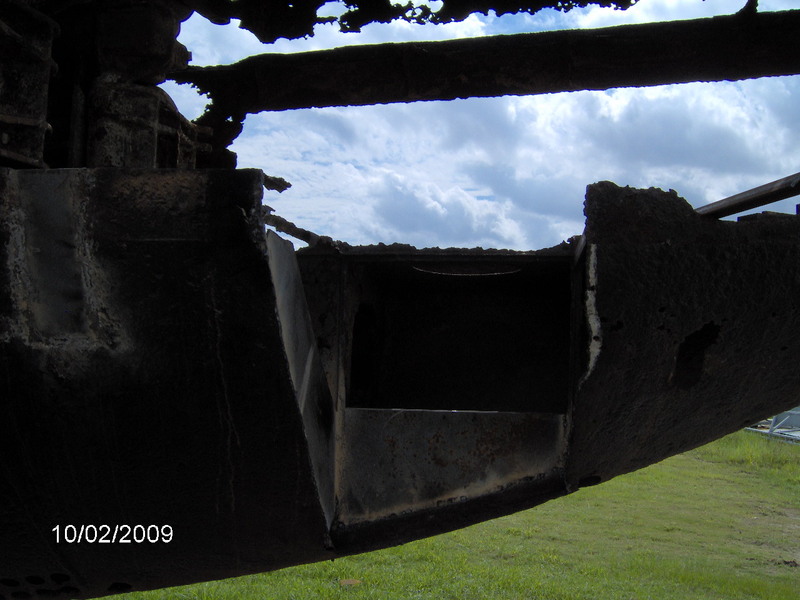 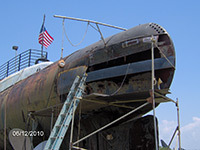 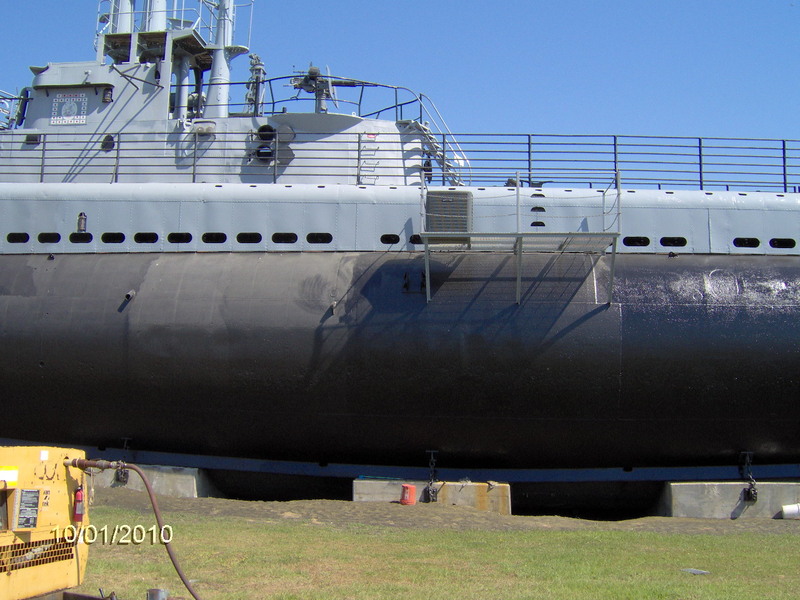 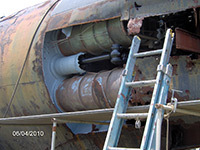 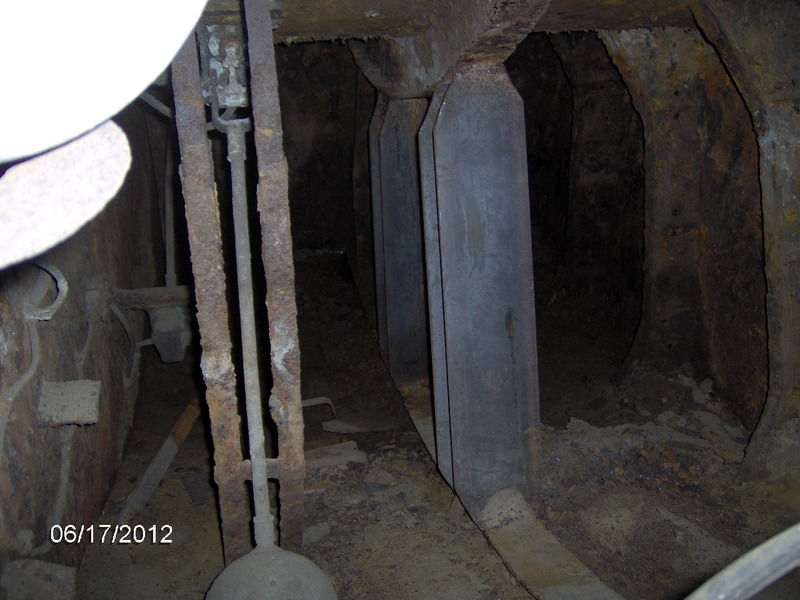 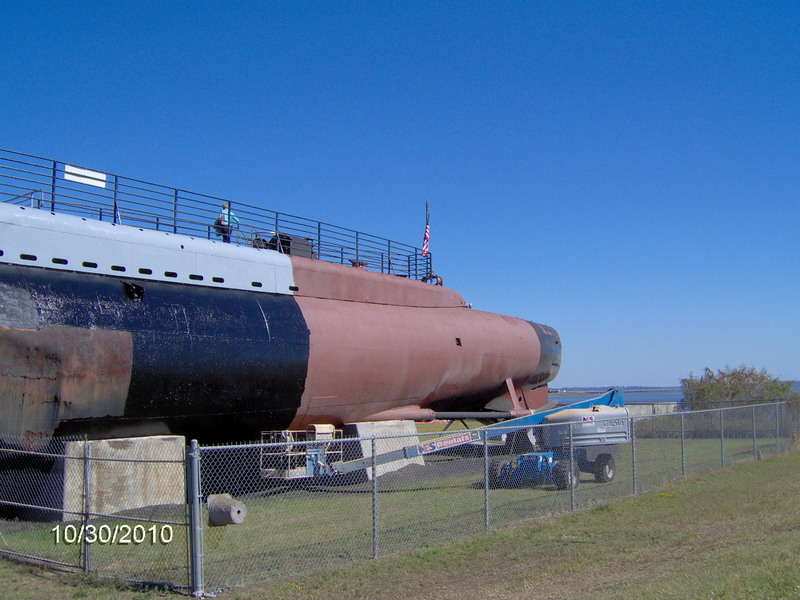 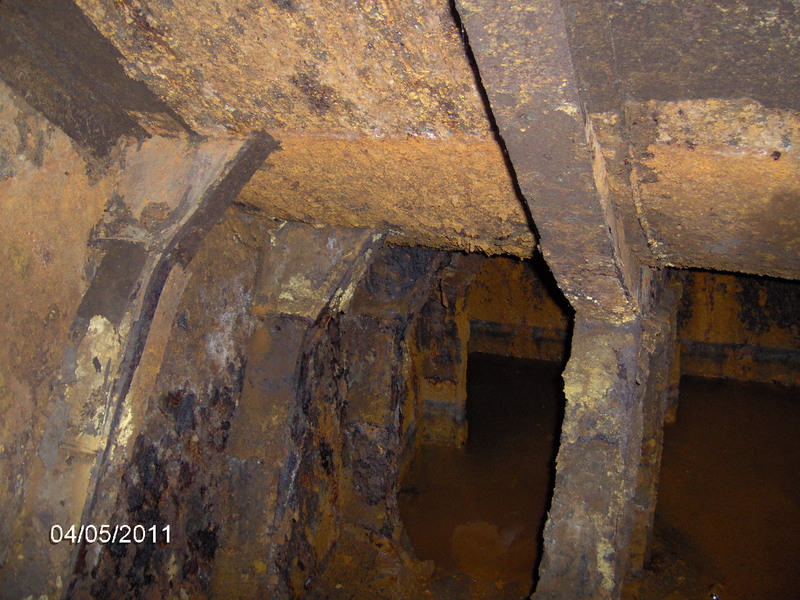 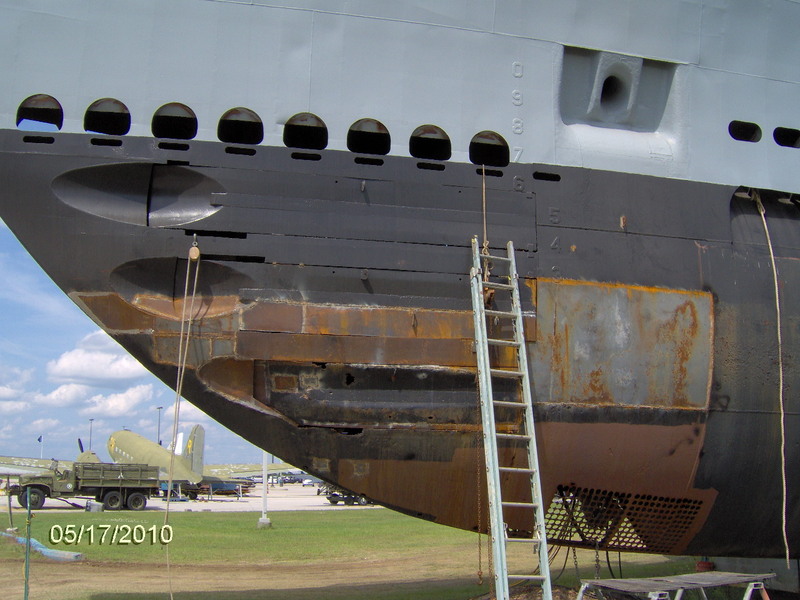 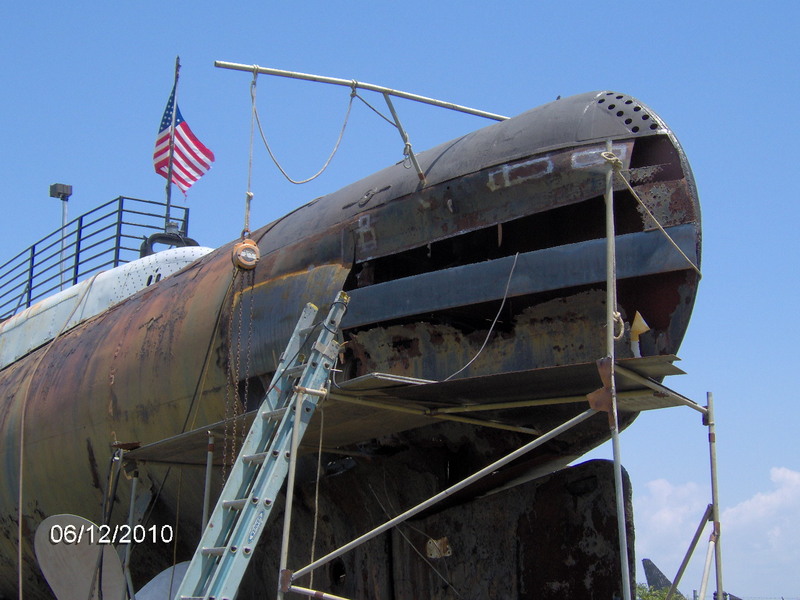 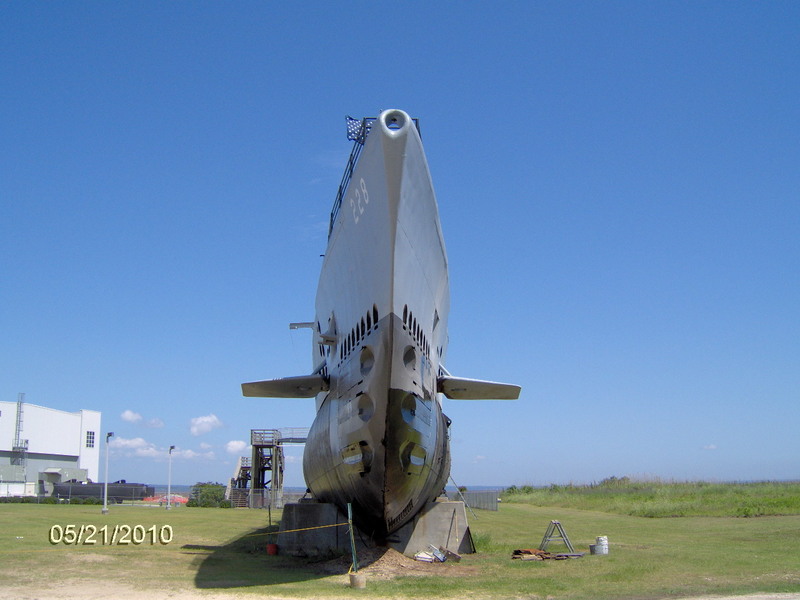 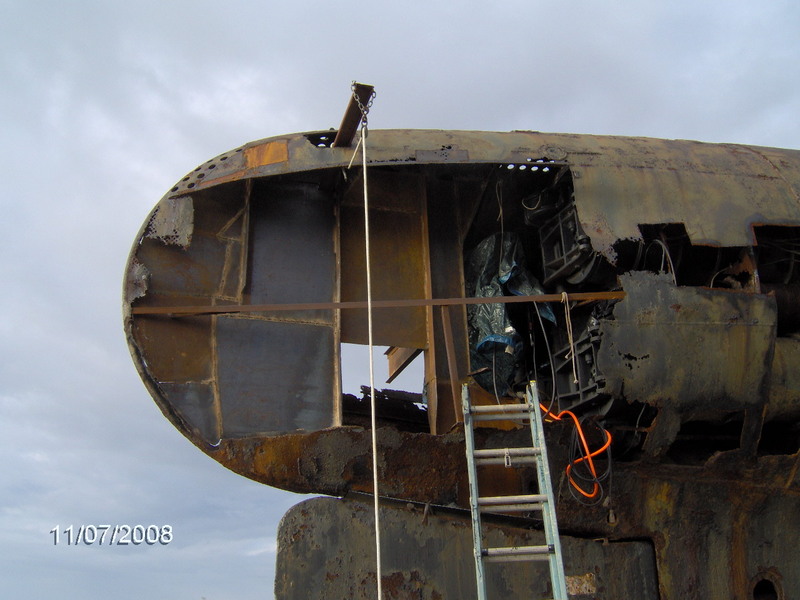 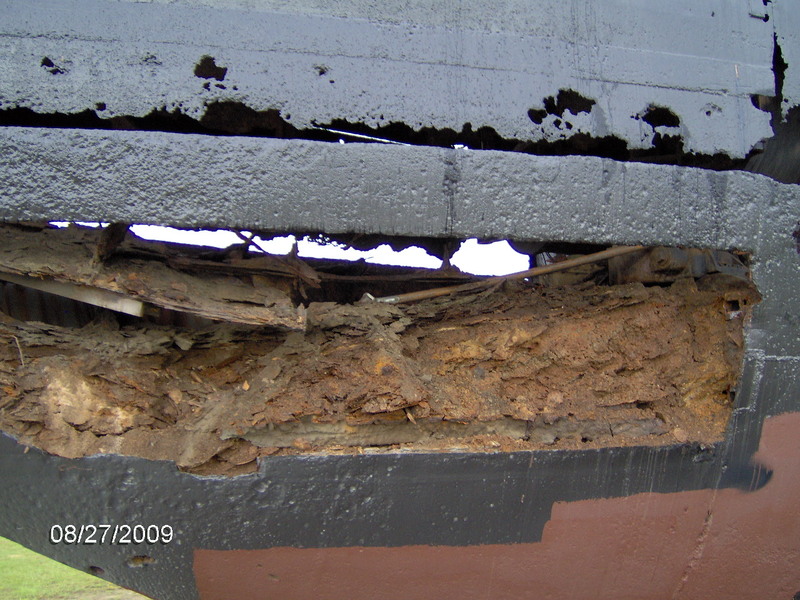 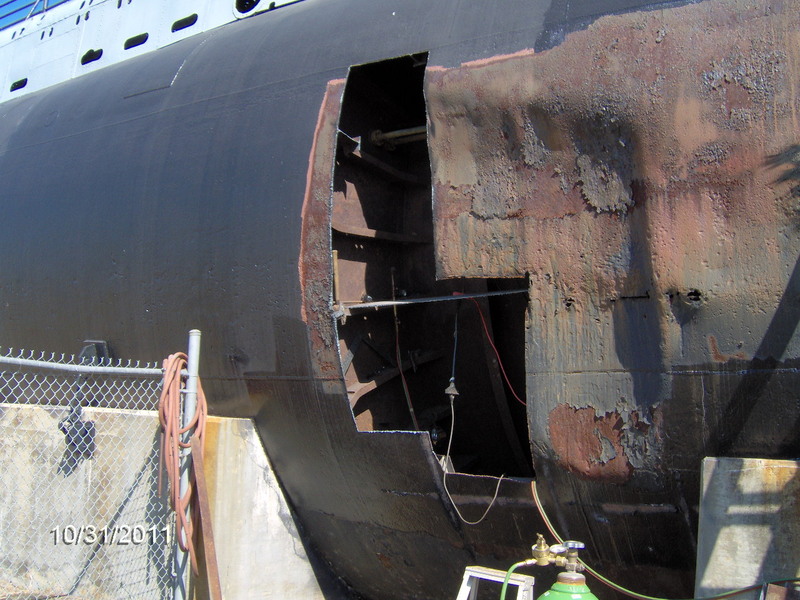 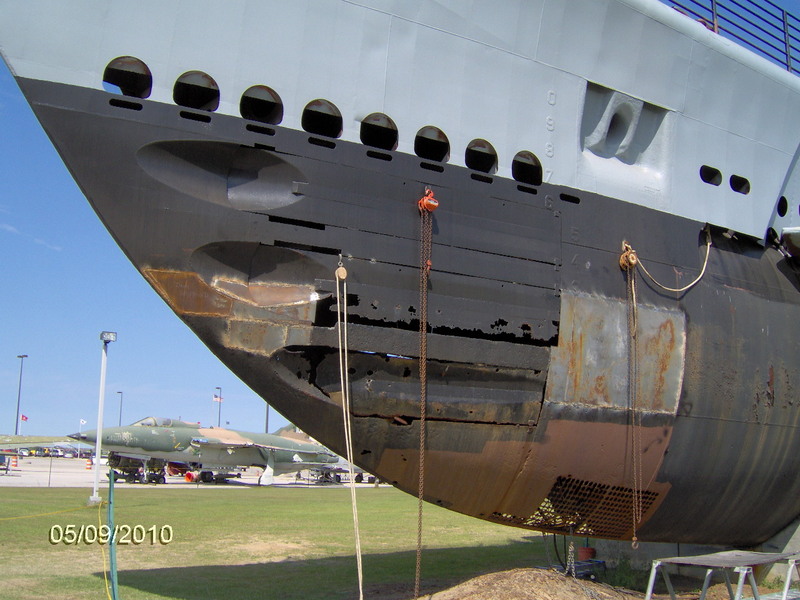 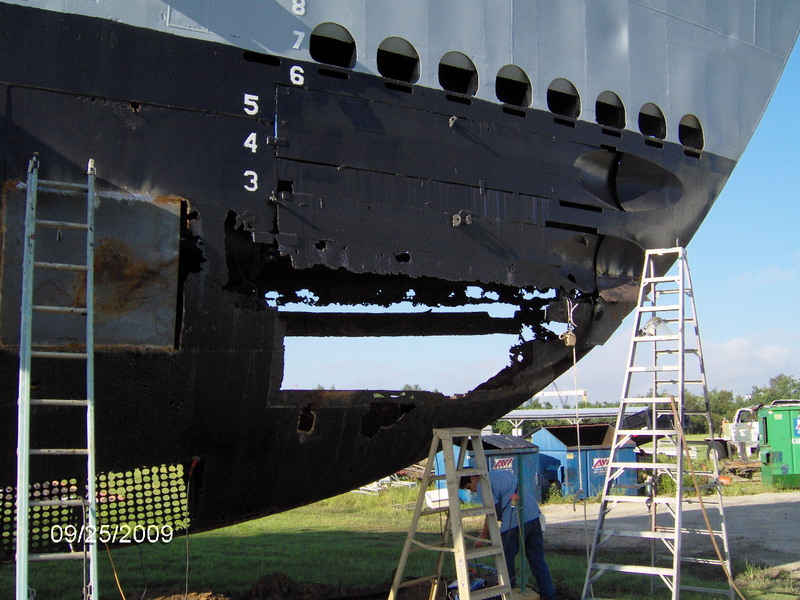 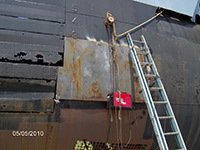 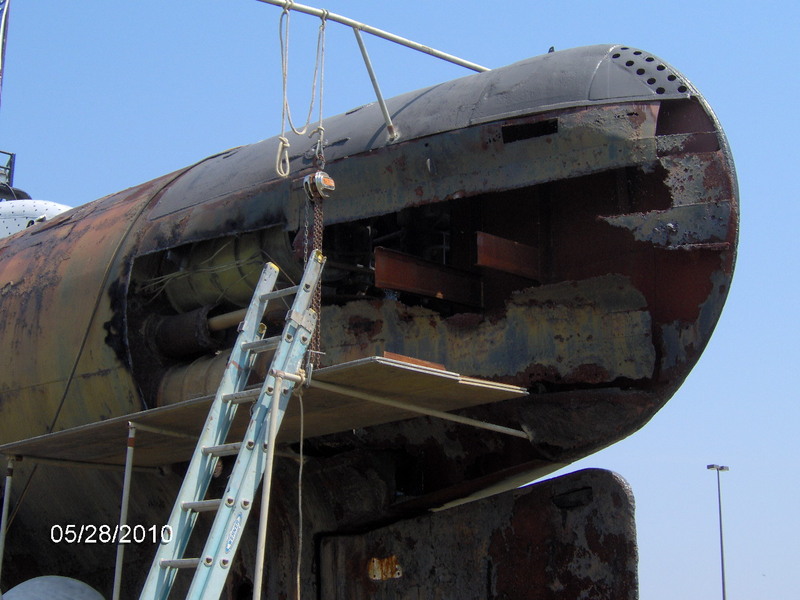 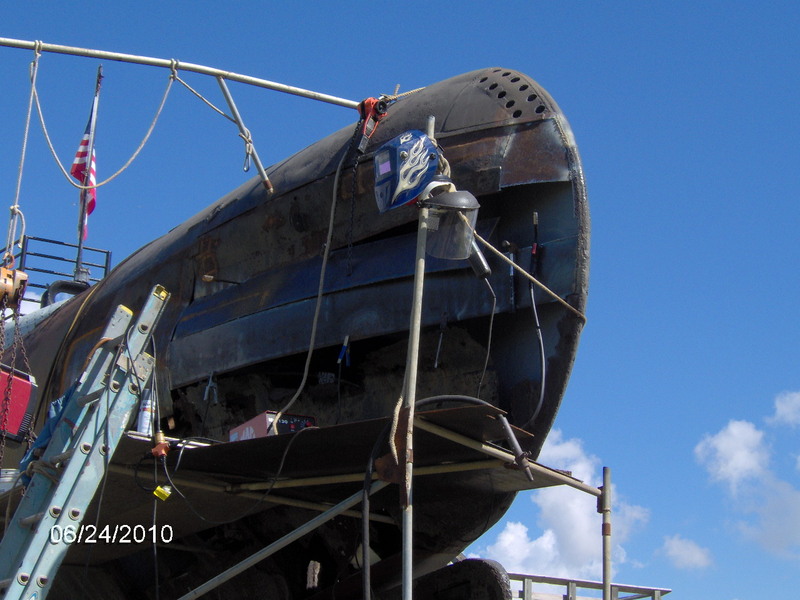 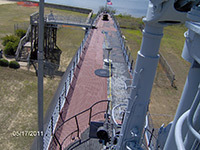 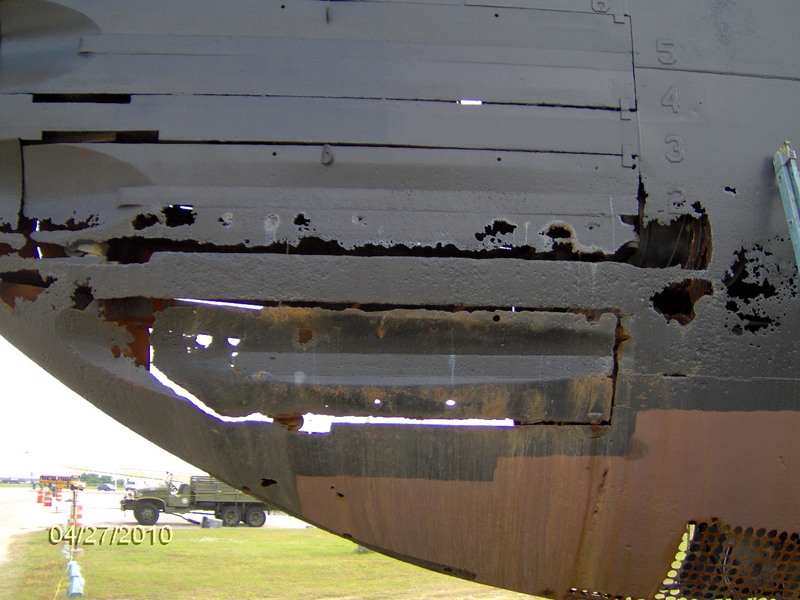 The photo on the left is what the port stern looked like as of 5/23/2009. 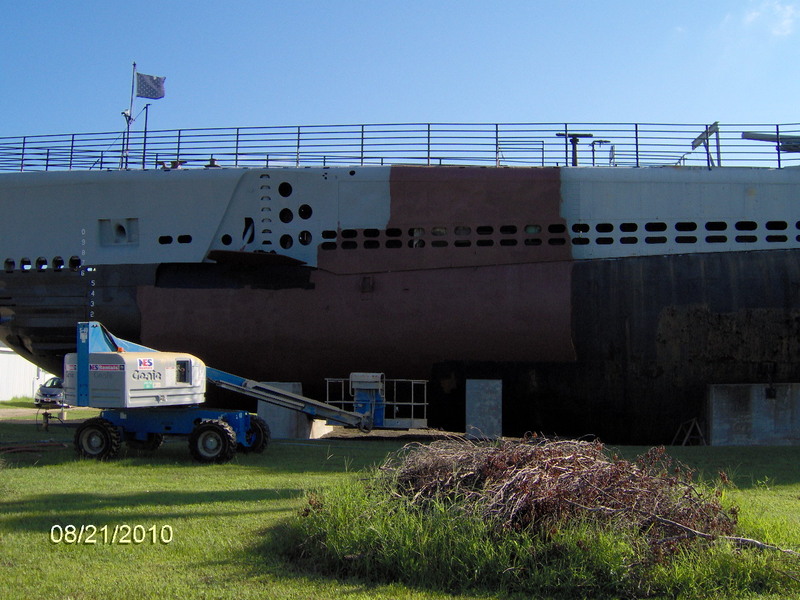 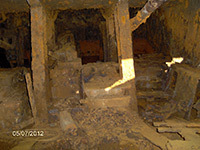 The photo on the right is what the port stern looks like now as of 5/28/2010. 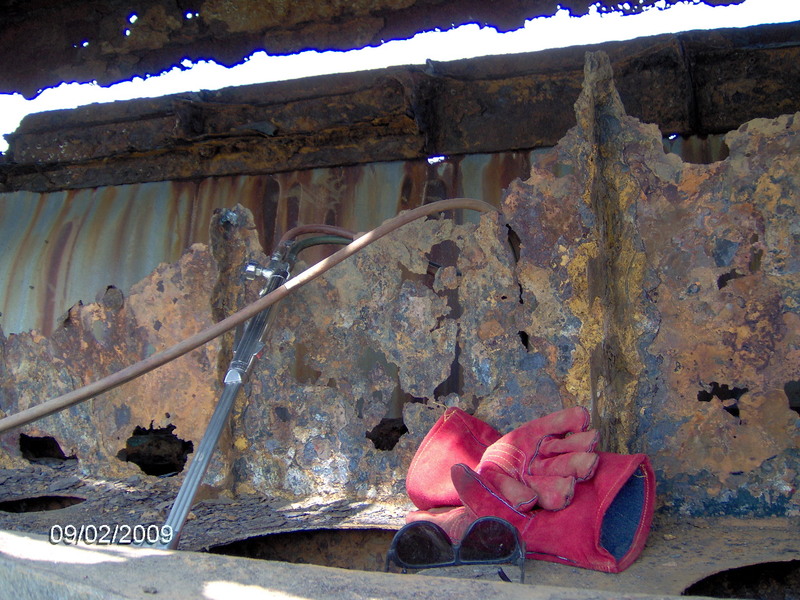 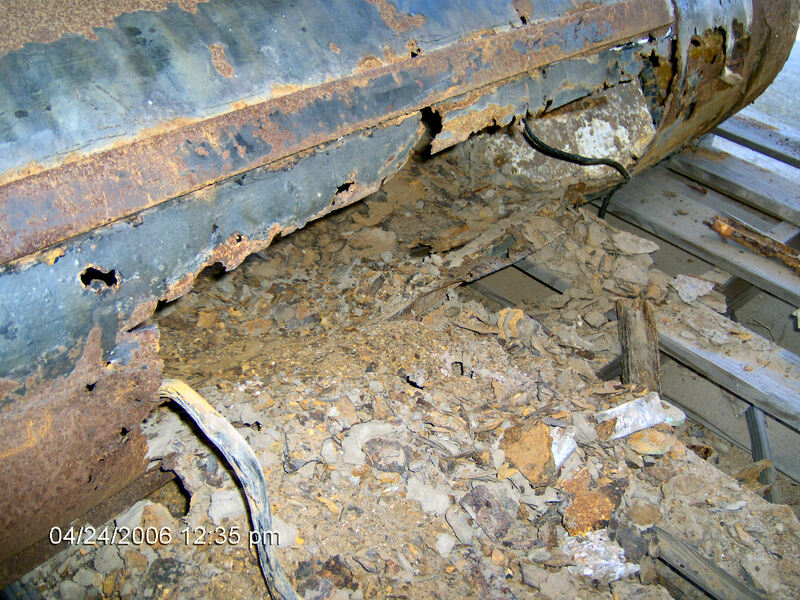 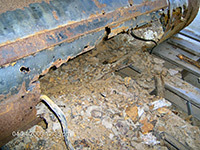 So much of the steel was so far gone with rust and deterioration that it could not be sandblasted or welded to. 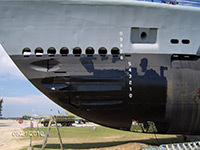 Update for 5/23, the bow has been completed. 5/9 through 5/20, more work on the port bow. More work going into the port bow. 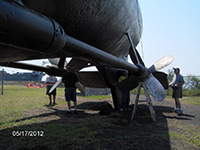 Spring arrives and they get to work on the port bow. 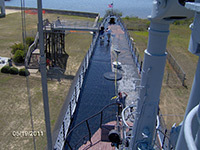 Tom and Lesley are finishing up the painting around officers' country. 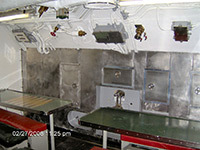 More interior painting during the winter. 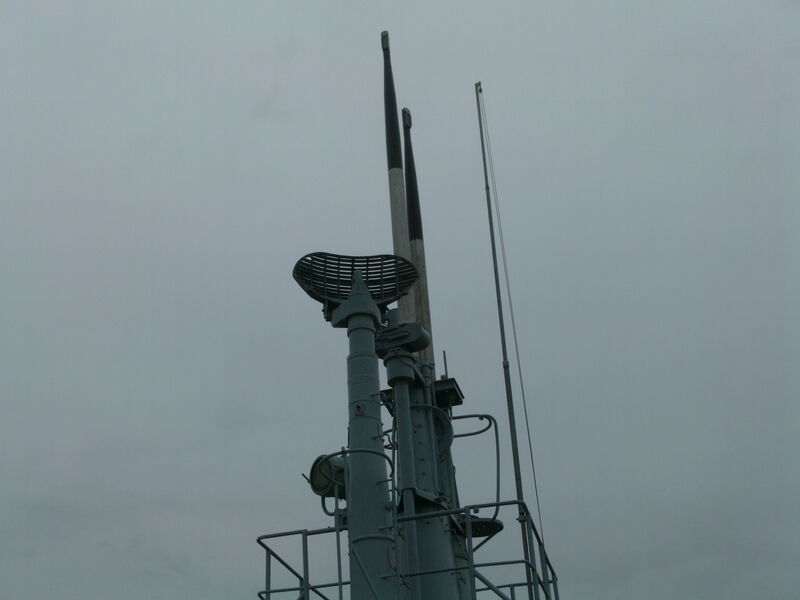 Tom and Lesley created a new battle flag during this cold month. They also got some painting in officers' country done. 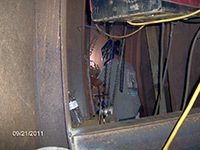 Here are photos from 11/6. 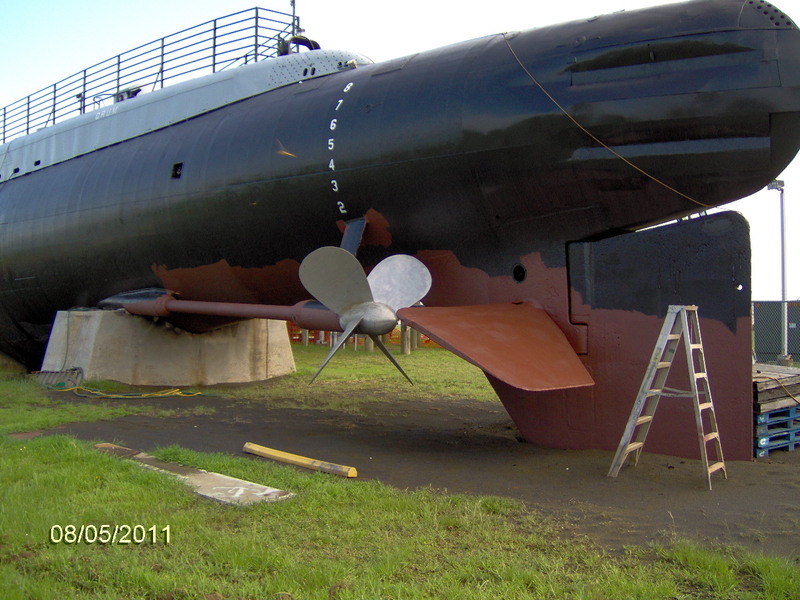 The starboard bow is almost complete except for the #5 outer shutter door. 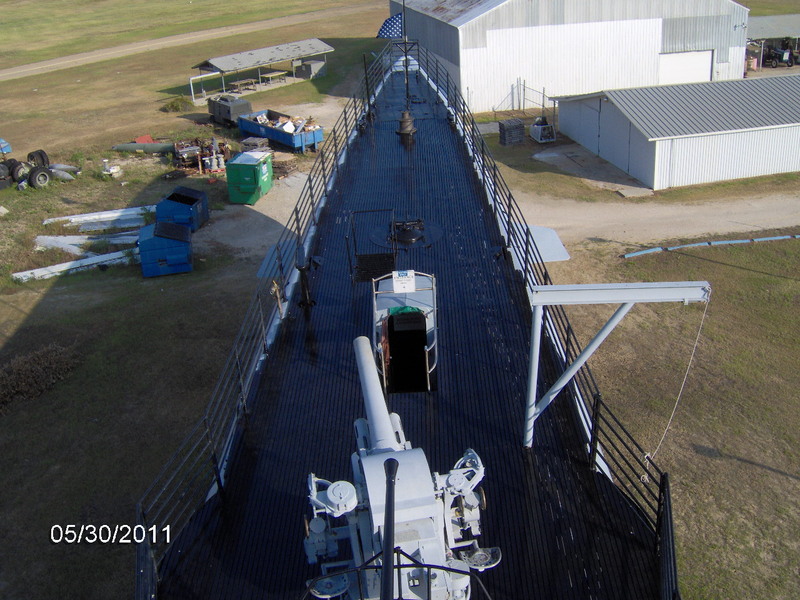 Here's how the starboard bow looked at the end of October. 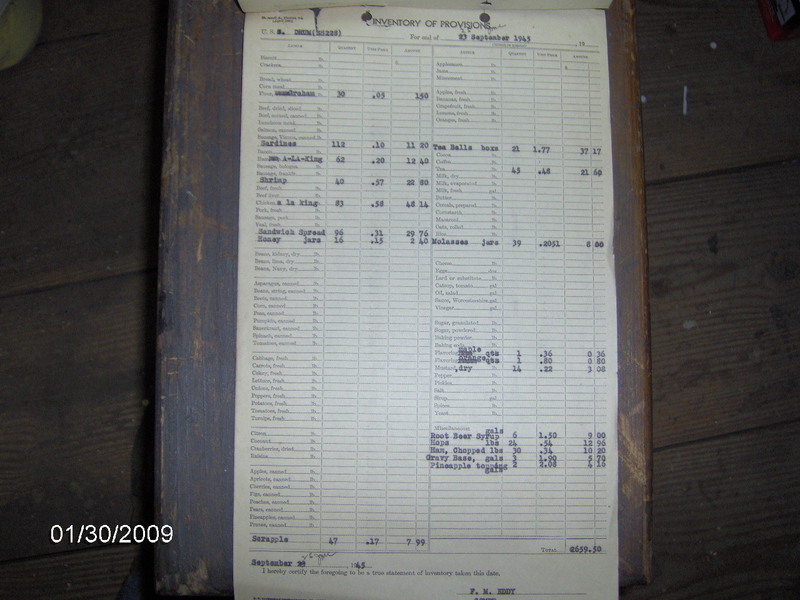 Note the draft numbers 0, 1, and 2. 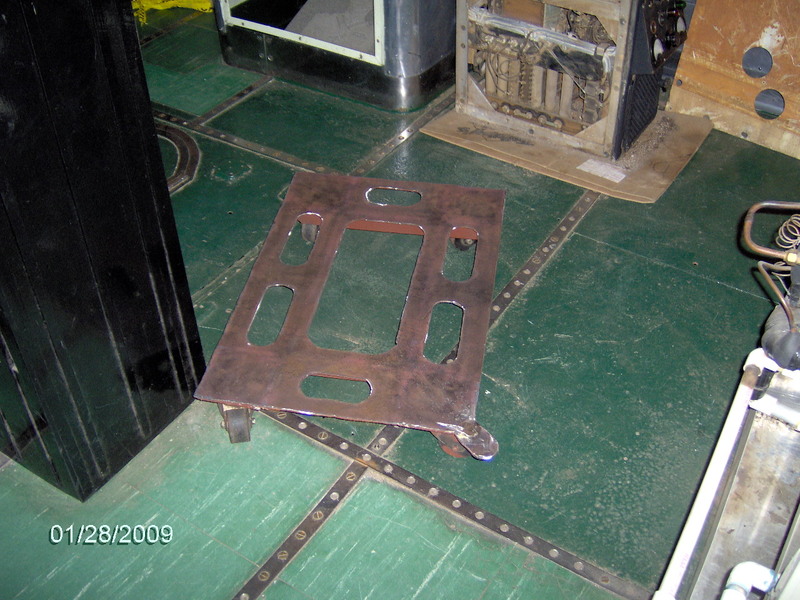 Lesley cut those out of 1/8" steel plate with a torch. Nice work! 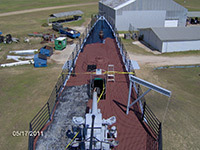 Update for 10/22, bow restoration still ongoing. 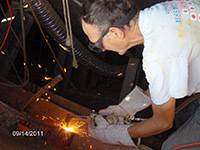 Tom and Lesley are getting ready to fabricate shutter doors. 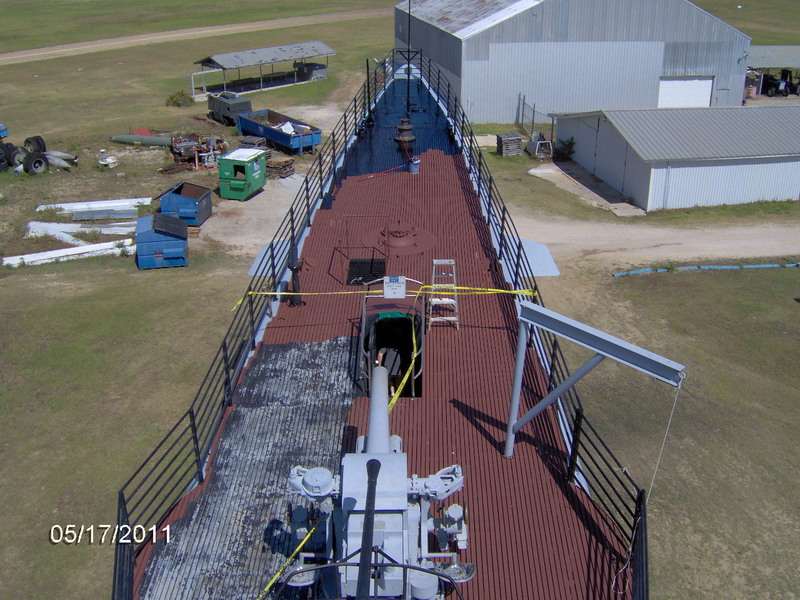 Update for 10/16, more bow restoration. 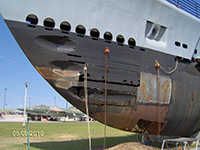 Bow restoration is ongoing. 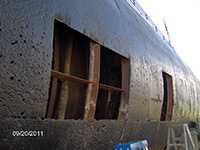 Tom said that they are having to replace almost all of the hull on the lower six feet of the starboard side and all of the structure inside for the lower ten feet as it's almost completely gone. 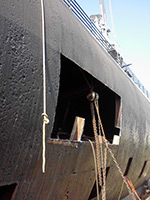 Bow restoration is now fully underway. 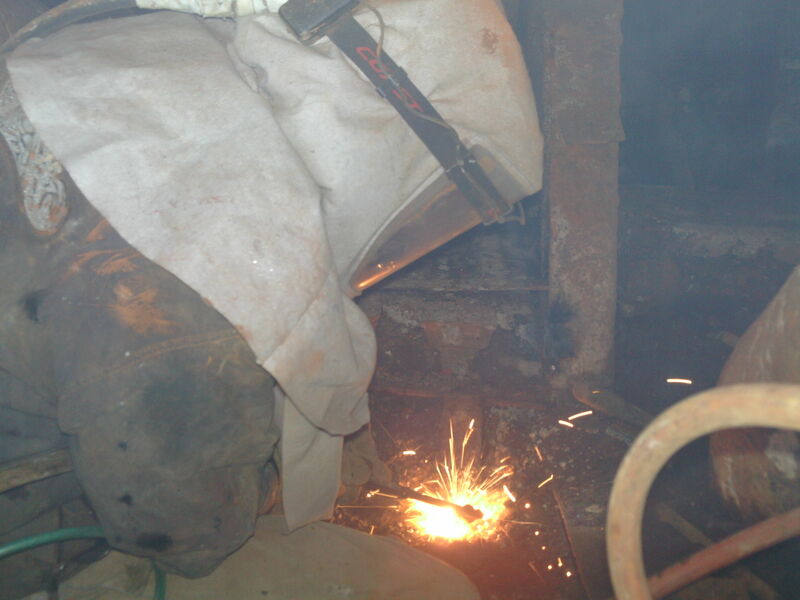 Tom and Lesley are having a hard time due to so much deterioration which is making it difficult in finding solid enough steel to weld to. 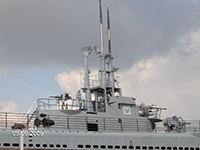 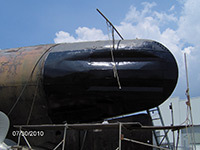 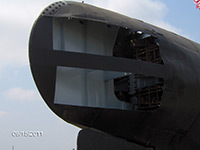 They have started replacing the outer hull with ¼ inch steel plate in small sections to maintain the curves and strength. Port side restoration is now in the early stages. 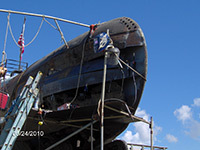 Bow restoration is also now in the early stages. 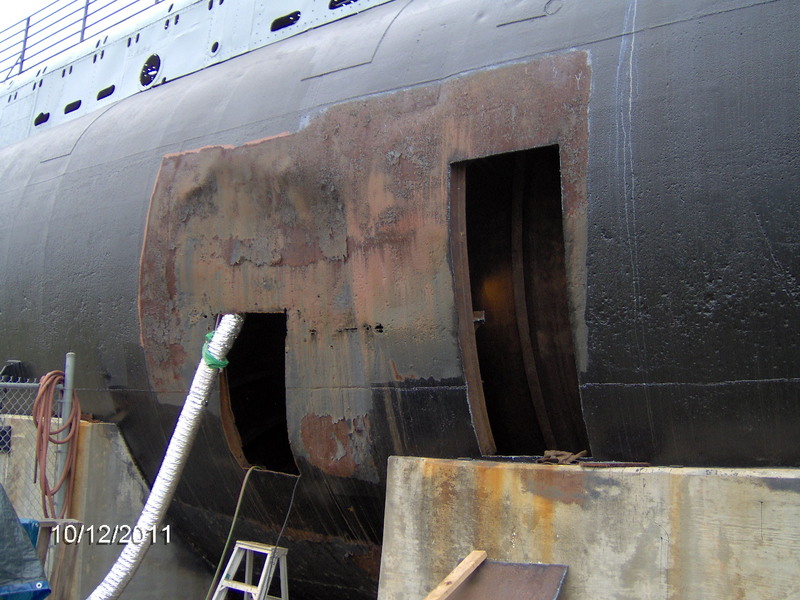 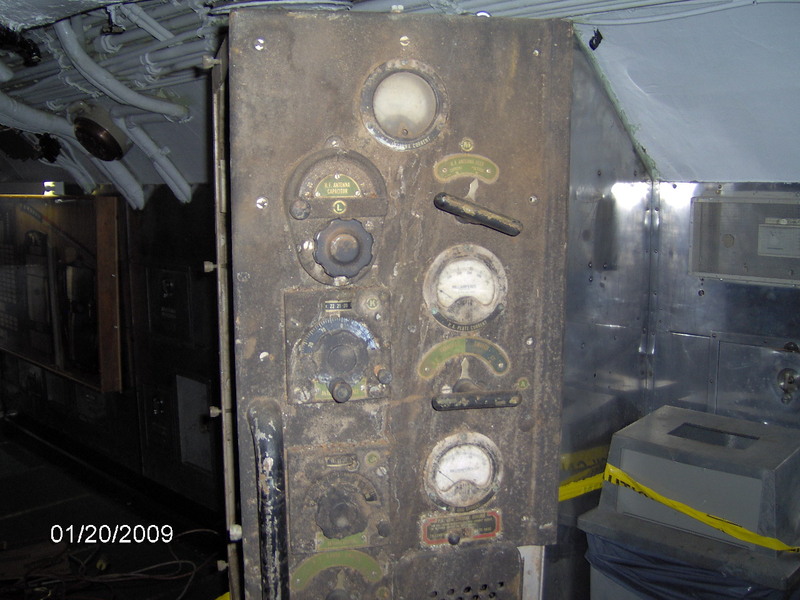 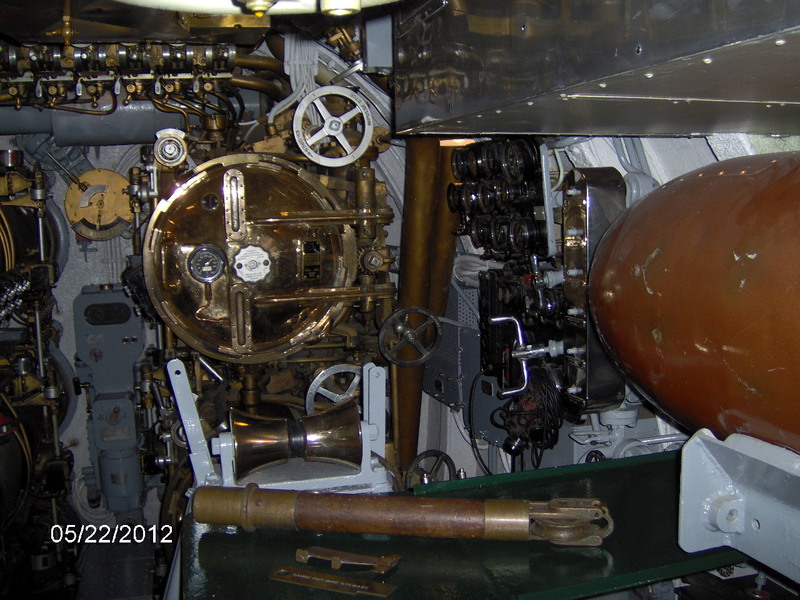 Take a look at what was behind the #6 shutter door of the bow! 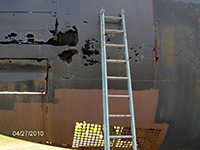 The starboard side of the stern has been painted. 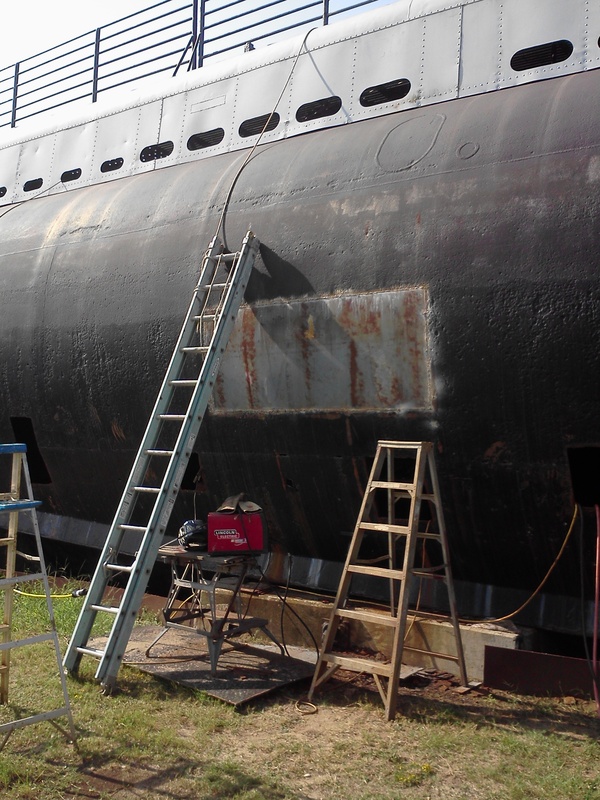 Cleaning, priming, and painting are underway of the starboard side now. 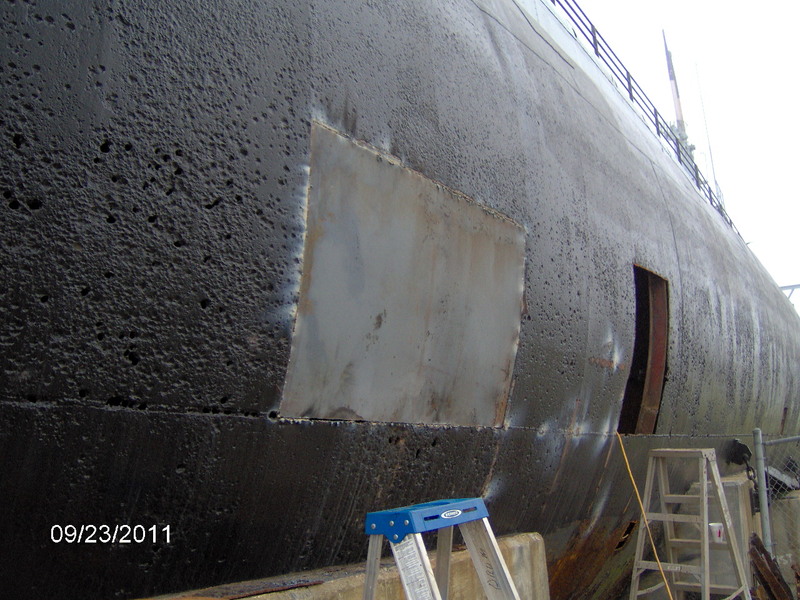 The starboard side of the stern has been primed. 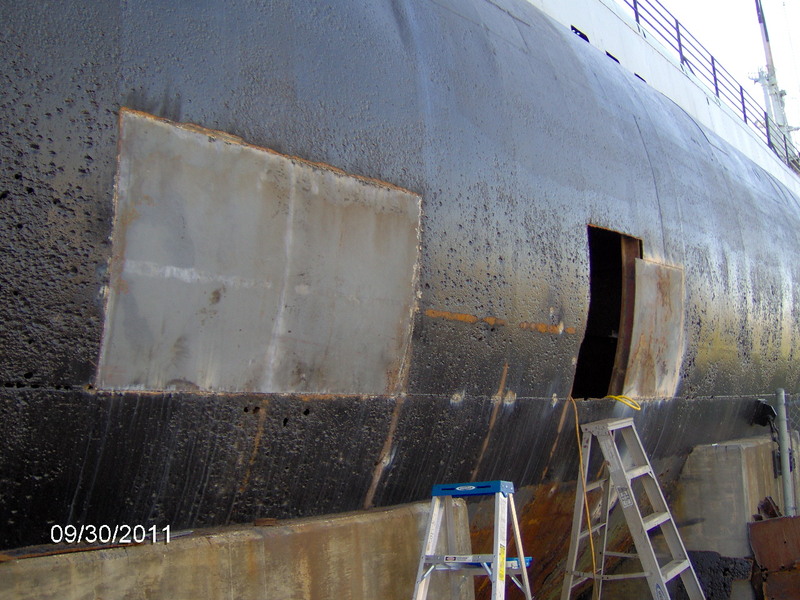 Further progess with sandblasting/priming/painting. 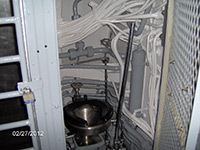 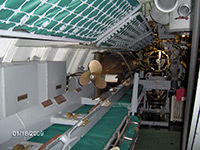 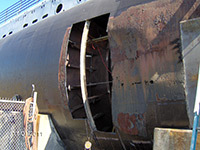 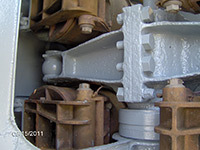 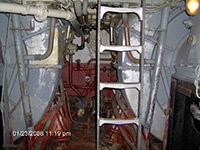 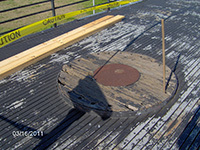 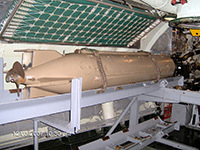 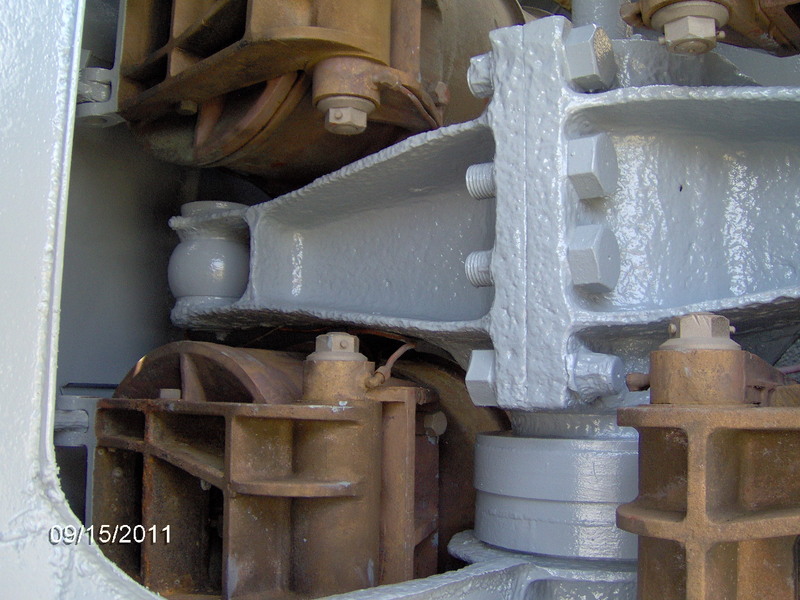 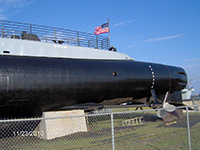 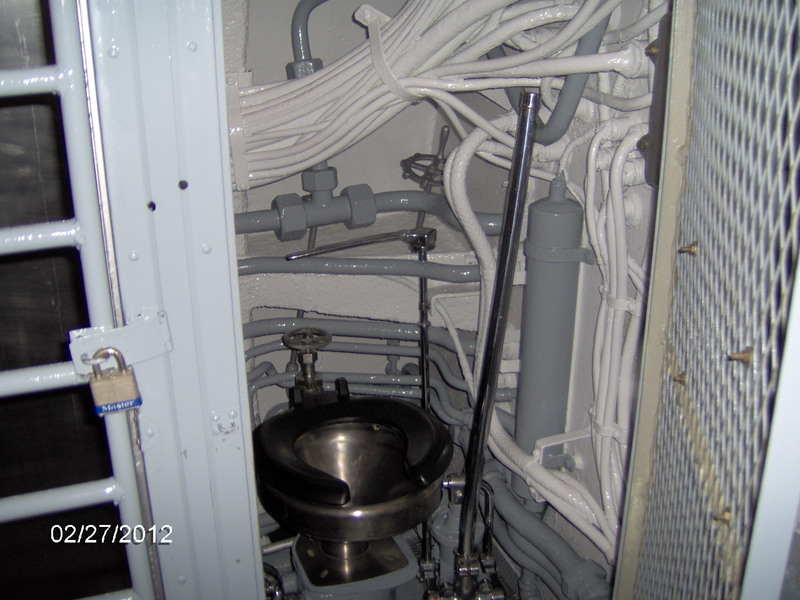 This is how the Drum looked for the 2009 USS Drum Reunion. 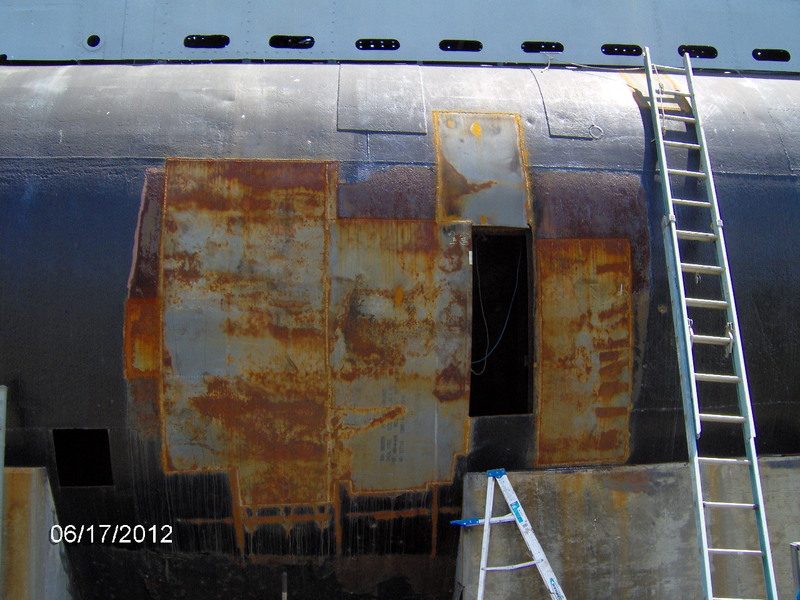 More restoration and priming/painting of the starboard side and bow. 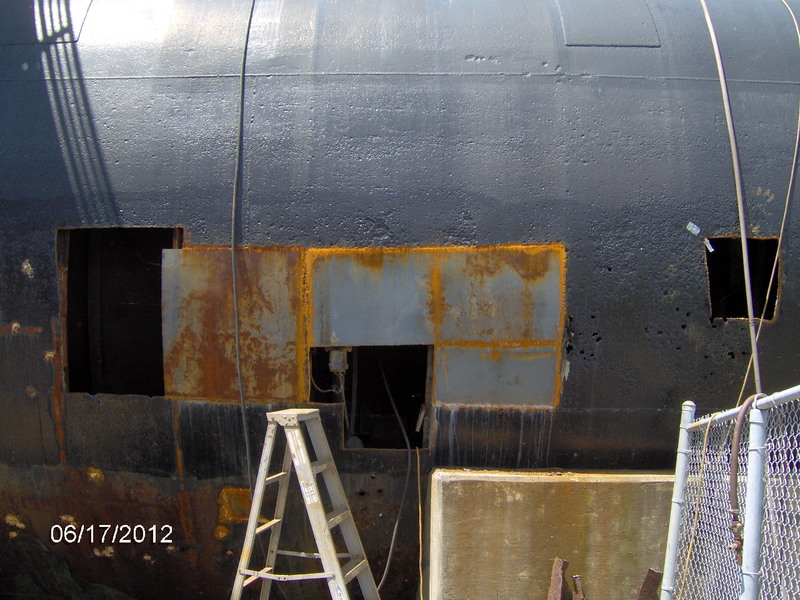 More stern restoration and priming/painting of the starboard side. 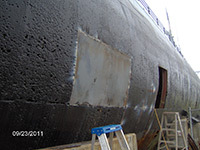 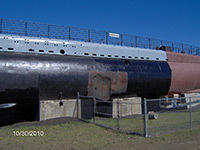 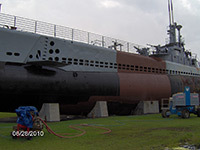 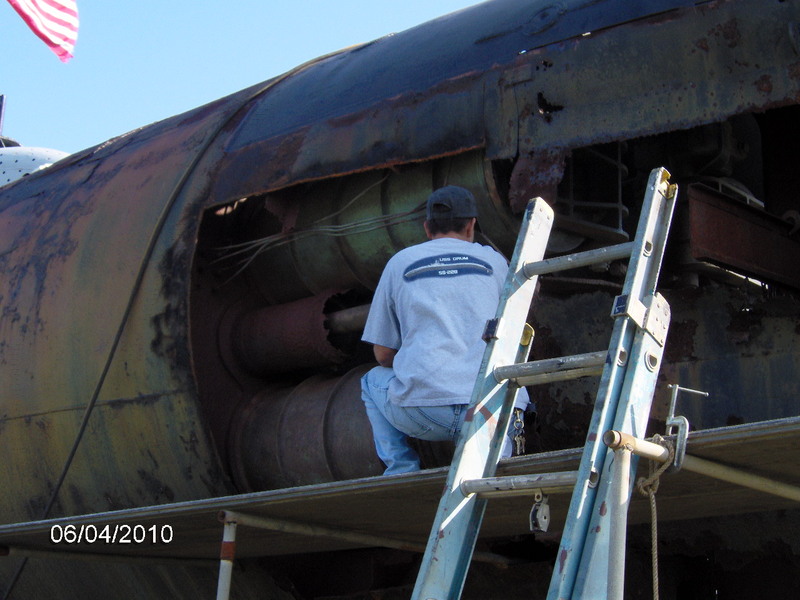 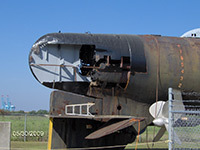 Stern restoration picks back up where it was left off in November, 2008. Cleaned, primed, and painted the periscope shears. 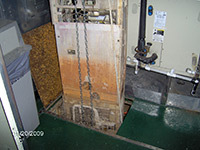 Below you see a before photo, a during photo, and an after photo. 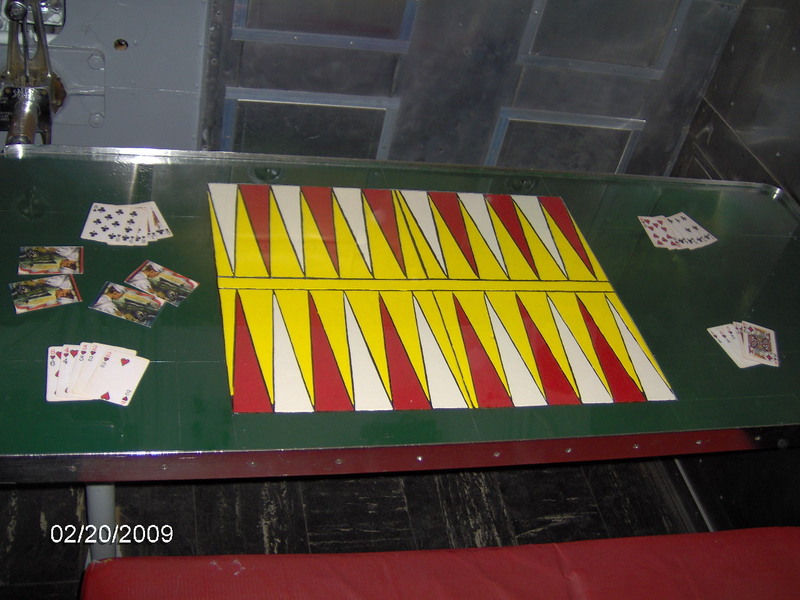 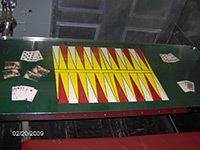 Restored table in the crew's mess. 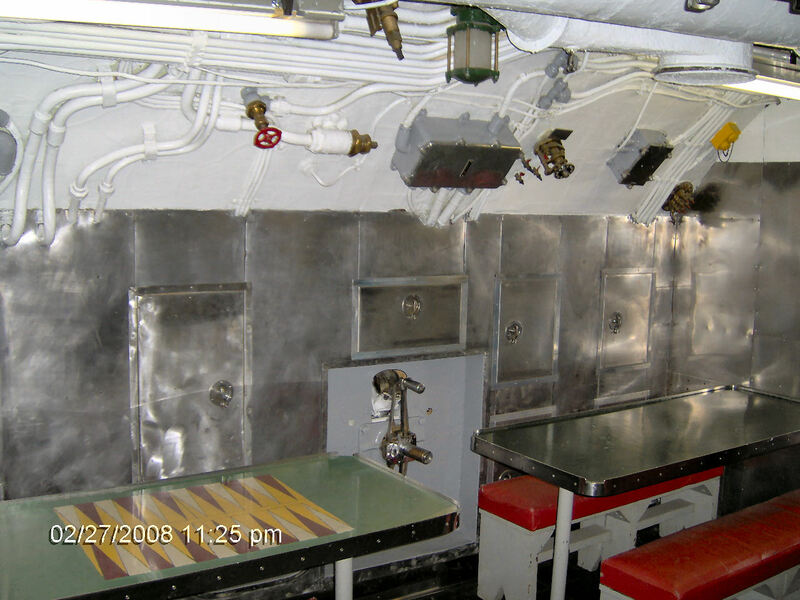 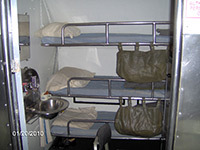 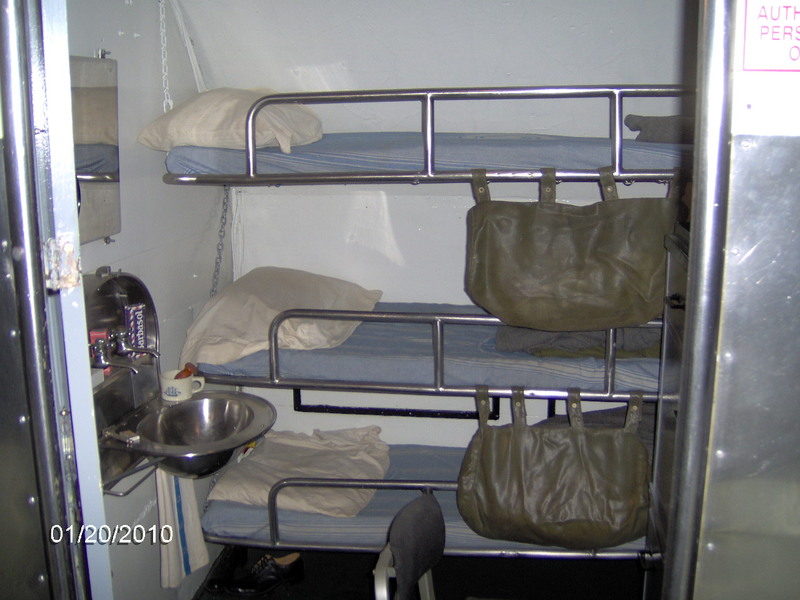 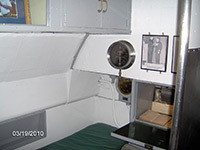 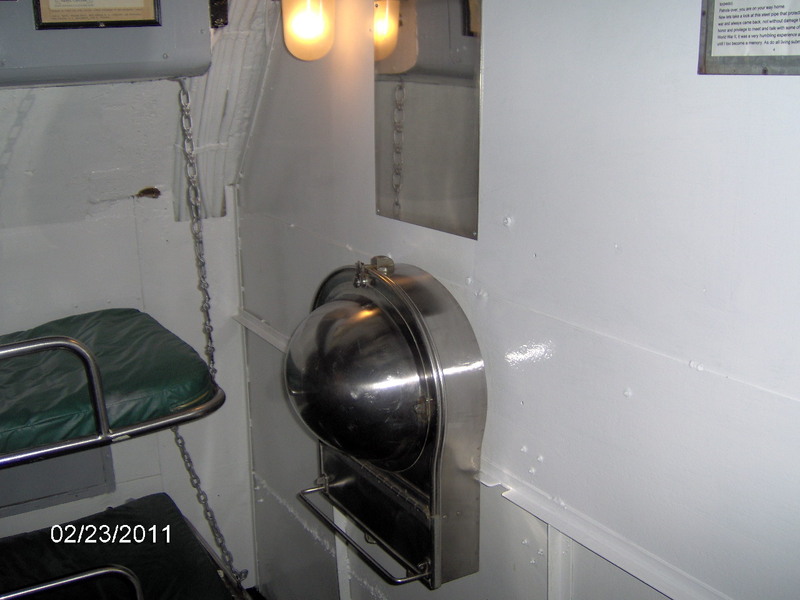 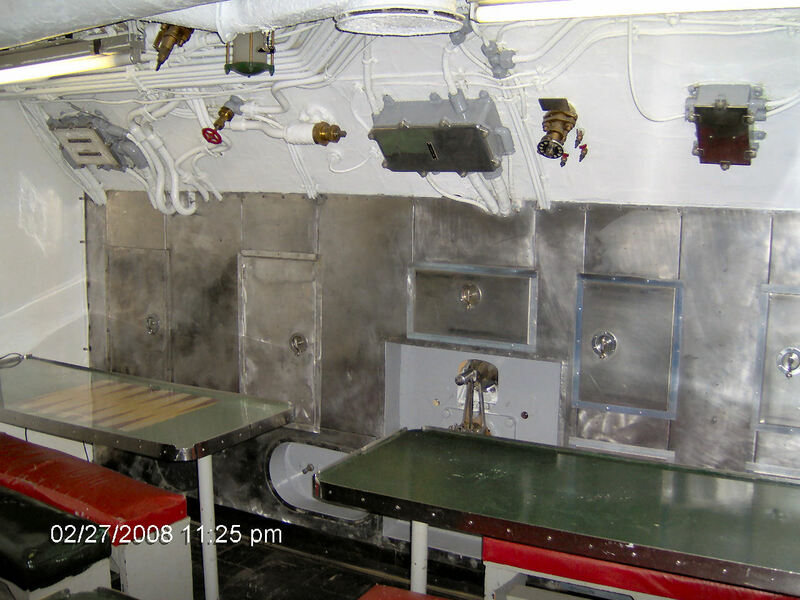 New bunks in aft torpedo room. 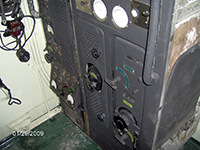 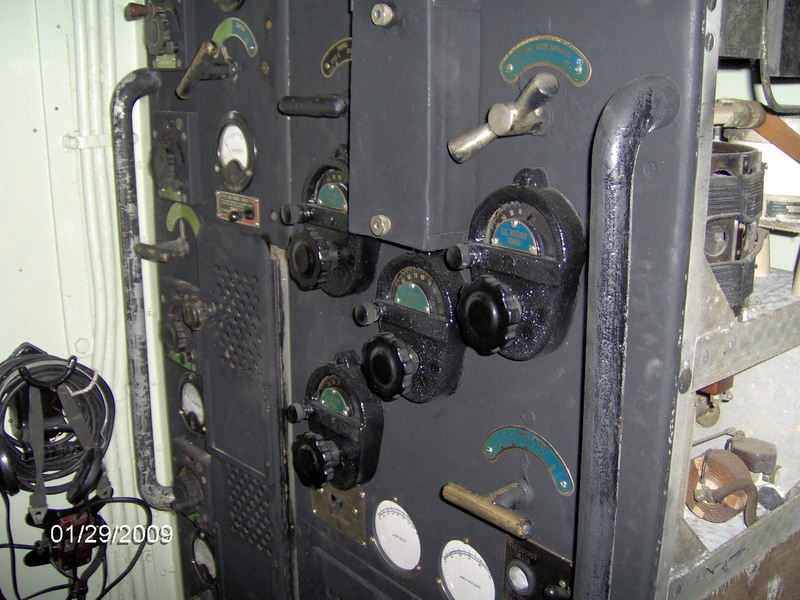 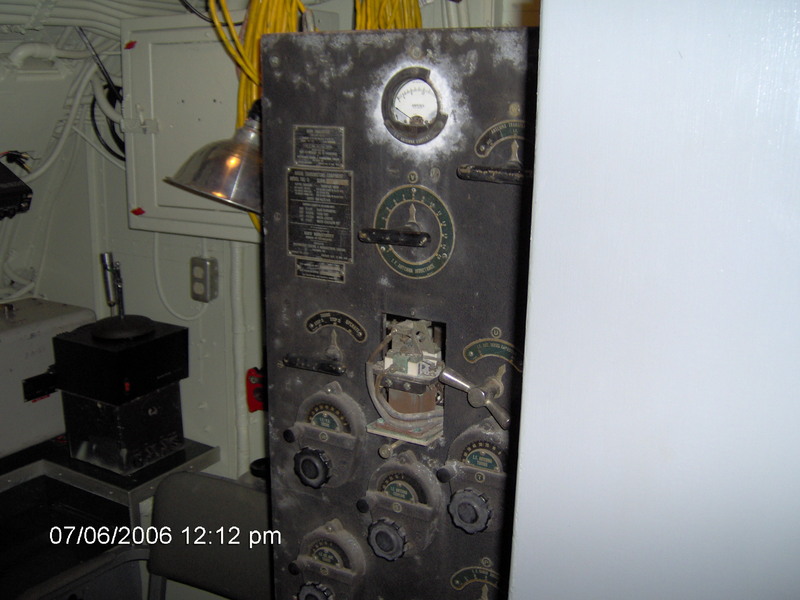 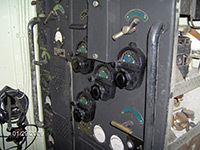 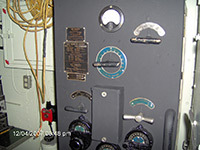 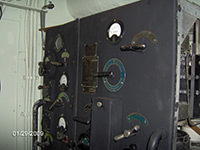 Restoration of TBL radio transmitter. New mounting plate built for TBL radio transmitter with original rollers. 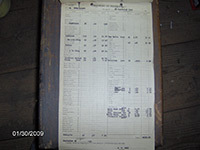 Food order discovered from September of 1945, believed to be final load out before leaving Pearl Harbor for home after the war ended. Alabama United States Submarine Veterans of WWII (USSVWWII) donate $3,000 for an air compressor! 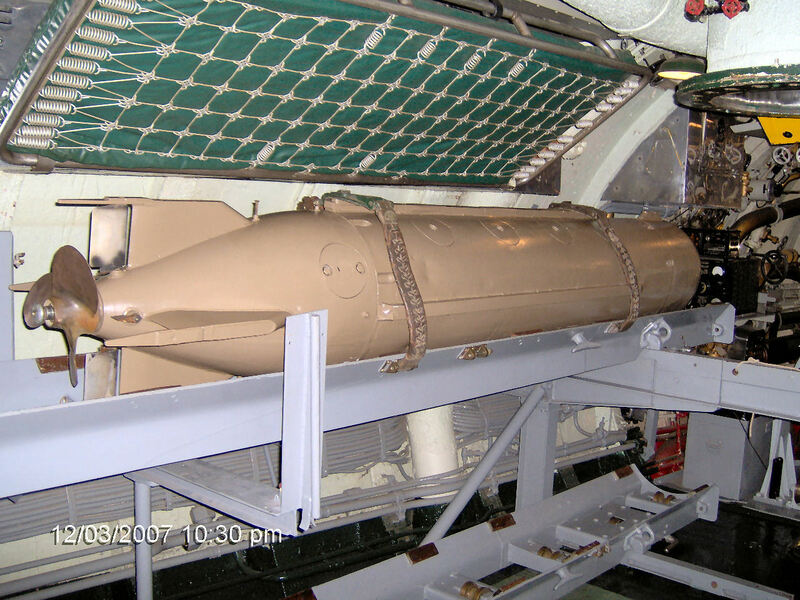 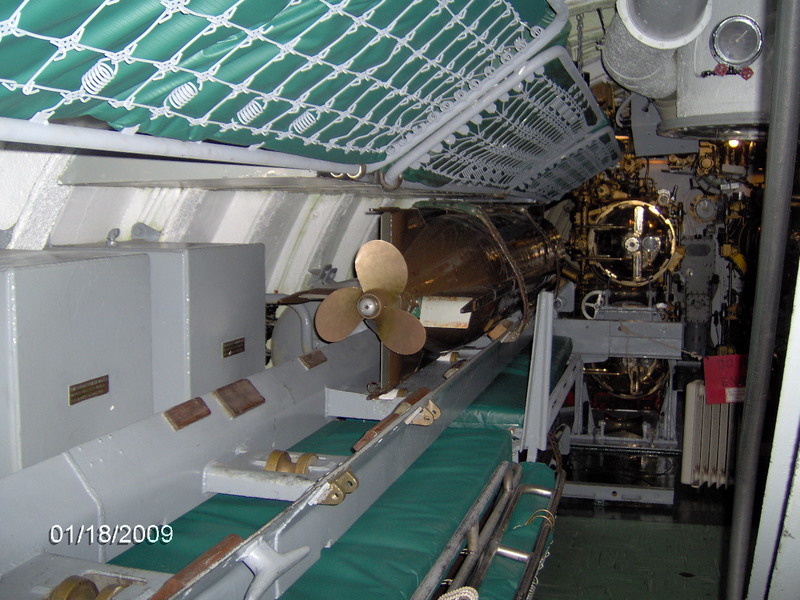 Mark 27, electric, passive acoustic homing torpedo aka "Cutie"